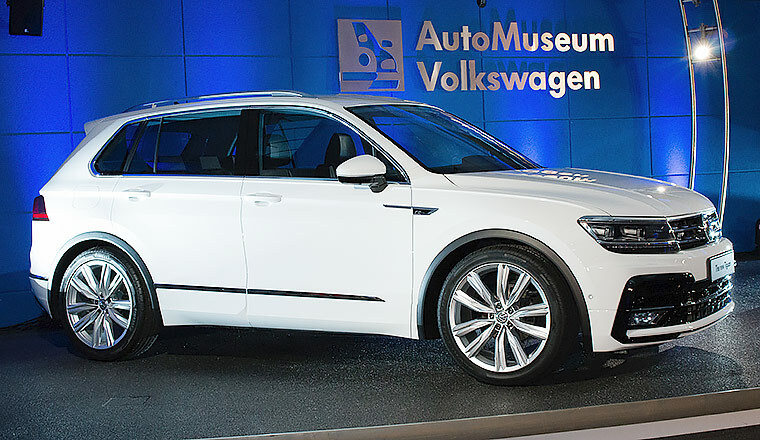 2015 was an eventful year for the AutoMuseum Volkswagen. Read up on what happened. Spectacular latecomer to the current special exhibition. 15 December 2015. A spectacular latecomer to the current special exhibition "River Deep - Mountain High." has just arrived at the Volkswagen AutoMuseum. 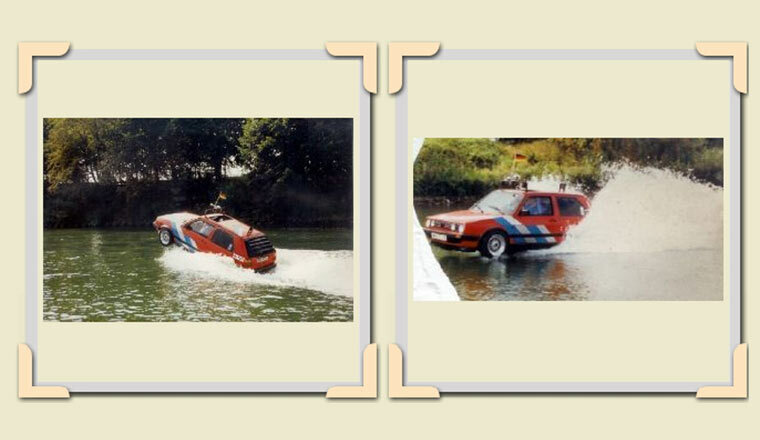 It is an amphibious car built for the GTI Meet at Lake Wörthersee in 1988 with upwards opening wing doors inspired by the Golf II 16V GTI. However, it cannot drive on road since the two-seater water-going Golf is mounted on two pontoons. 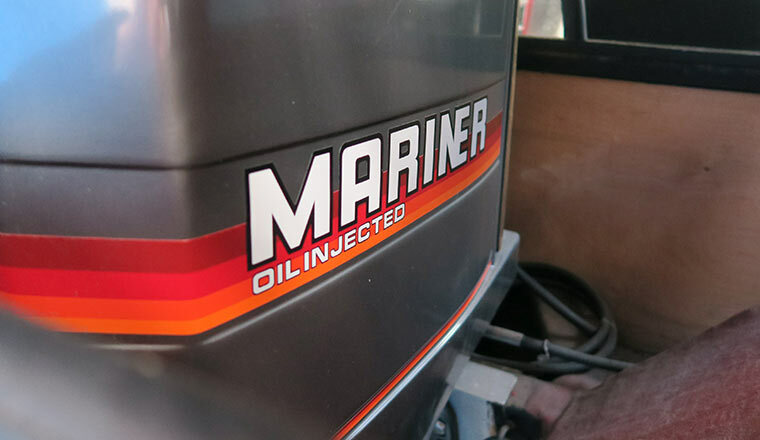 A two-stroke 6-cylinder "Mariner" engine and a ship's propeller between the two pontoons power the car over water at speeds up to 70 km/h. 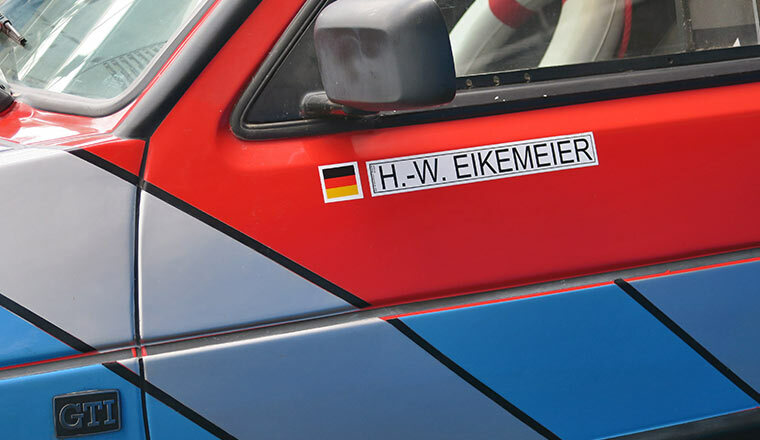 The car was kindly loaned by Heinz-Werner Eikemeier from Hannover. 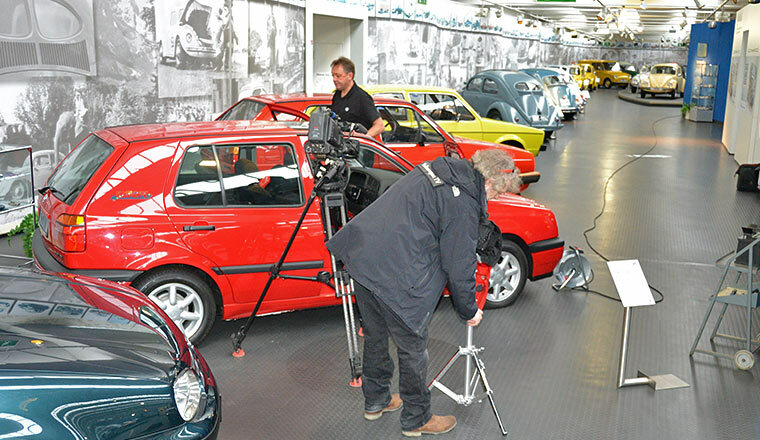 Volkswagen After Sales shoots training film at the AutoMuseum. 8 December 2015. 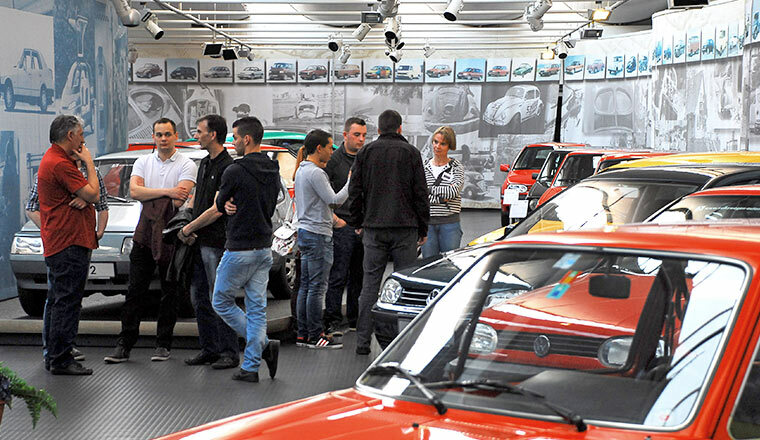 Once again the Volkswagen AutoMuseum is the fitting location for colleagues from Volkswagen After Sales. 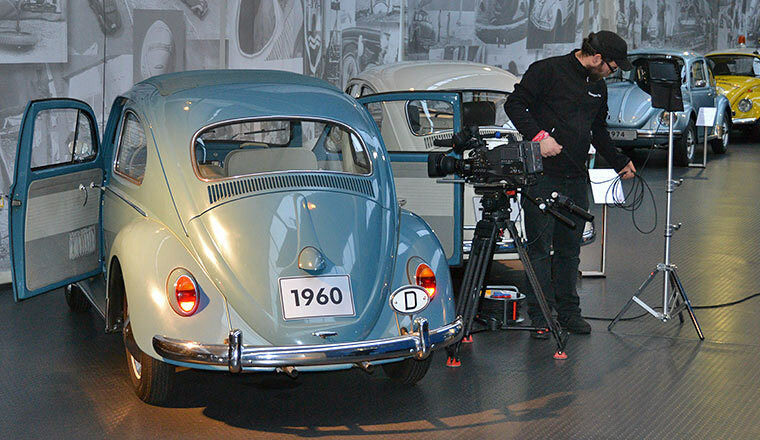 Within the framework of qualification schemes, training films are regularly produced for employees of the Volkswagen sales organisation. These films often show the historical development of a model or key parts in order to portray and compare the technical progress and innovations between then and now. 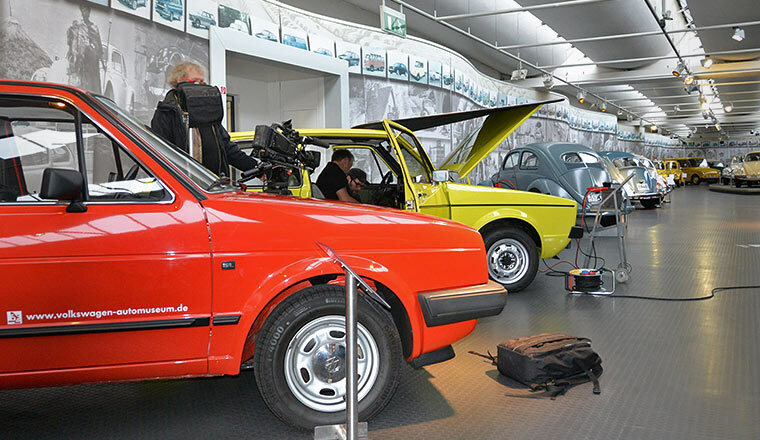 This time, the team from Volkswagen TV filmed historic radios – starting with the Beetle and continuing through to the Golf III radio with cassette. It's a good thing that such devices are archived at the AutoMuseum. 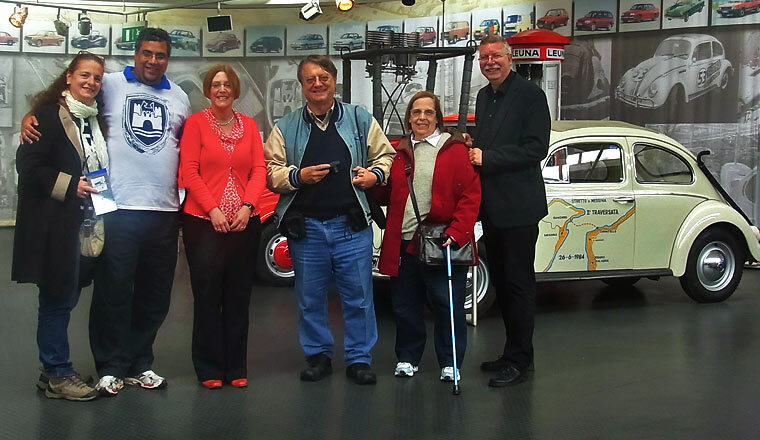 Visit by the Peruvian Consul General to the AutoMuseum. 7 December 2015. 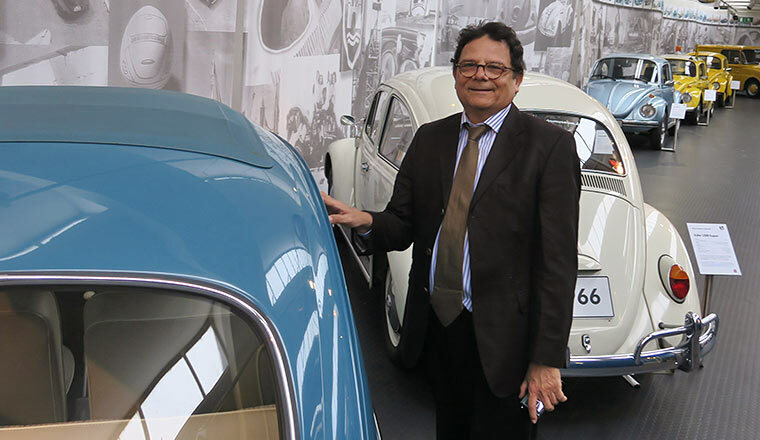 Professor Ernesto Pinto-Bazurco Rittler, Consul General of the South American Republic of Peru, visited the current exhibitions at the AutoMuseum. 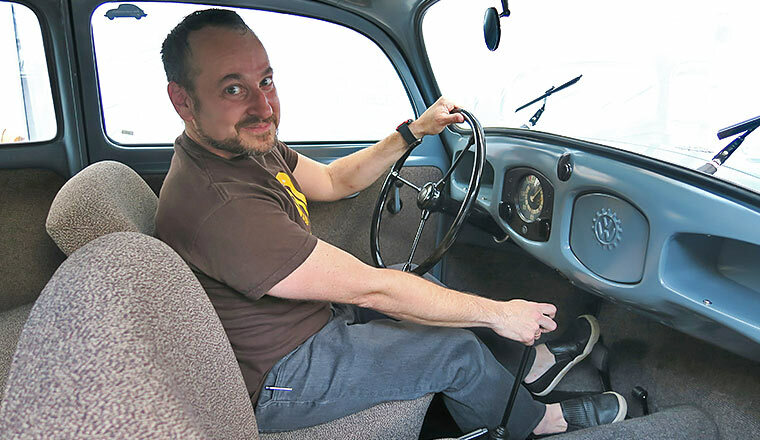 He demonstrated his expert knowledge and passion for the scene, owning several classic cars himself, among them a T2a Bulli and a Karmann Ghia T14. He is currently considering a collaboration with the AutoMuseum. Golf I GTI Pirelli on the racing track. 4 December 2015. Two legends met on the Portimao race track in the south of Portugal: the Golf 1 GTI Pirelli from the Volkswagen AutoMuseum and the latest special model of the seventh generation, the Golf GTI Clubsport. Whereas the Pirelli GTI – now equipped with a 1.8 litre fuel injection engine – hailed the end of the first sporty Golf generation with a limited edition at the start of the 1980s, Volkswagen now celebrates the 40th anniversary of the popular classic car with the current 290 PS GTI Clubsport – as a thank-you to the enormous global fan community who has remained loyal to the car to this day. 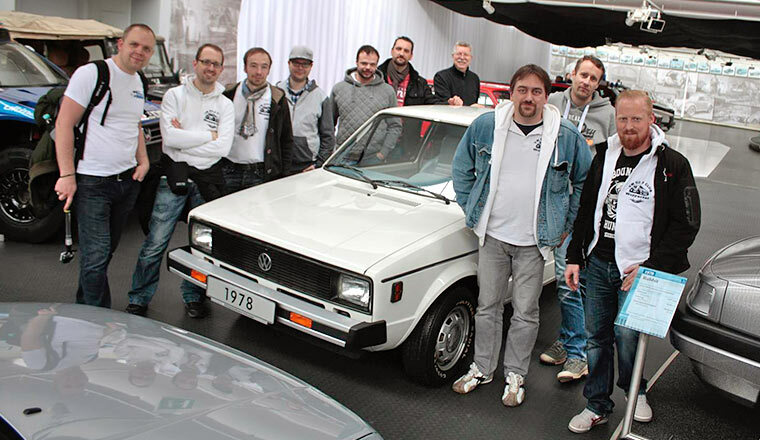 The Pirelli Golf with a 112 PS engine whetted the appetite of test editors in Portugal to make plans for a visit to the AutoMuseum in Wolfsburg and view other highlights of the car brand's history. Christmas is on the way – Gift ideas! Interested? 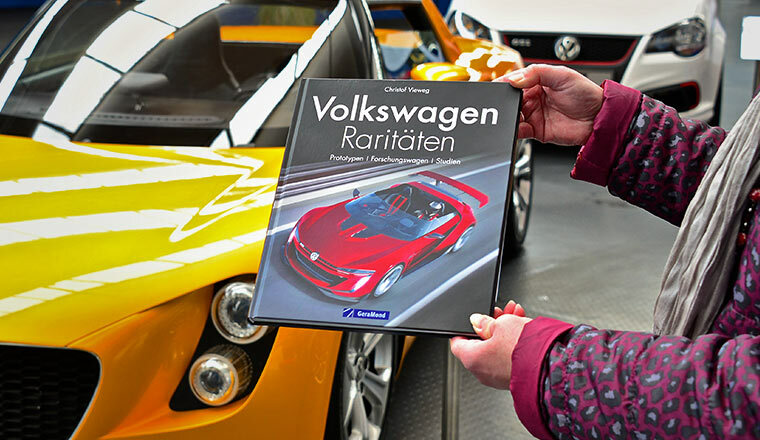 Then to place an order or ask a question, please do contact the Volkswagen AutoMuseum Foundation team at info@automuseum-volkswagen.de. We will gladly send the items out to you, subject to payment in advance for the goods and carriage. For delivery in time for Christmas (within Germany), the last day for orders to be placed and paid for is 16 December. 'Autonomous motoring' themed island opened. 16 November 2015. 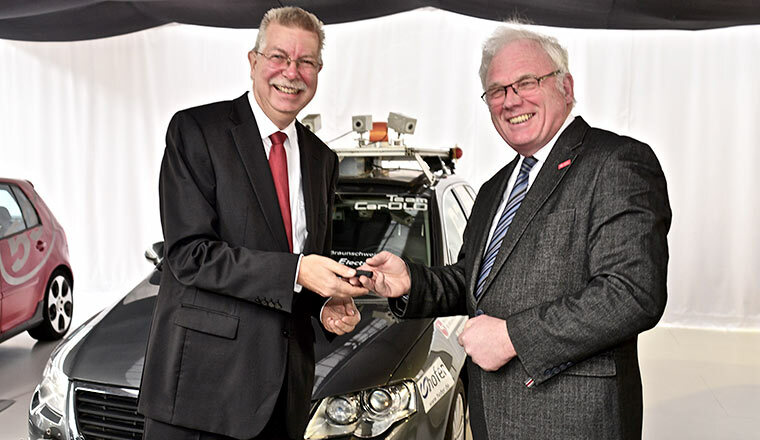 Key handover at the AutoMuseum: Prof. Dr. Hesselbach, President of Braunschweig Technical University, symbolically handed test vehicle Caroline's key to Mr Kittler, Executive Director of the Volkswagen AutoMuseum Foundation. 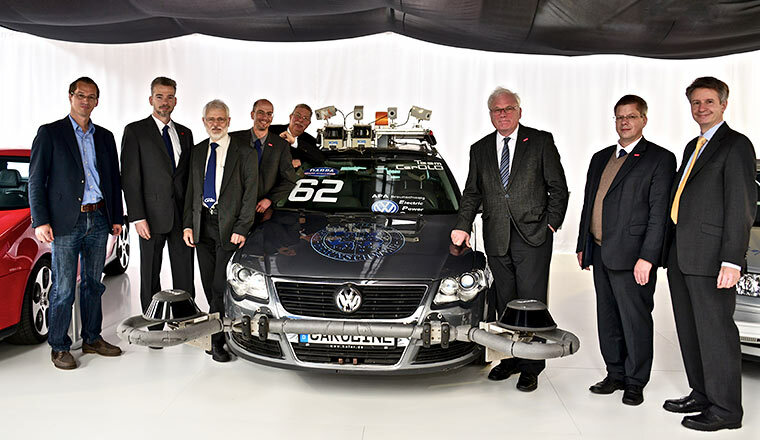 Caroline, a Passat Estate that the CarOLO research project team had fitted out with a comprehensive array of sensors for autonomous driving, achieved seventh place in the Darpa Urban Challenge in the USA in 2007. The objective was to master a 100-kilometre urban course featuring everyday traffic situations completely autonomously. 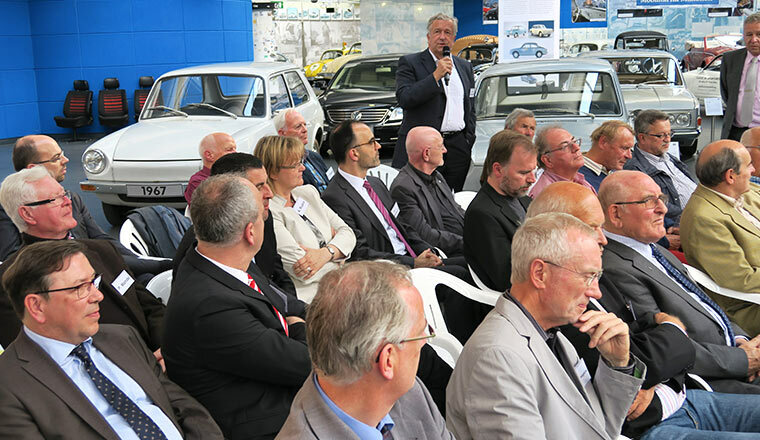 At the press conference for the opening of the new 'Autonomous motoring' themed island, the Braunschweig TU experts launched right away into a brief podium discussion on the various factors surrounding autonomous driving. Also present was an expert from Volkswagen Group Research, which is supplying the Golf GTI 53+1 as a long-term loan. This autonomous racing specialist was named after 'Herbie', the prime father of all self-driving cars from the Disney movie 'The Love Bug', which carried the racing-number 53. 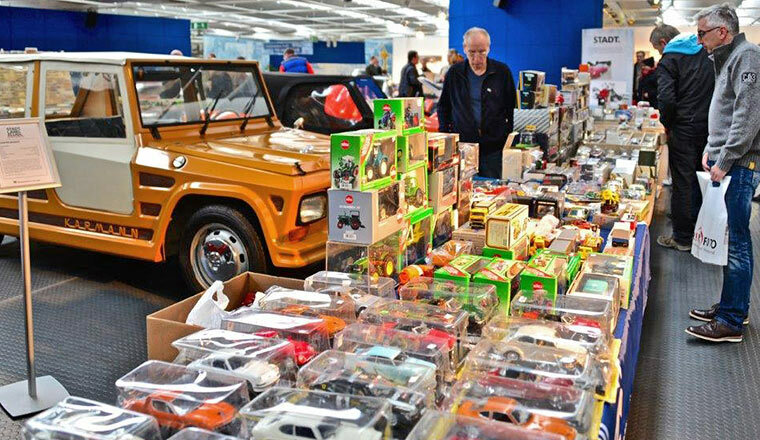 Back every year: model car fair in the AutoMuseum. Lebenshilfe Giessen e. V. raffles Fridolin. Lenders open special exhibition "River Deep – Mountain High". 5 November 2015. 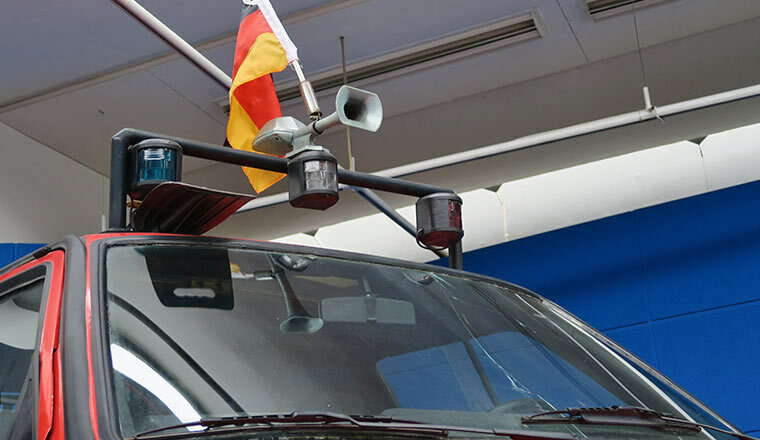 "River Deep – Mountain High" is the fourth and last special exhibition of the VW AutoMuseum, exploring fun and recreational vehicles from Volkswagen. The eye-catcher at the exhibition is the Golf Country which is celebrating its 25th anniversary this year and is regarded as the forerunner of present-day SUVs. Around 50 invited guests were treated to a wealth of facts about the priceless treasures on show. This showed once again the enormous love of detail and commitment with which enthusiasts cherish and care for their automotive gems - so keeping the tradition of the brand alive. The guest of honour on the evening was Walter Treser who was project manager at Audi and also responsible for naming the Audio quattro and the management of the motor racing department. He then went on to build customised vehicles on Audi and Volkswagen chassis. 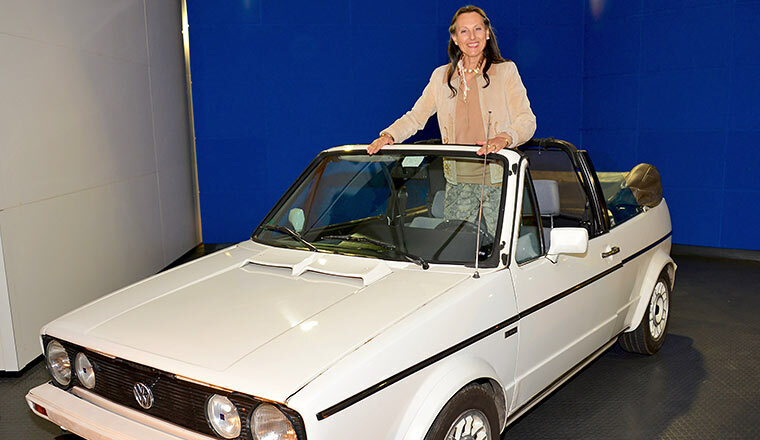 Among them was a Polo convertible, a limited edition of only 290, which can be admired at the exhibition. This was followed by the Treser Roadster manufactured in Berlin, but which failed to gain success. 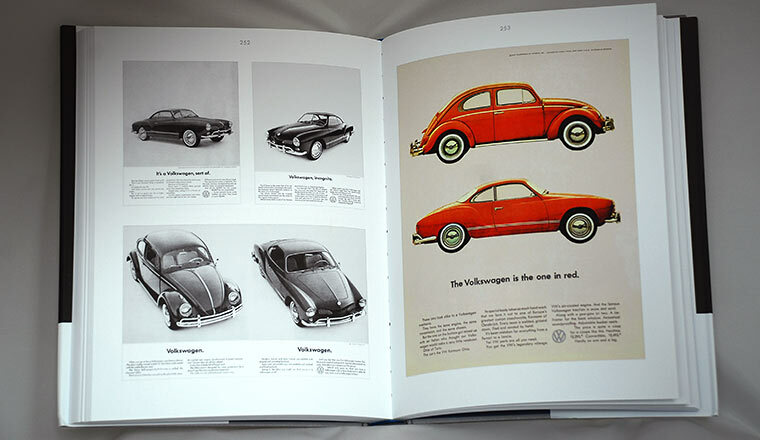 Volkswagen chronicle: around 80 years of Volkswagen history on 340 pages. 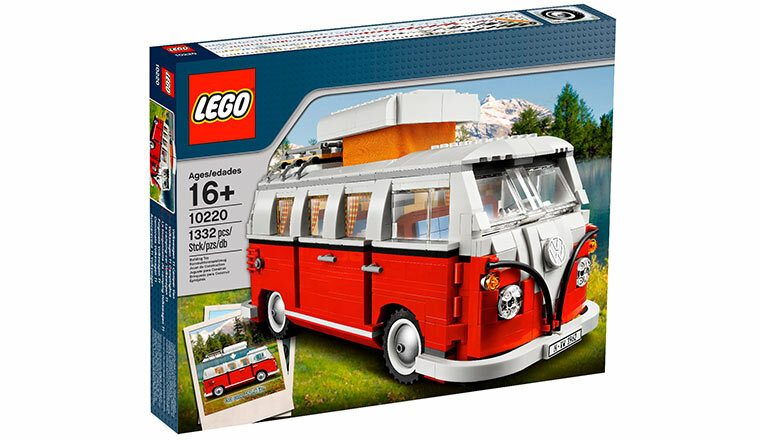 Lego Bulli at Brand Licensing Europe 2015. 13 to 15. October 2015. From 13 to 15 October 2015, the Brand Licensing Europe (BLE) took place at London Olympia. 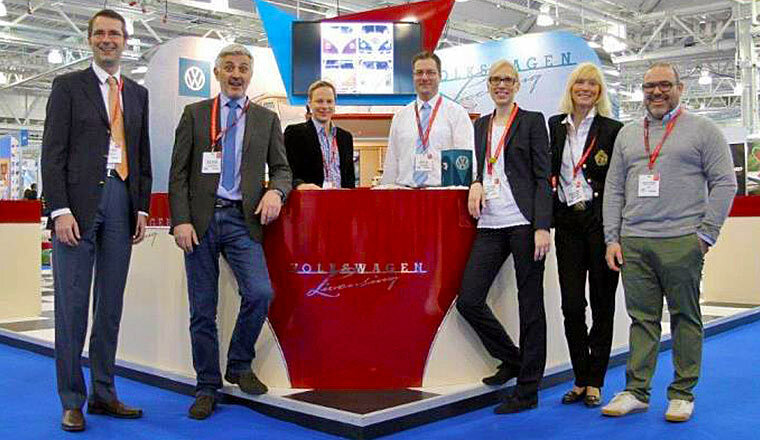 Volkswagen Licensing participated for the 17th time under the management of license manager Hauke Wilkens. This licensing exhibition is second only to Las Vegas, and boasts 306 copyright holders covering 2,500 brands (20th Century Fox, Adidas, BBC Wordwide, UEFA, Lamborghini, etc.). 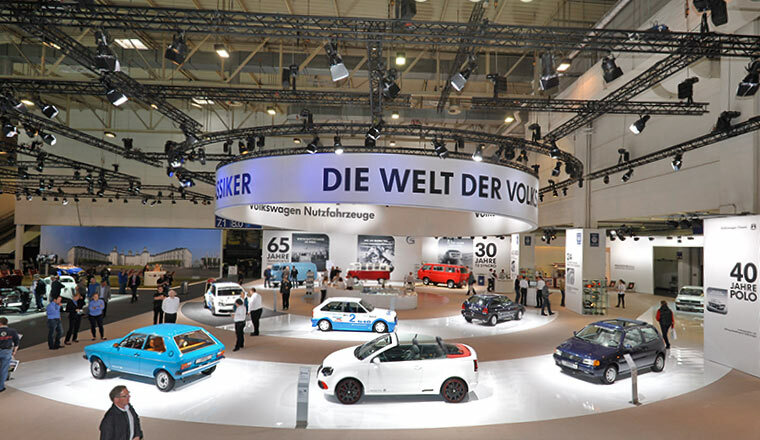 Volkswagen Licensing has taken a central stand of 100 m2 in the Brands & Lifestyle exhibition hall. 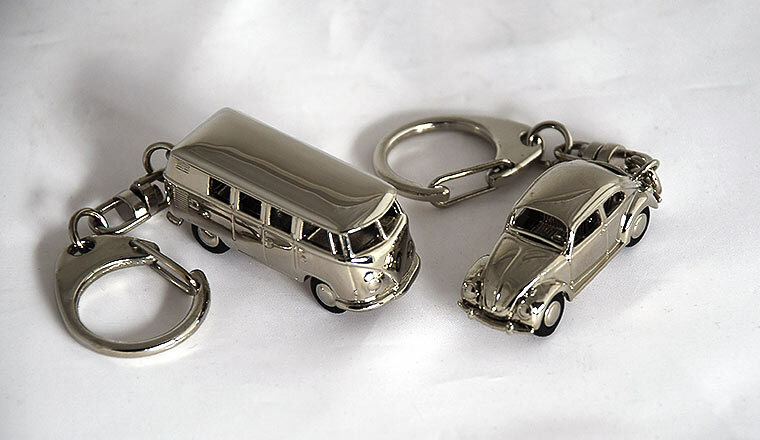 The nostalgic look of the 1950s dominated the design of the VW stand with a VW Bulli T1. 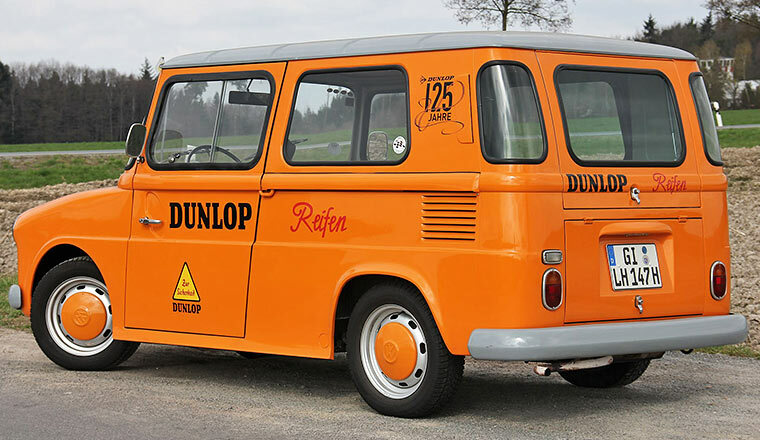 The round design language was also adopted for the exhibition showcases, which look very much like the front end of the first VW Transporter. 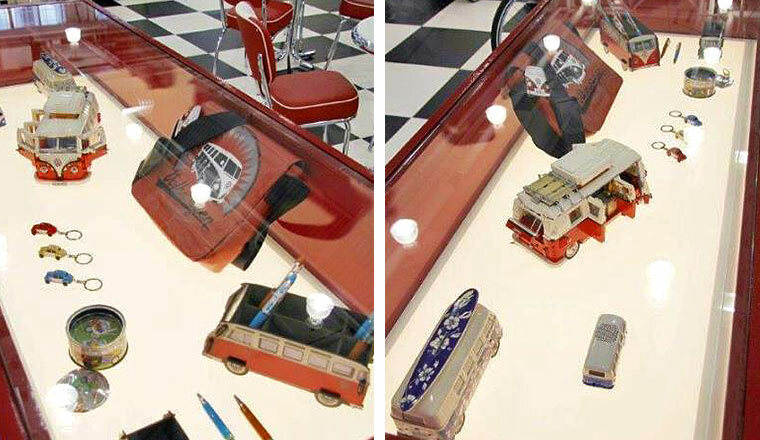 The round corner showcase which the flow of visitors automatically passed as they weaved their way through the exhibition, housed the exhibit on loan from the Volkswagen AutoMuseum Foundation - in fact the Lego Bulli, which is a thirty centimetre long model made of 1,332 Lego bricks. VW licensee Lego built this exhibit in 2007. 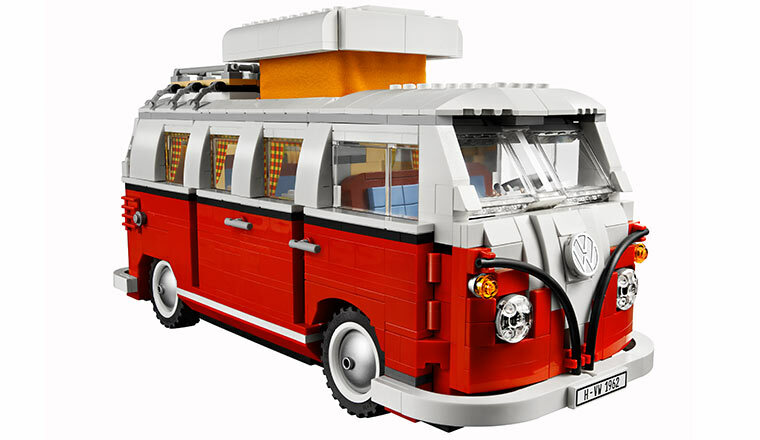 When it is not presented at word-wide exhibitions, the Lego Bulli can be admired at the Volkswagen AutoMuseum. 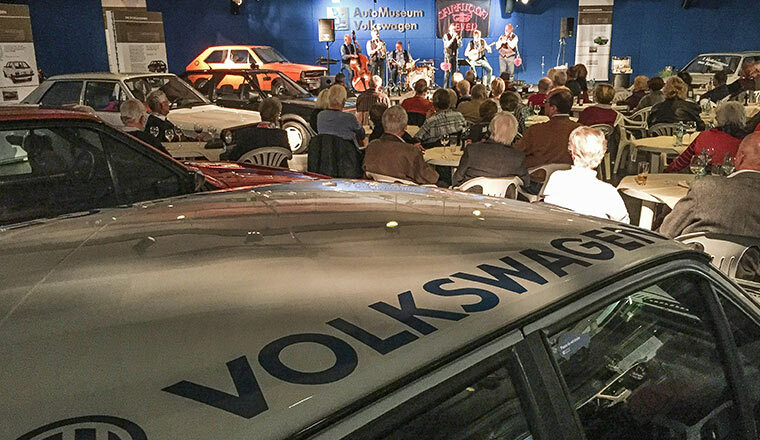 Vernissage at the Volkswagen AutoMuseum. 9 October 2015. 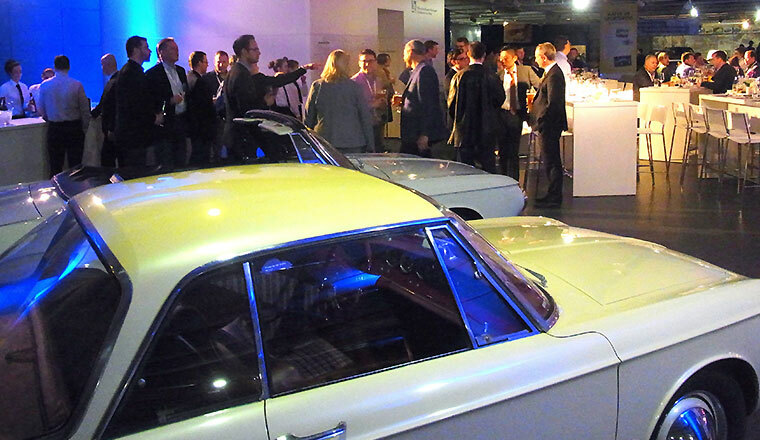 Around 70 invited guests came to the Volkswagen AutoMuseum for the vernissage of the 'Tracks in time. Paintings, graphics, sculptures' art exhibition. 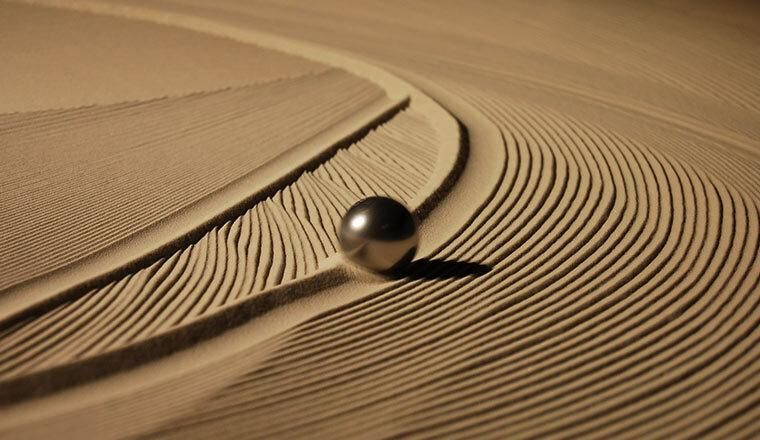 It forms the start of the new exhibition series entitled 'Mobile creativity. Art in the Volkswagen AutoMuseum'. 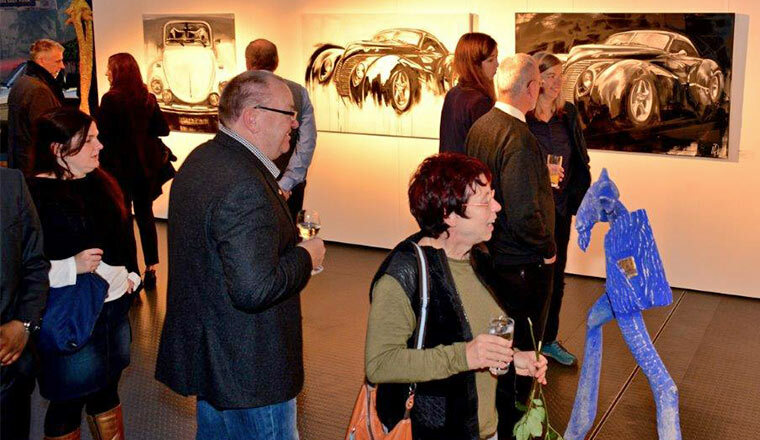 Artists Natalia und Wladimir Rudolf personally opened the vernissage. 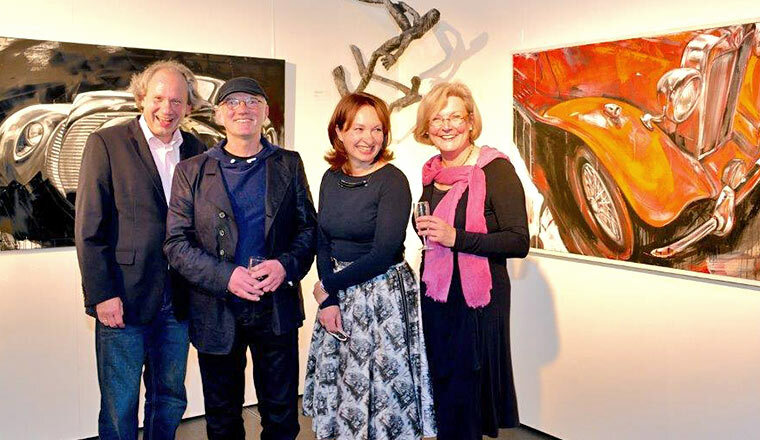 When asked why she had chosen the classic automobile as the object of her painting work, Natalia replied that she didn't really know – it had been a matter of fate. Wladimir uses the element of surprise in his sculptures – "an exhibition without sculptures is like a car without a driver," he jokes. Ultimately, the artists leave it up to the observer to interpret their works. 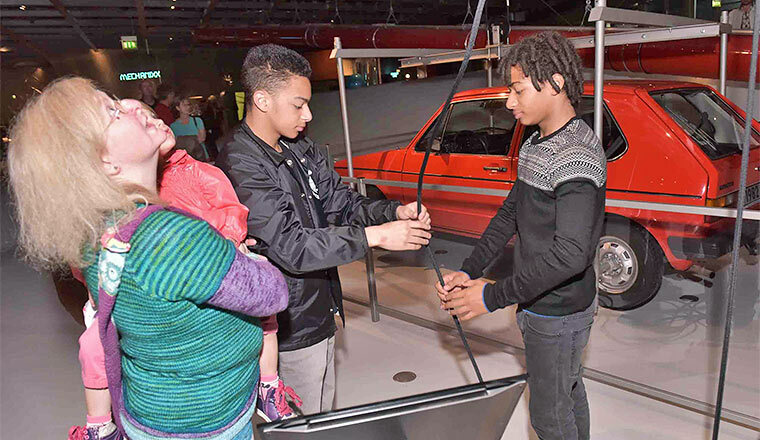 The visitors, who were largely well-versed in the arts, found them inspiring in many ways and enjoyed the artistic tension created between the works on show and the real cars of the museum's permanent exhibition. Incidentally, the works of art are for sale. 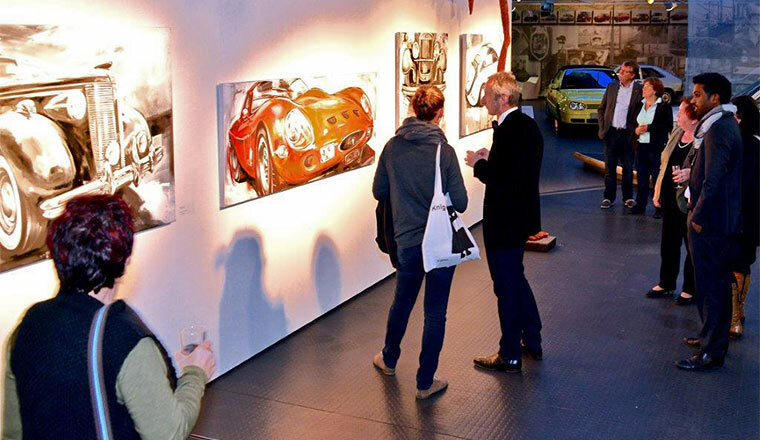 If you are interested, a price list can be requested by e-mail from info@automuseum-volkswagen.de or info@art-ru.de. 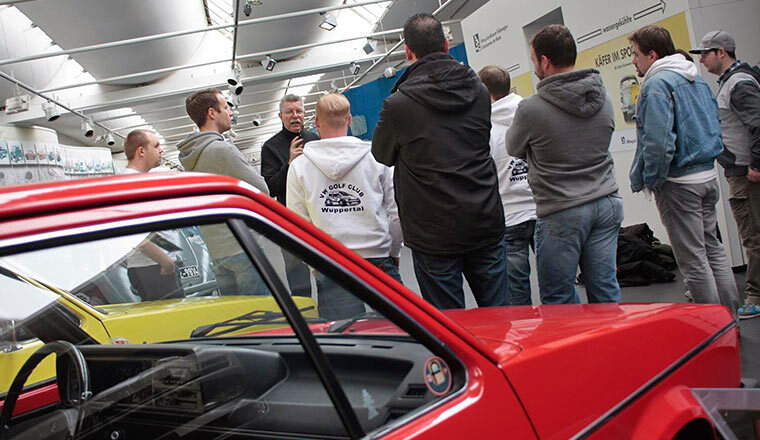 Swiss Scirocco fans at the museum. 7 October 2015. 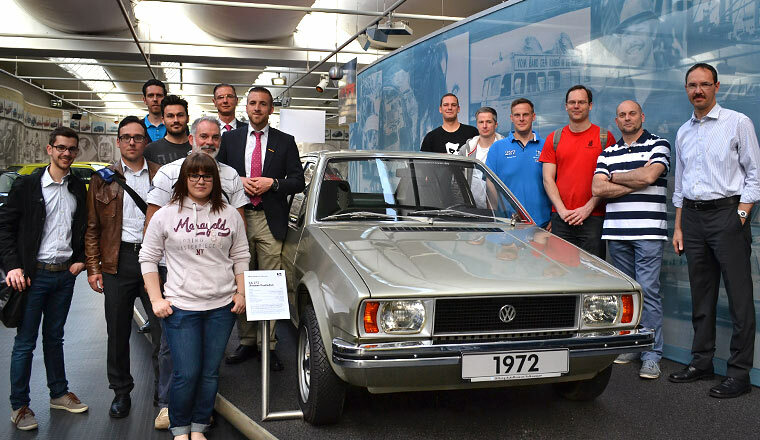 Ten members of the Aarau Scirocco Club undertook the journey of around 850 kilometres from Aarau in Switzerland to Wolfsburg in Lower Saxony to dive for three days into the automotive world of Volkswagen. This included a visit to the Autostadt and, of course, to the Volkswagen AutoMuseum. 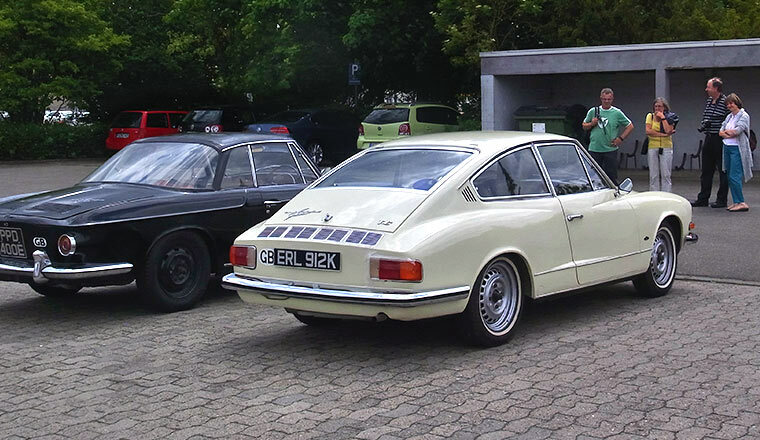 Here the visitors found out interesting facts about Volkswagen's product history and, naturally, there were also one or two Scirocco originals for the enthusiasts to see - like the silver model with chassis number 1, alongside which a small snack was laid on for the Swiss fans. 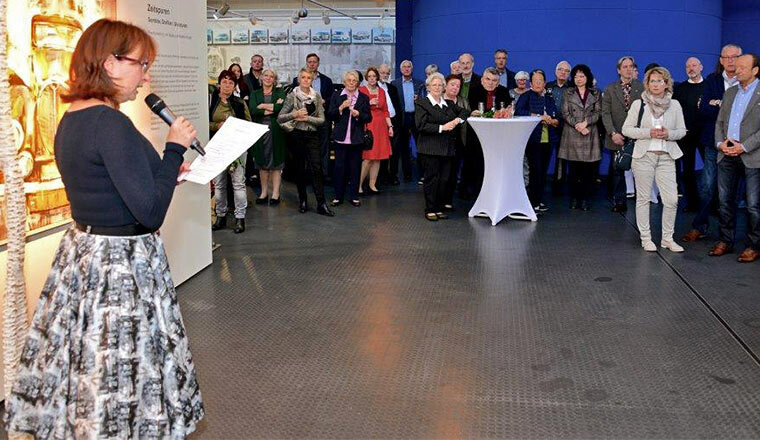 Museum 'Trabi' celebrates reunification anniversary in Wolfsburg. 3 October 2015. 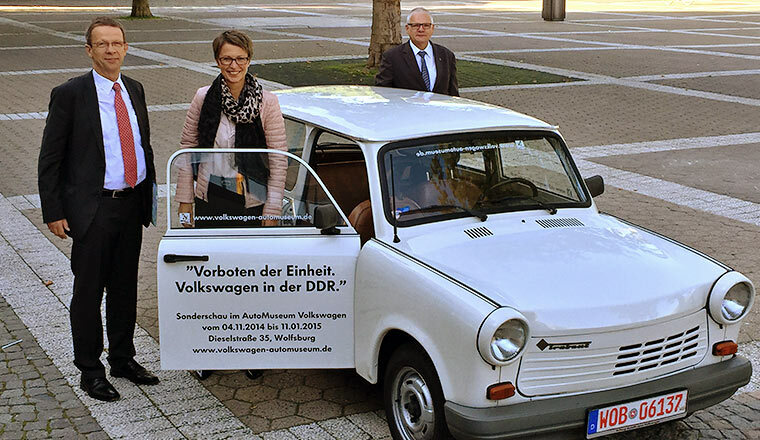 For the 'Silver Anniversary of German Unity' the Volkswagen Museum provided the City of Wolfsburg with a Trabant Universal from 1990, the year of reunification. 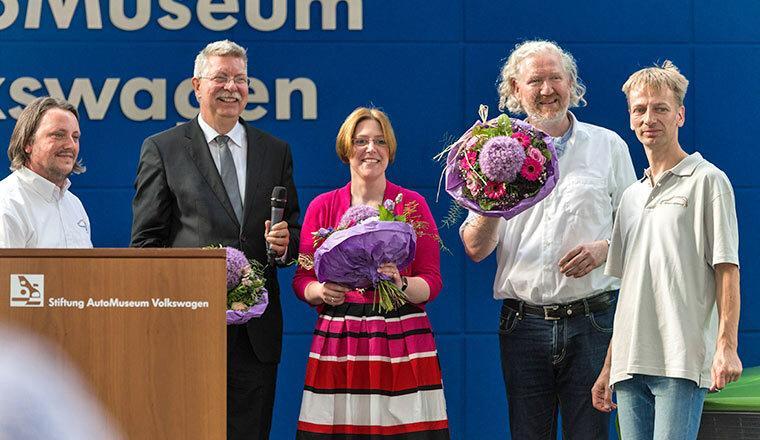 Susanne Wiersch and Eckberth von Witzleben handed over the 'Ost-Volkswagen', which incidentally is powered by a 1.1-litre Polo engine, on 2 October to the mayor's driver, Mr Schulz. 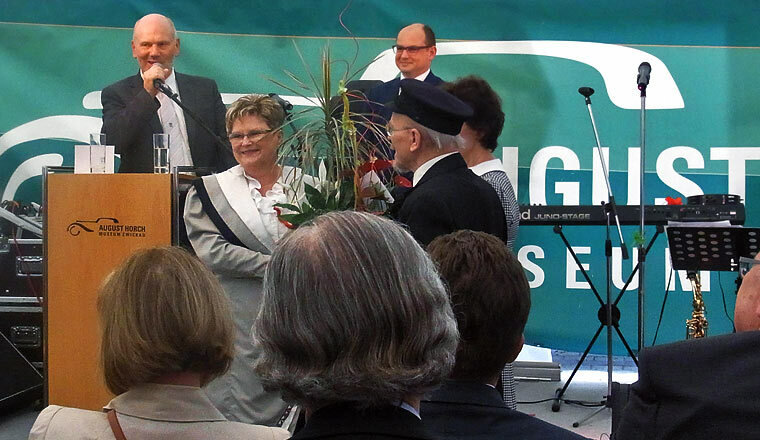 He used the Trabant to drive the mayor, Klaus Mohrs, and his wife to the official celebrations at the town hall. The Trabant 1.1 Universal was an eye-catching sight on the square in front of the building that morning. 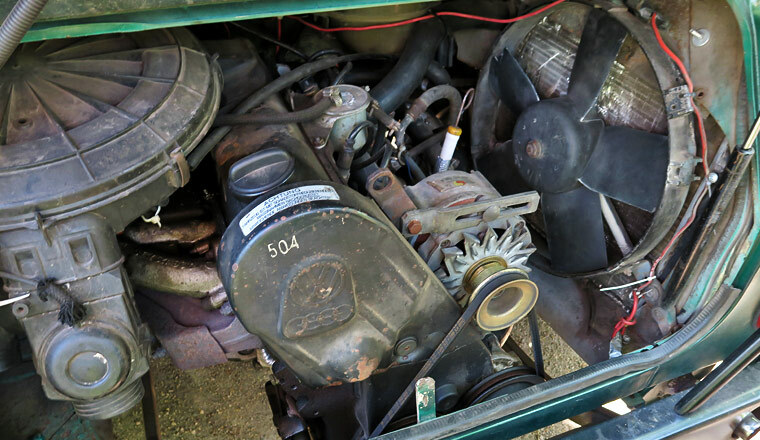 Golf Mk1 from the AutoMuseum demonstrates block and tackle principle. 3 October 2015. 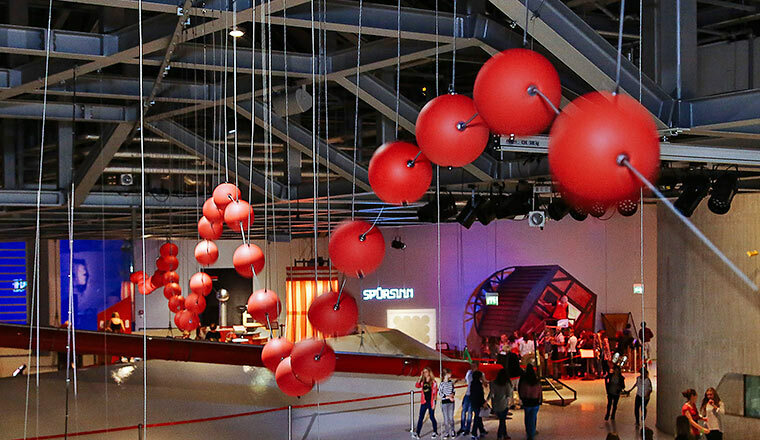 MechanixX is the name of the new special exhibition at the 'phaeno' interactive science centre in Wolfsburg, which seeks to explain the basics of mechanical physics to young and old in a playful way and with lots of movement. 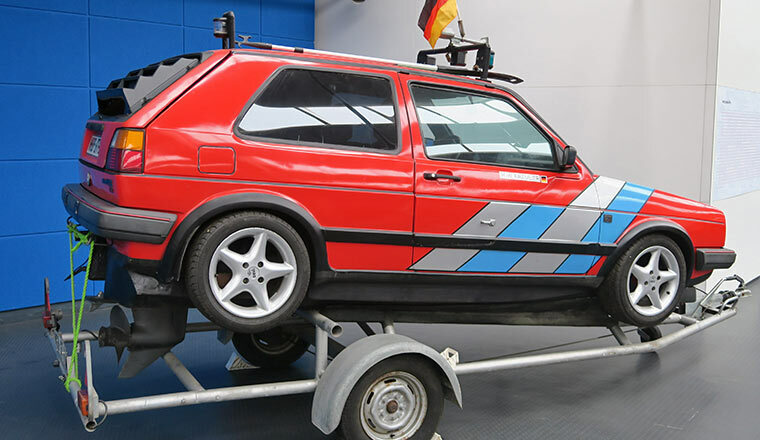 One of the 45 exhibits is a Golf Mk1, which the Volkswagen AutoMuseum has loaned to the centre. The car is hanging by ropes, via which the visitors can pull it up and down – using, however, decisively less effort than if lifting the car by direct means. That is down to the block and tackle principle, which visitors are able to experience here in a real, hands-on way. The exhibition runs until 14 August 2016. More details at www.phaeno.de/mechanixx. 3 October 2015. 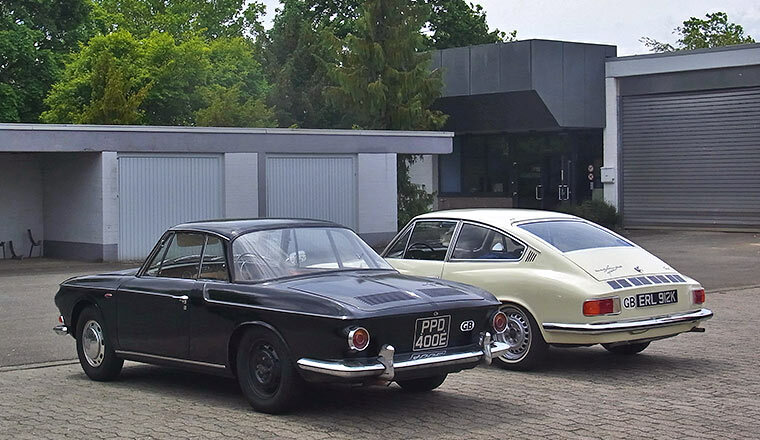 Two of the AutoMuseum's closest friends are Traugott and Christian Grundmann in Hessisch-Oldendorf near Hameln. 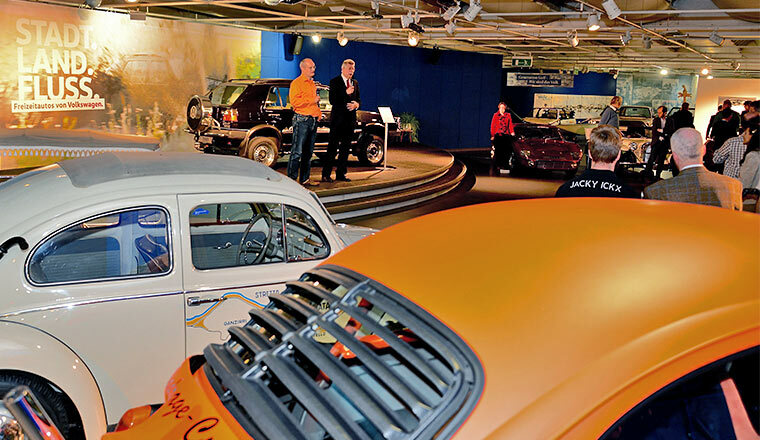 They have an exclusive Volkswagen collection, which was added to on 3 October by the opening of their Rometsch hall, where they have put on display a dozen dream cars from the Berlin coachbuilder, which in the 1950s built primarily Beetle-based coupés and cabriolets. Professionally designed by Anand Steinhoff, the exhibition includes Rometsch tools, design documents and photographic records. 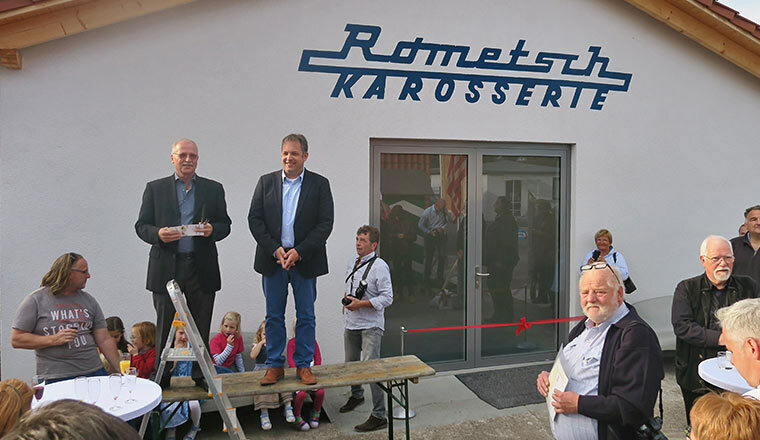 Guests from the Rometsch days present at the opening included head designer Günter Kaulmann and fabrication specialists Baldur Pauli and Wolfgang Bücke. 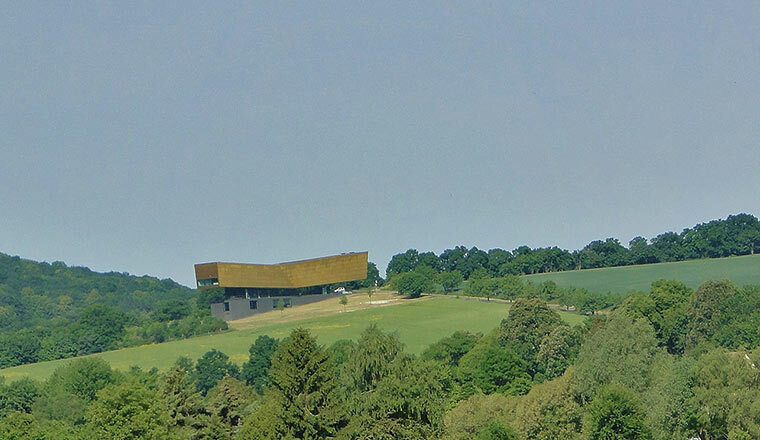 More details about the permanent exhibition can be obtained from kiki@bugnet.de. Saratoga Seven play at the AutoMuseum. 25 September 2015. 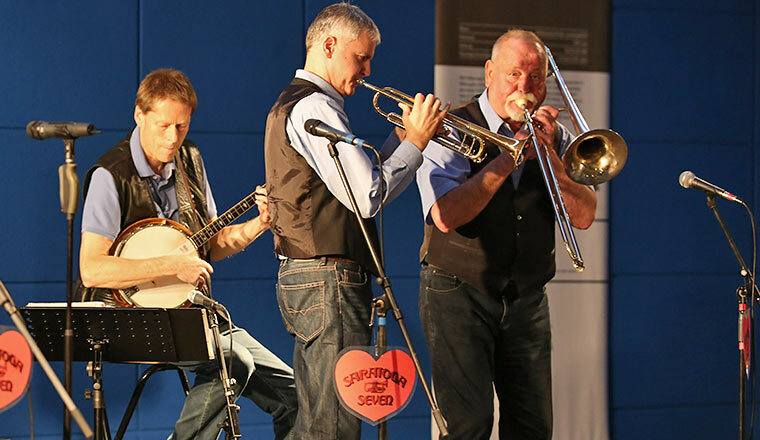 The jazz band Saratoga Seven from Braunschweig has gained a reputation far beyond the region. 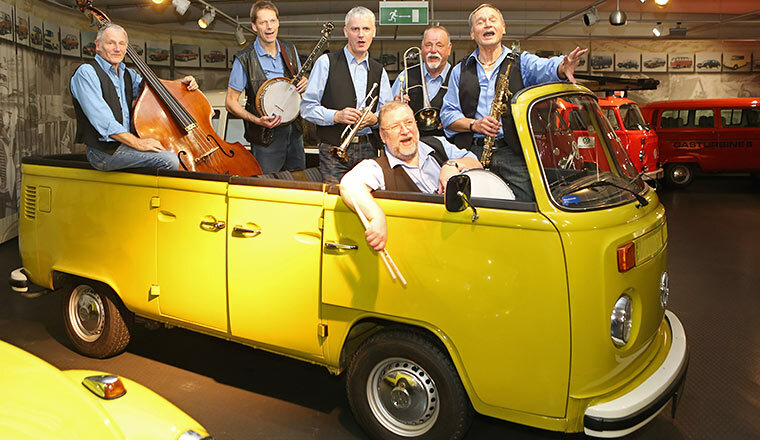 The band is also popular in Wolfsburg because plant manager Jens Hermann plays the banjo in the band. 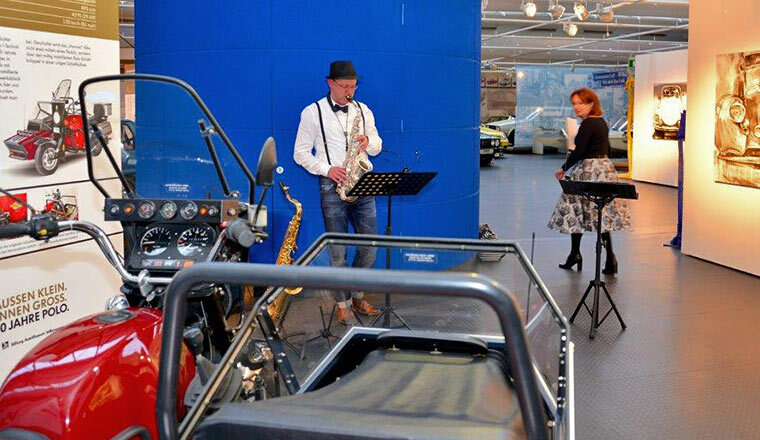 Incidentally, the six-man band (double bass, clarinet, trumpet, trombone, banjo, drums) played at the AutoMuseum for the first time in 1986 on the occasion of its first anniversary. Now they returned for the fourth time to provide great entertainment. Around 80 visitors enjoyed the classic jazz – in the style of Chris Barber, Acker Bilk and traditional New Orleans music. International Training Manager Conference 2015. 15 and 17 September 2015. 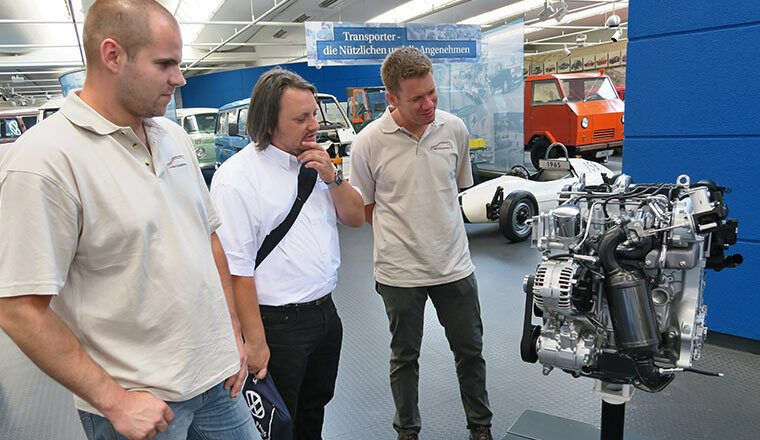 The Volkswagen After Sales Training department held its International Training Manager conference – for the first time together with Volkswagen Commercial Vehicles Service Training. 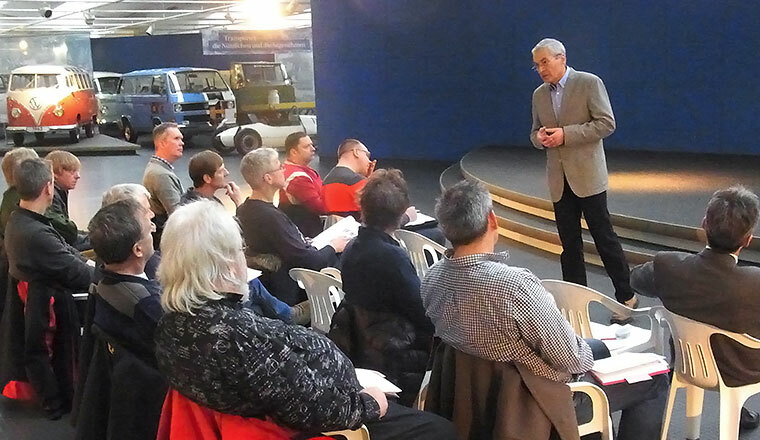 The background: training managers are responsible for training the service staff of the Volkswagen partners in their markets. More than 80 participants from 50 markets accepted the invitation to Wolfsburg. They met for an intensive exchange about the training topics planned for the next twelve months. 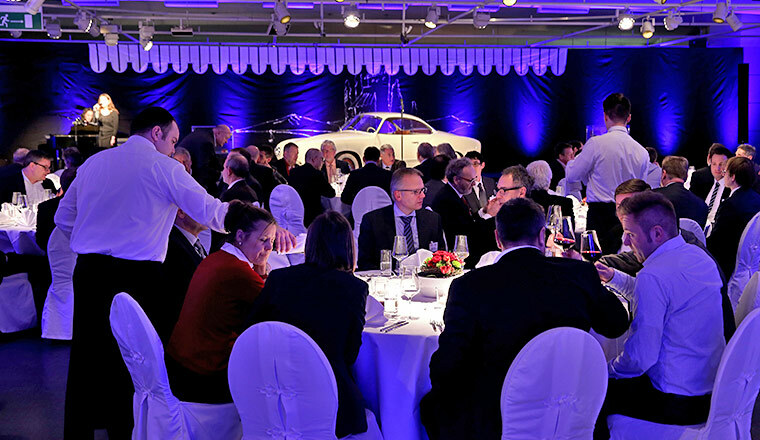 Dinner at the AutoMuseum was a special highlight, and the guests enjoyed immersing themselves in the brand's product history there. Furthermore, there was an interlude with a humorous explanation of physics as well as music by Lounge DJane. 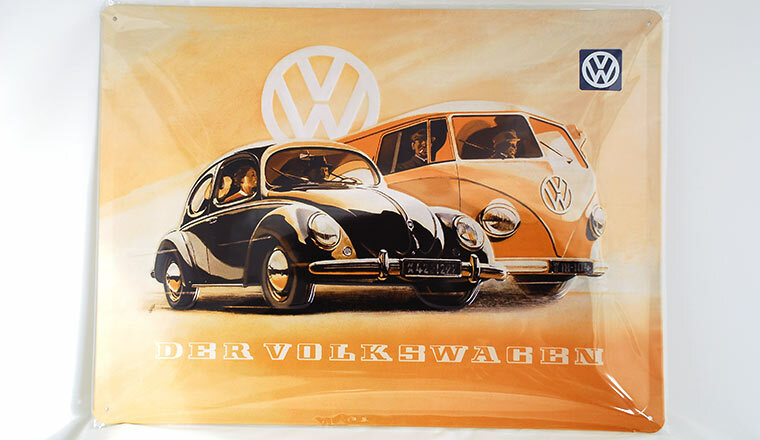 Design price for the AutoMuseum Volkswagen. 27 August 2015. 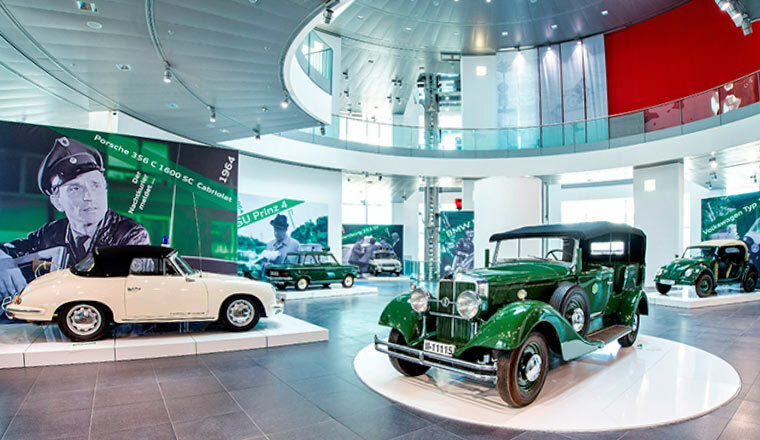 The Volkswagen AutoMuseum website shows that it is also possible to present motoring history in a modern and exciting way. 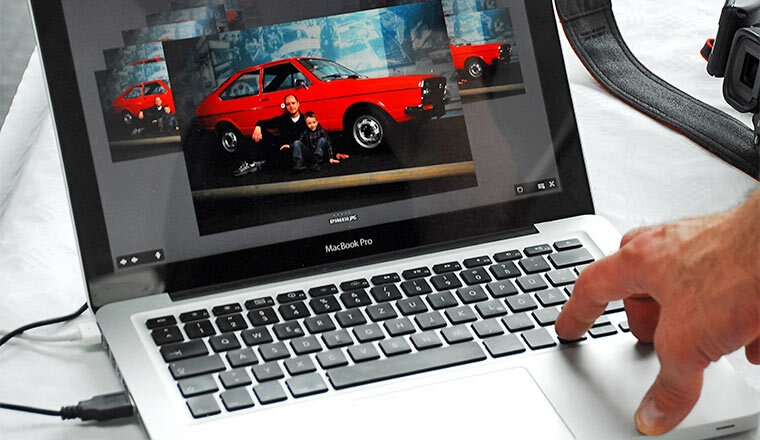 That has now been confirmed by one of the very top authorities in the field: in the Automotive Brand Contest the German Design Council (Rat für Formgebung) adjudged our website the winner in the 'Digital' category. 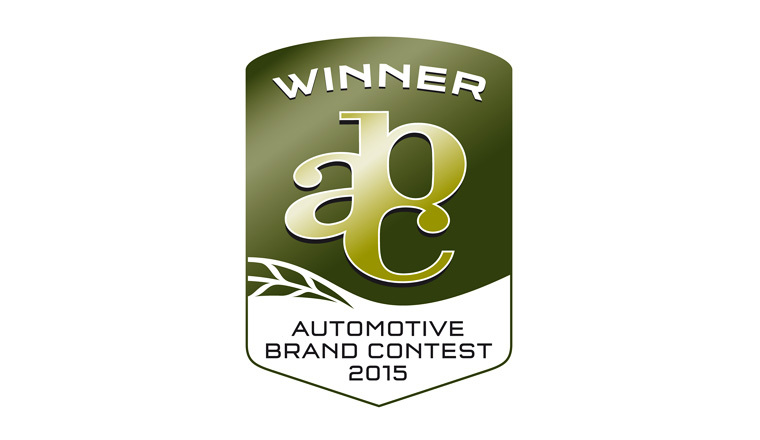 The Automotive Brand Contest ranks as one of the most prestigious competitions in the automotive industry. 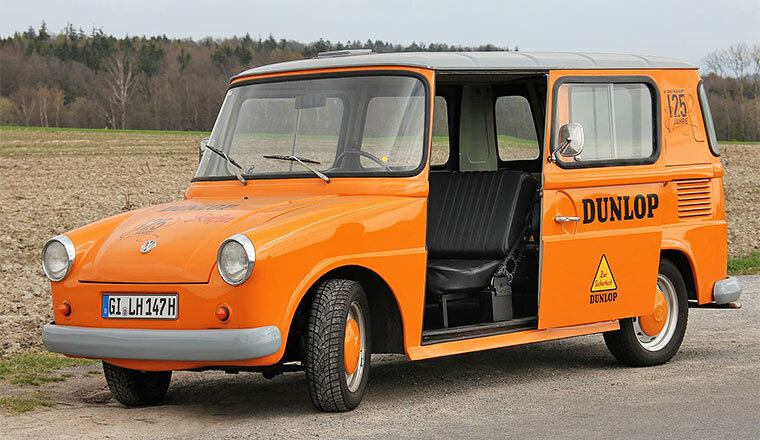 It was launched and is run by the German Design Council, which was formed in 1953. The Council uses the competition to recognise outstanding product and communications design in the automotive industry, placing a particular focus on the areas of brand and brand design. 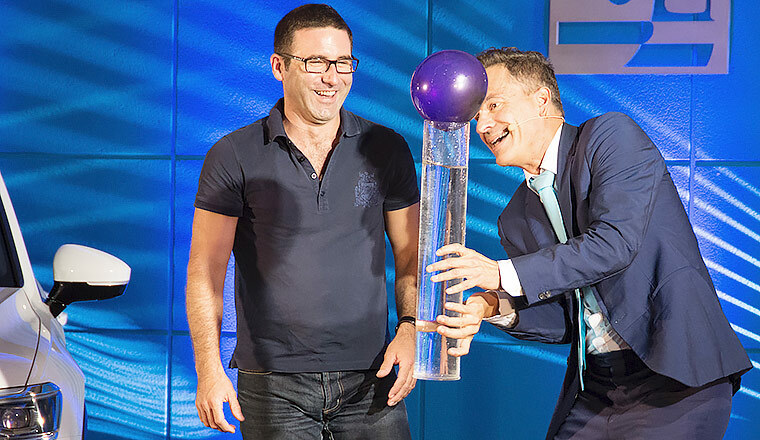 The Automotive Brand Contest awards ceremony took place on 15 September, the first press day of the International Motor Show (IAA), in Frankfurt. 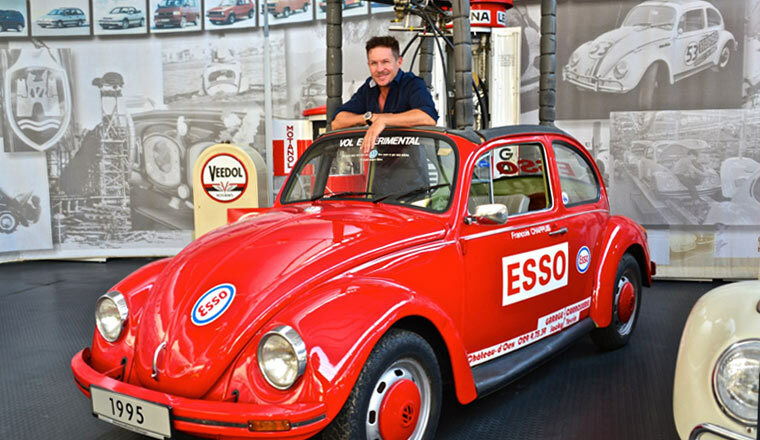 The AutoMuseum on the Beetle Sunshine Tour 2015. 21 to 23 August 2015. 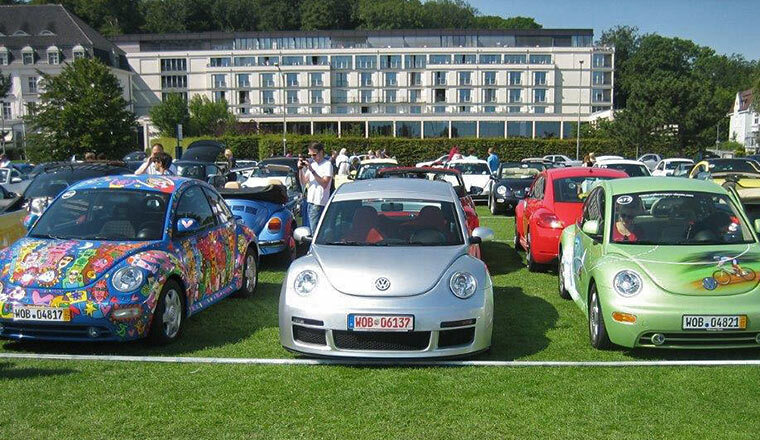 This year, the Beetle Sunshine Tour again took place in the Brügmanngarten in Travemünde, directly on the Baltic Sea coast. 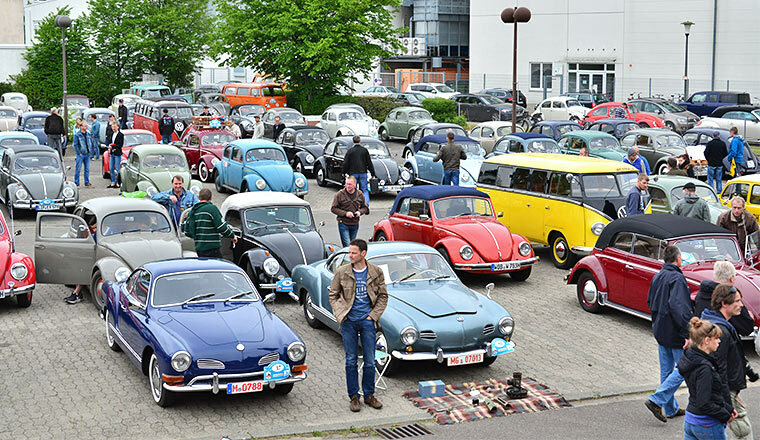 Over 500 "bugs on wheels" came to the greatest Beetle meet in the world. 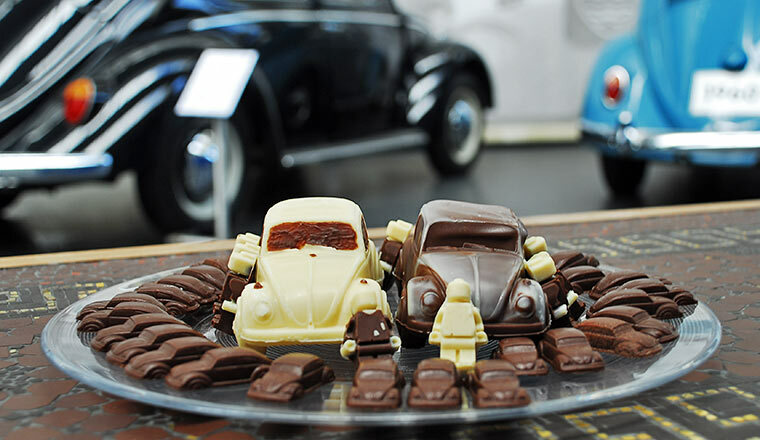 The Volkswagen AutoMuseum Foundation provided a total of eight Beetle models – six "Beetlemania ArtBeetles", a James Rizzi Beetle and a New Beetle RSI. 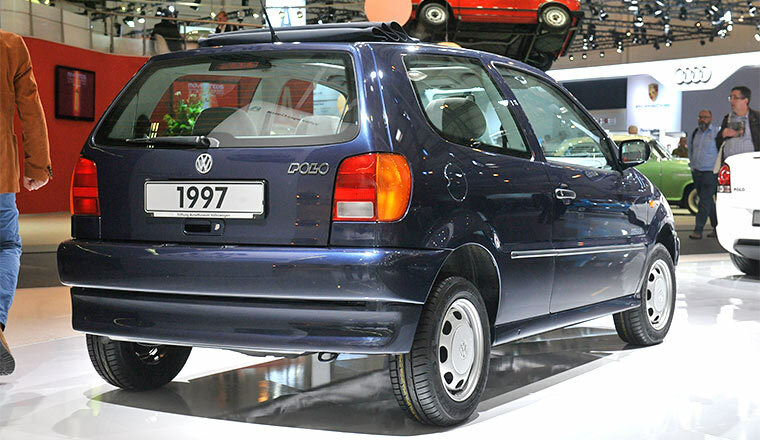 The RSI is number "000" of "250" limited edition models built in 2001 and was equipped with a powerful 3.2 litre, 241 PS VR6 engine with four-wheel drive. 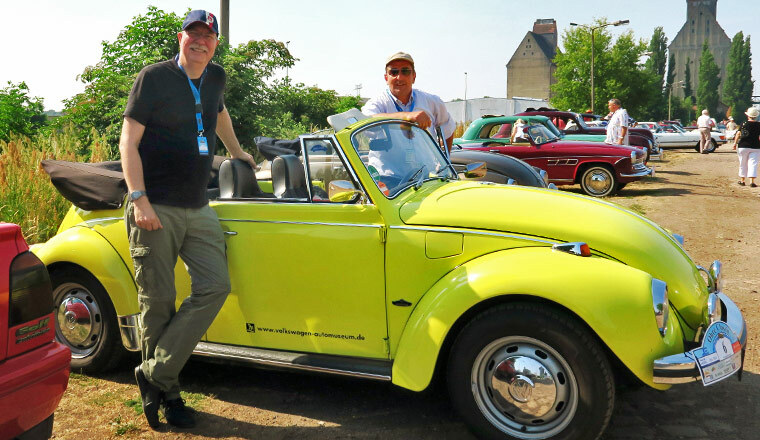 Museum employee Eckberth von Witzleben drove the sporty and agile museum RSI exhibit from Wolfsburg to Travemünde and back. 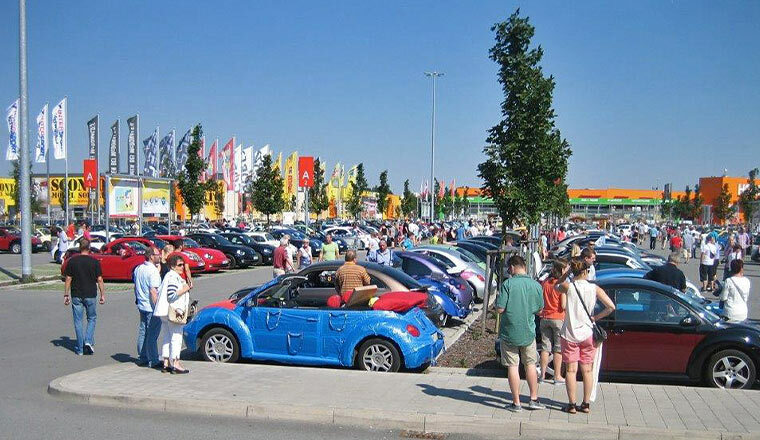 Besides standard models, visitors to the festival brought highly customised exhibits with them – such as a Beetle convertible shaped like an Ikea shopping bag or a 2005 convertible decorated with wooden foil, giving it the old school look of a US road cruiser. American blogger searching for clues. 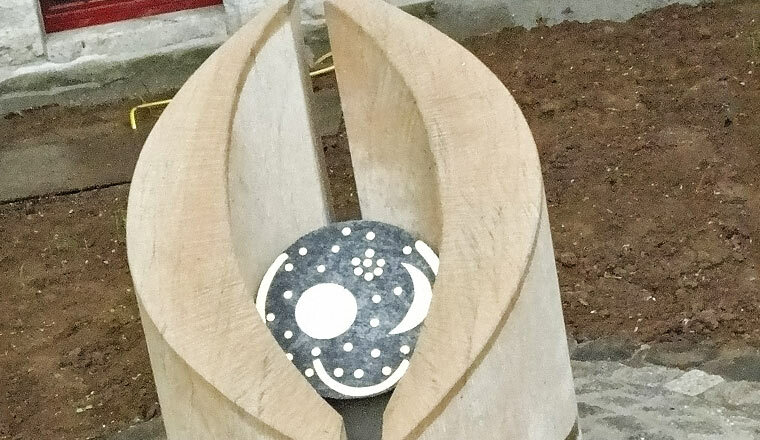 21 August 2015. 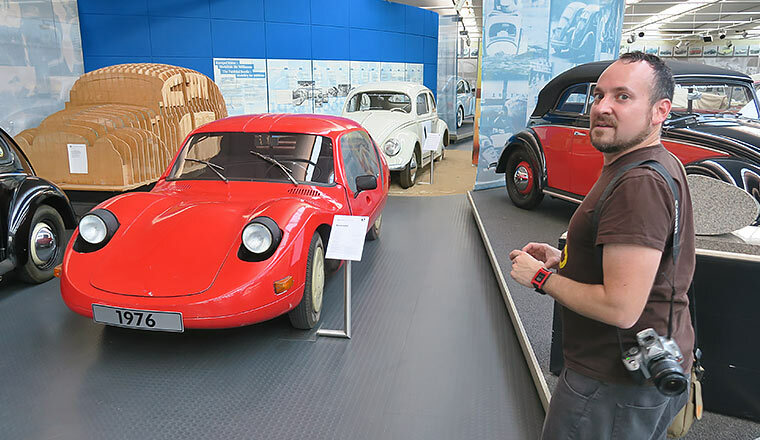 Before the well-known American blogger Jason Torchinsky (www.jalopnik.com) started off in a New Beetle from the AutoMuseum collection to drive to the "Beetle Sunshine Tour" in Travemünde, he spent hours taking a close look at the exhibits at the museum in Wolfsburg. 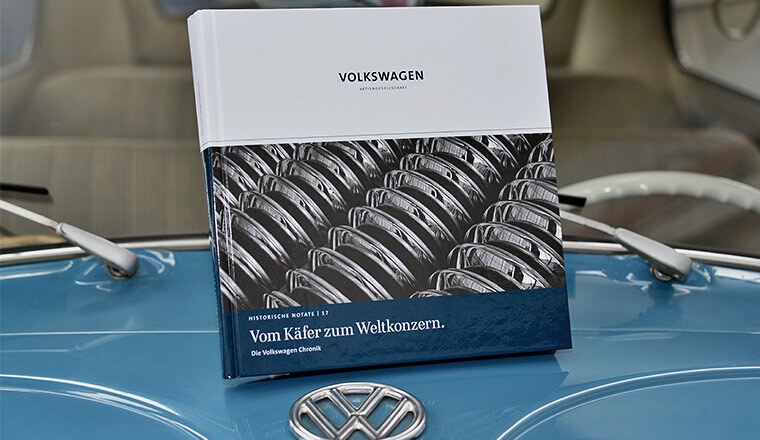 Jason is a great fan of Volkswagen and was able to improve his already excellent detailed knowledge here. The man from North Carolina owns a 1973 Beetle which he also drives in races. The story of how his car was stolen and how he recovered it thanks to the help of social networks has been commented thousands of times on the web. Polo fans visit special exhibition of their classic car. 15 August 2015. Polo fan and expert Sebastian Winkler from the VW Polo IG Deutschland e. V. gave club members an expert guided tour of the Polo special exhibition at the Volkswagen AutoMuseum. Among them were also two big Polo fans from England. 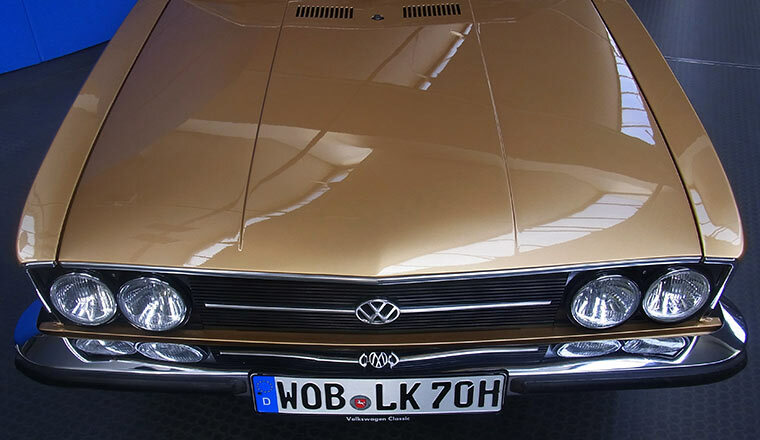 On their road trip through Europe Samantha and Marc specially planned a stopover at the AutoMuseum in Wolfsburg and were visibly impressed by the exhibits on show, some of them rare models. They were themselves driving a Polo II Coupé. Polo promotion in front of the Volkswagen admin tower. 24 July 2015. 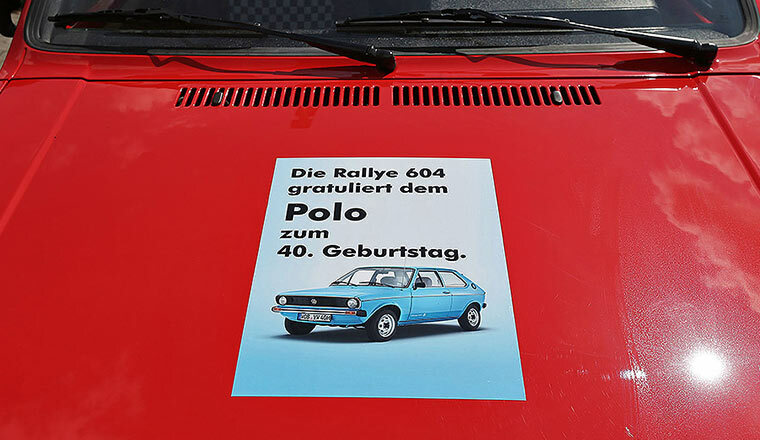 Volkswagen is celebrating the 40th birthday of the Polo. 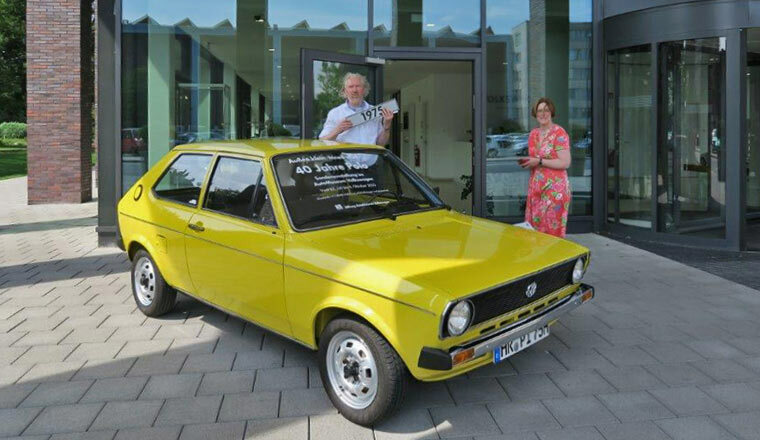 In order to draw attention to the current special exhibition in the AutoMuseum, for the next three weeks this Polo in original yellow paintwork will be reminding visitors of the Beetle's successor in front of the administration tower at the Wolfsburg Volkswagen plant. The inexpensive, no-frills Polo comes from the year 1975 and has been provided by Polo owners club, VW Polo IG Deutschland e.V. Outside small. Inside big. Opening of the '40 Years of the Polo' exhibition. 23 July 2015. 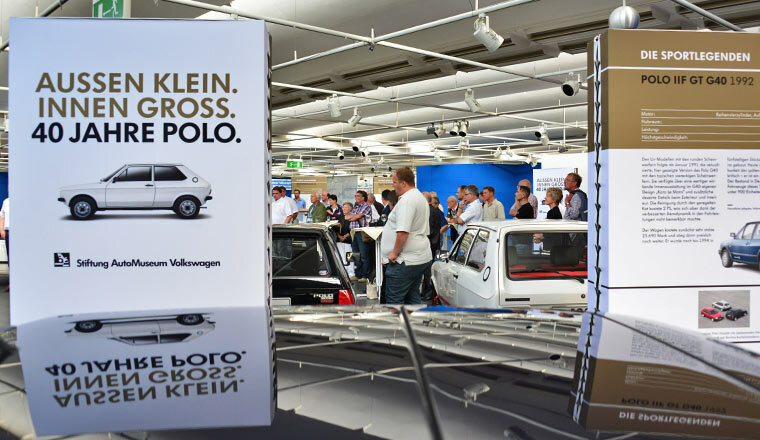 Thanks to the support of members of the VW Polo IG Deutschland e. V., the special exhibition to mark the 40th anniversary of the Polo is showing several highlights from the first and second generations. And, of course, the members who had loaned cars and other Polo enthusiasts were not going to miss out and came in good numbers to the exhibition's opening. In lively discussions they talked with other interested visitors about their Polo hobby and the special aspects of their exhibits. 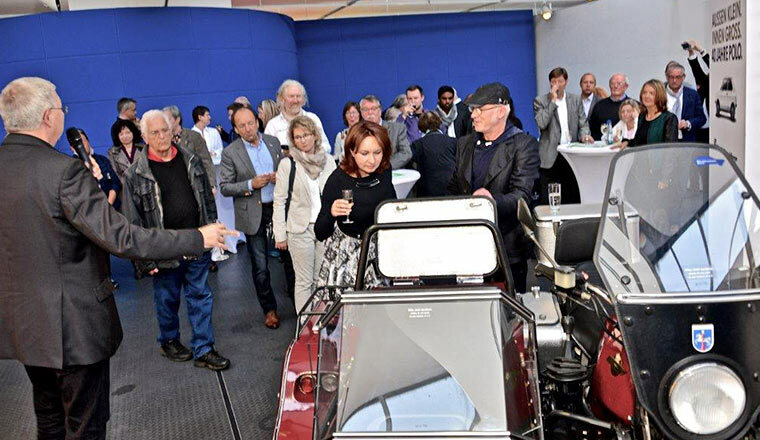 Guest of honour was Rainer Buchmann, 'star' of the car customisation scene in the 1980s, to whom the guests listened with great interest as he talked about his creative ideas for upgrading of all vehicles a small car like the Polo. AutoMuseum now present at Designer Outlets. 15 July 2015. 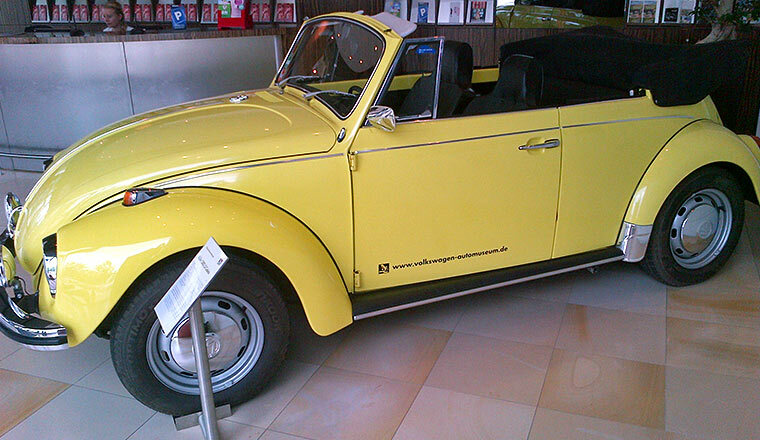 The saturn yellow Volkswagen 1302 Convertible from the Volkswagen AutoMuseum currently adorns the Centre Information panel at the Designer Outlets in Wolfsburg, directly under a photograph of Porschestrasse in the 1960ies by Heinrich Heidesberger. The car is well received by both employees and guests at the outlet and brings back memories of their first car for many people. 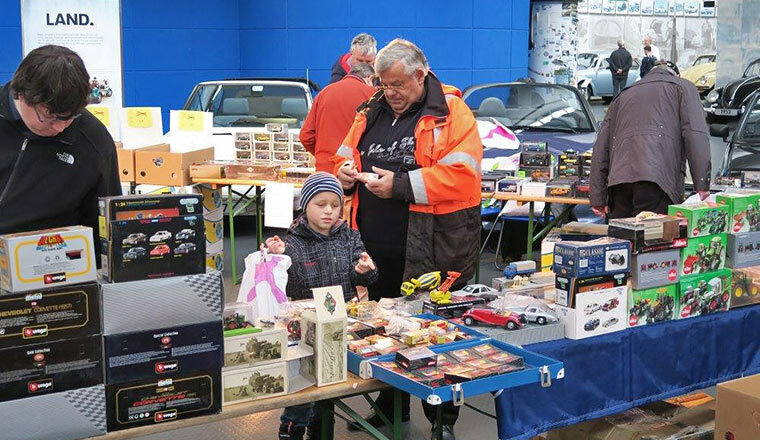 For the Designer Outlets (www.designeroutlets-wolfsburg.de) and the AutoMuseum, the joint venture is coupled with the wish of offering Outlet customers an eye-catcher, inviting them to make their way later to Dieselstrasse in Wolfsburg and admire other automotive treasures. Vintage jazz among vintage cars. 11 July 2015. 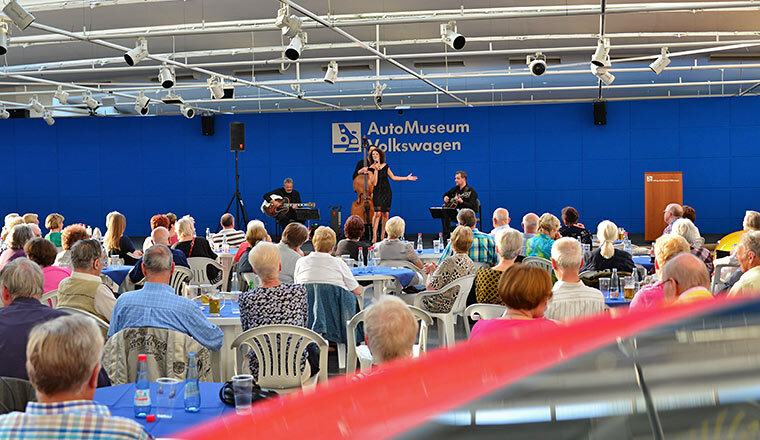 Over 100 people came on that sunny Saturday evening to the AutoMuseum to listen to another instalment in the long-established tradition of jazz concerts given within a setting of classic Volkswagen cars. 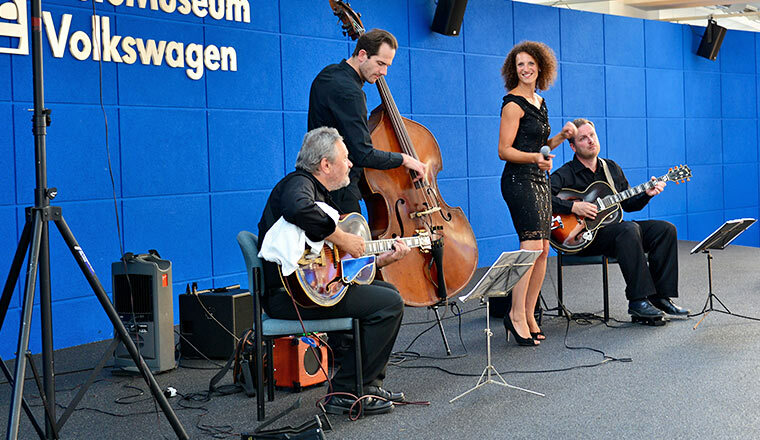 At the invitation of praglive.de, the 'Petra Ernyei Quartet' had travelled from the Czech Republic specially for the event and thrilled the audience for two and a half hours with an extremely virtuoso and moving performance of music ranging from bossa nova to swing. 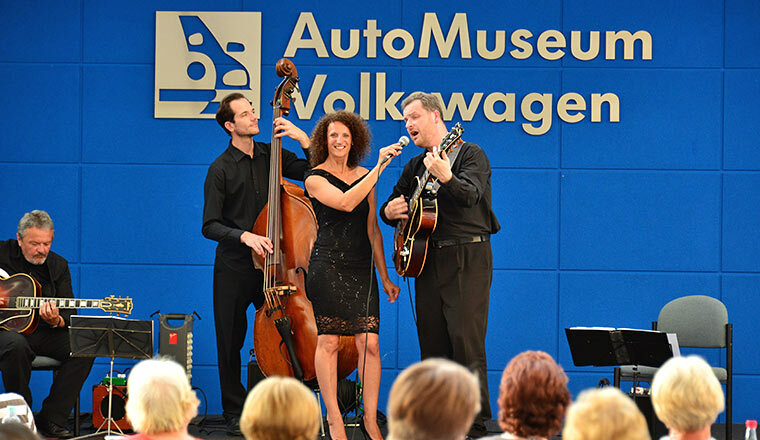 The four very accomplished musicians made a point of saying that they found the atmosphere in the Volkswagen museum extremely fitting. Petra Ernyei, in fact, once owned a Volkswagen Beetle herself. 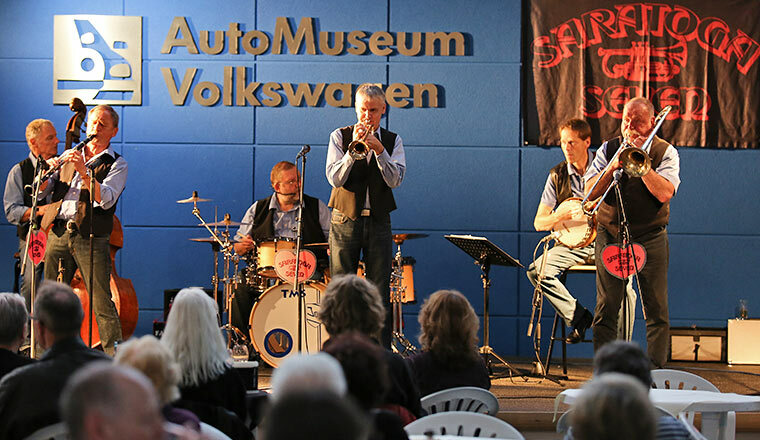 The next few concerts are already planned – on 25 September 2015, for instance, the Saratoga Seven jazz band will be appearing in the AutoMuseum. 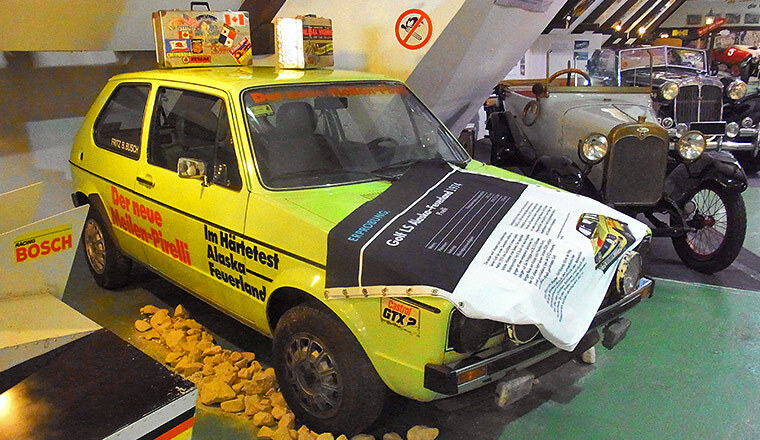 New traffic exhibition in the Dresden Transport Museum. 10 July 2015. 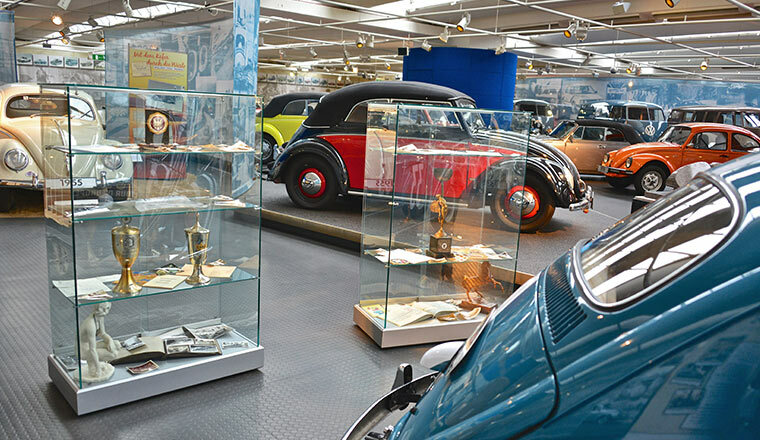 The Volkswagen AutoMuseum cooperates with numerous other museums, including the Dresden Transport Museum right next to the Frauenkirche in the centre of the city. On 10 July, a special exhibition opened there called 'Right of Way', which throws light on different aspects of road transport. In terms of vehicles with alternative drive systems, one of the highlights is a Golf Mk6 e-motion from 2010, which has been loaned to Dresden from Wolfsburg. And you learn something astonishing – that until the First World War ten per cent of all registered cars were electrically powered. Through the installation of a curved second level in the style of a 'fly-over', the extensively remodelled museum now brings together bicycles, cars and commercial vehicles in one single space of 1,000 m², having previously displayed them separately. 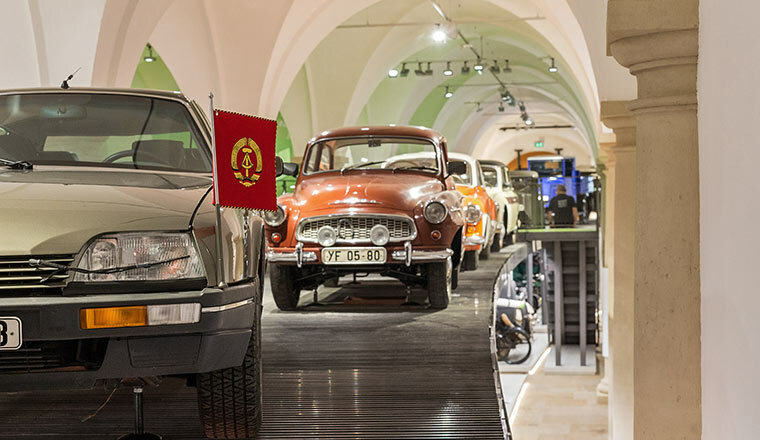 Another of the exhibition's areas of focus is the vehicle industry of the GDR. Interactive and geared to adventure, for example in the form of a 'Future Lab', the exhibition appeals to young people as well. More details: www.verkehrsmuseum-dresden.de. The museum 1302 at the Ohre Classic. 4 July 2015. 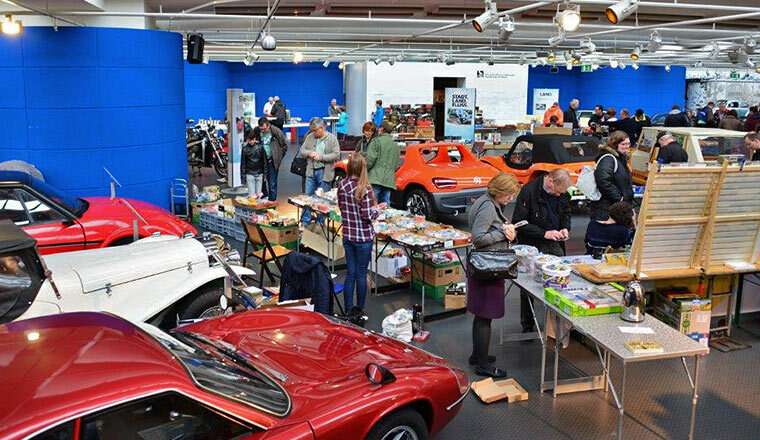 The AutoMuseum again attended the 7th Ohre Classic, a one-day classic rally in Saxony-Anhalt. 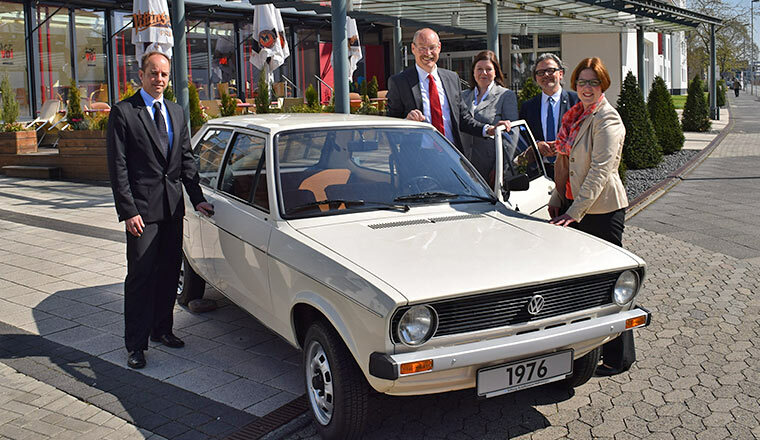 This time, Dr. Gunnar Schellenberger, Member of the Saxony-Anhalt Parliament (CDU), was at the wheel of the 1972 1302 Cabrio and with every kilometre he drove, he seemed to enjoy driving this car more and more. The route went from Wolmirstedt to the industrial port of Magdeburg, with its historic railway and chain tugboat, and continued over narrow, dreamy roads to the weir at Pretzien. The highlight of the tour was the Solepark Schönebeck with its spa gardens and the graduation works for producing salt. 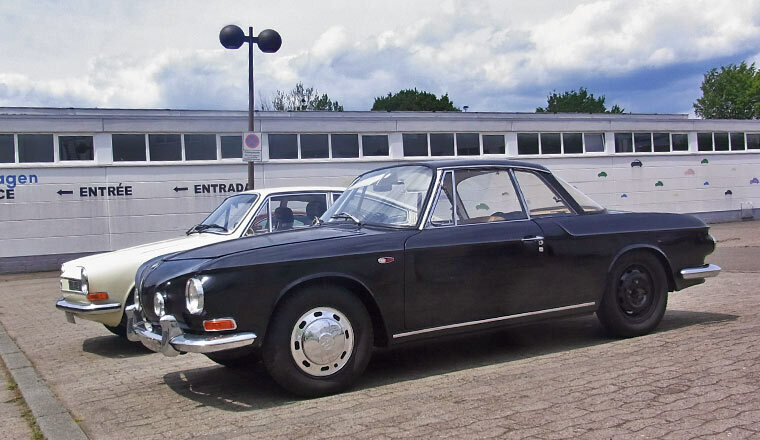 Among the 100 participants were also other Volkswagen cars, for example a VW Type 181 Trekker with a 1.6 litre inline 4-cylinder Passat engine installed at the rear. Felix Baumgartner "jumped" into the AutoMuseum. 2 July 2015. 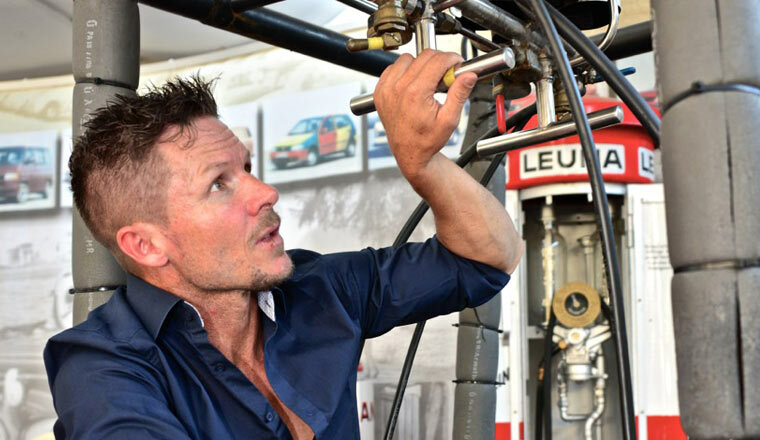 The Austrian stratosphere jumper and world champion Felix Baumgartner took two hours of his time for the AutoMuseum. The sky diver and base jumper arrived in Wolfsburg by helicopter which he flew himself. The trained car mechanic (his first car was a VW Scirocco) was amazed at the variety of classic Volkswagen cars on display. His special interest was aroused by the "Beetle hot-air balloon basket" – unfortunately it would never attain the altitude of 38,969 metres set by his world record pressurised capsule since there would be no oxygen to power the gas burners. 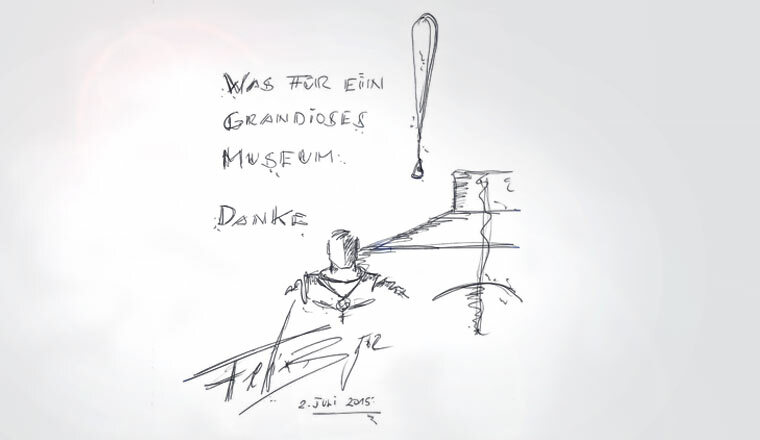 After the tour of the exhibition he gave thanks by writing in the guest book: "What a great museum." 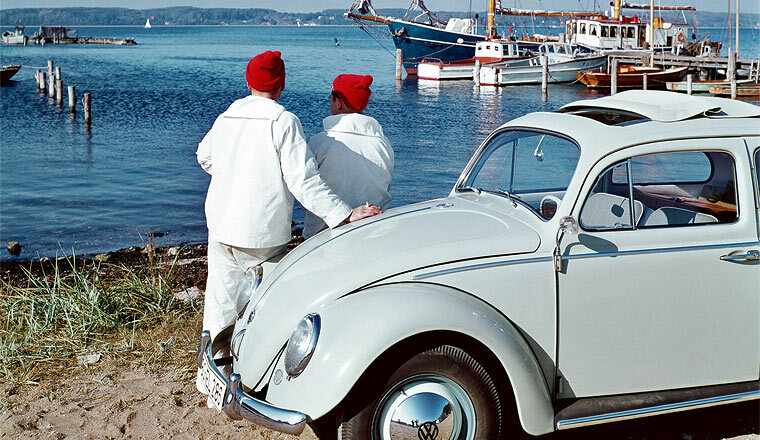 Volkswagen Calendar 2016 is available. A special visit to the museum for Robert. 25 June 2015. 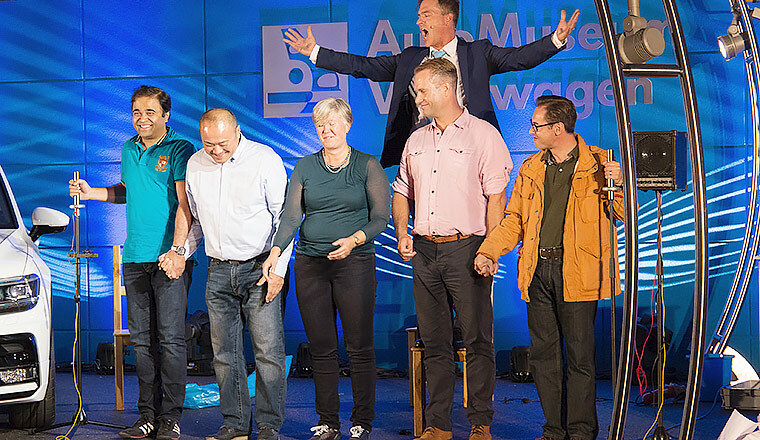 The international association Make-A-Wish (www.makeawish.de) grants the heartfelt wishes of children and young people diagnosed with life-threatening medical conditions. And that is exactly what it did for 17 year old Robert from the USA. 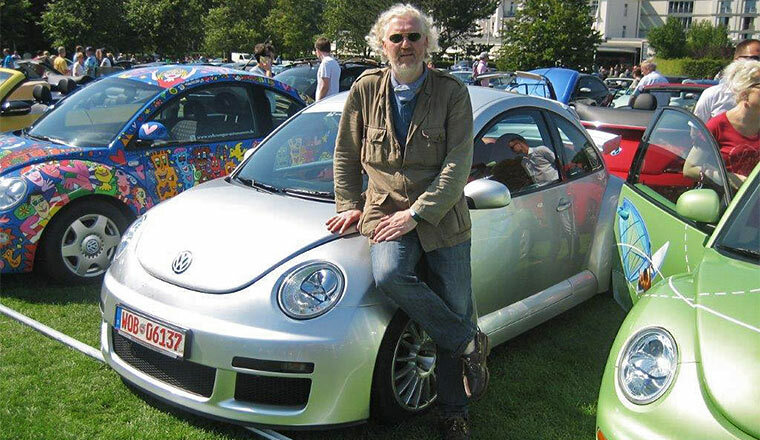 He is an avowed fan of the Volkswagen brand and is particularly fond of classic models. 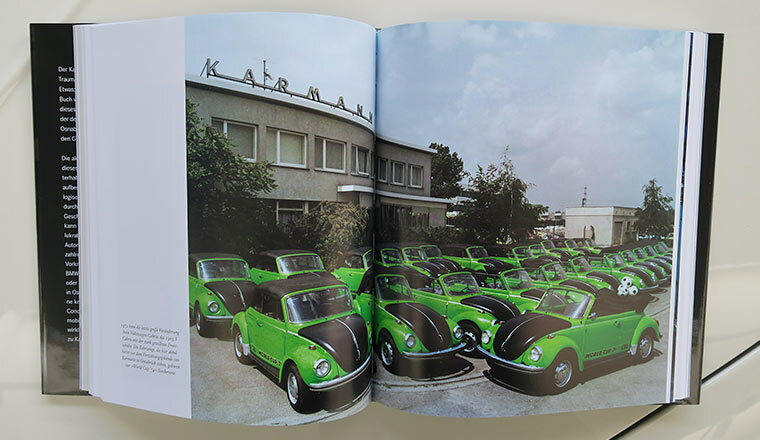 So Volkswagen employees put together a very special programme just for Robert and his family. 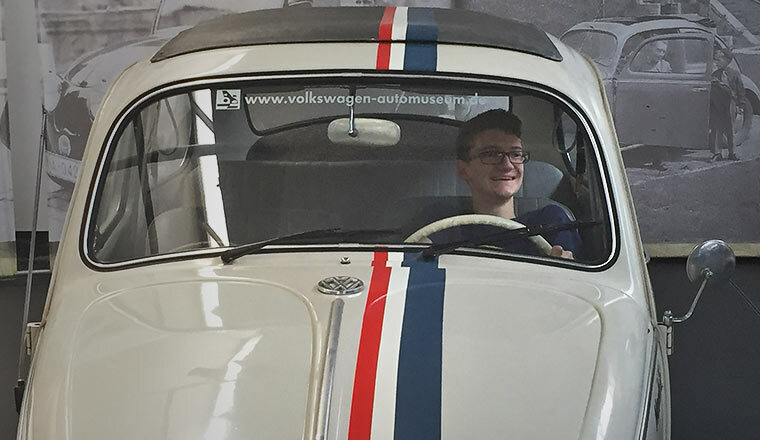 Besides a works tour there was a visit to the Autostadt (auto city) and the Volkswagen AutoMuseum. 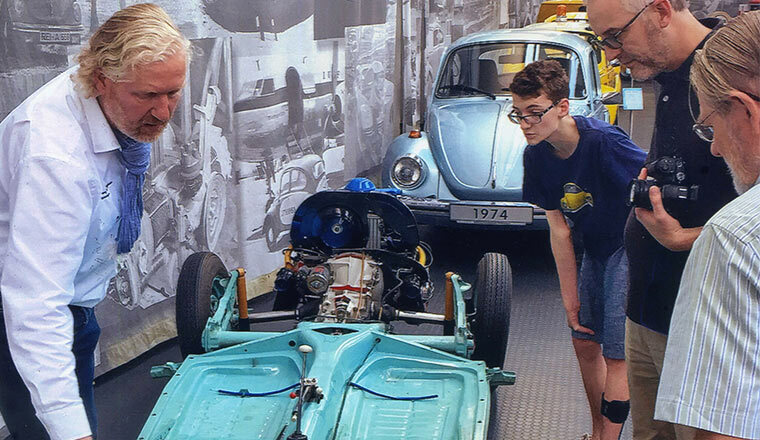 Robert experienced classic cars at close hand and was told many details about the exhibits by Eckberth von Witzleben, a museum employee who accompanied Robert during his visit. 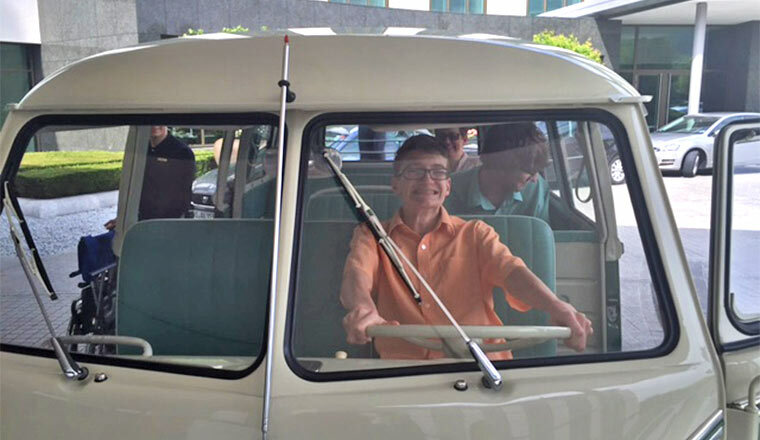 Robert was quite taken by the Samba Bus and was even allowed to sit at the wheel of Herbie. 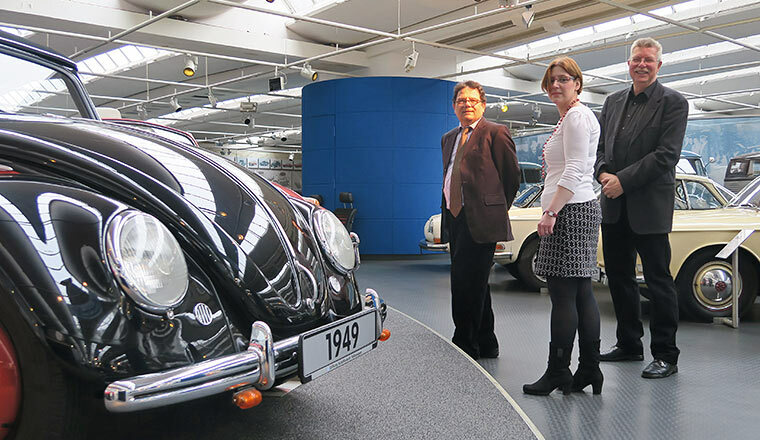 Management change at August-Horch-Museum Zwickau. 24 June 2015. 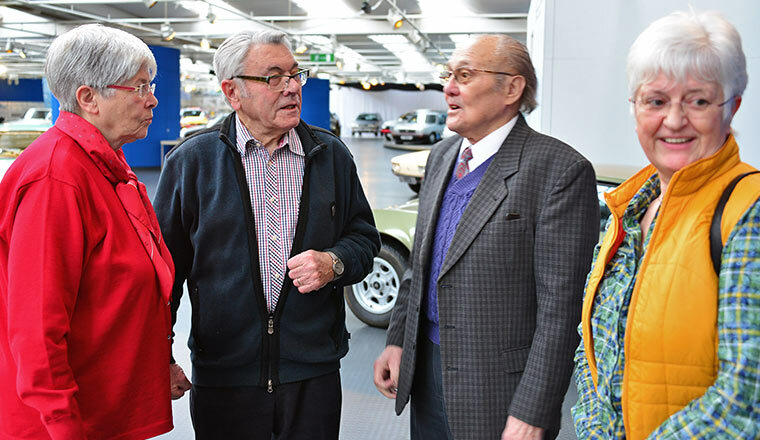 Rudolf Vollnhals (left), Managing Director of the August-Horch-Museum in Zwickau for one and a half decades and a good friend of the AutoMuseum, is retiring. 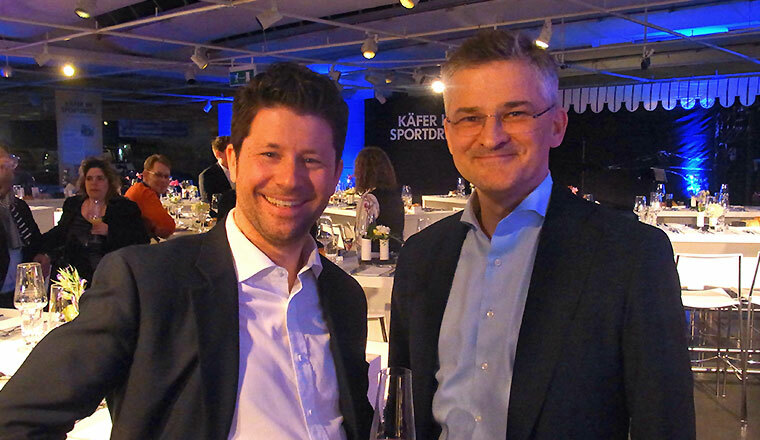 Taking over from him will be Thomas Stebich (right), current Head of the Audi Factory Museum in Ingolstadt. 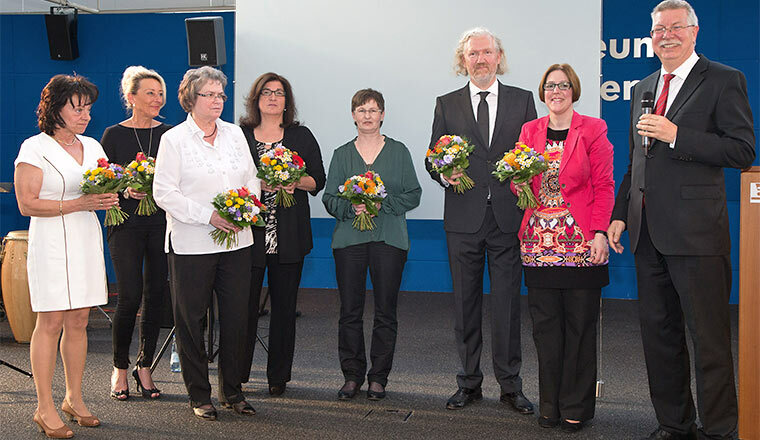 At a gala evening held at the iconic site in Zwickau congratulations also came from “August Horch” and his “Hermine” team – for years this group of actors have been providing an unusual rendering of the corporate history of the four rings. Visit from a Brazilian Volkswagen specialist. 23 June 2015. 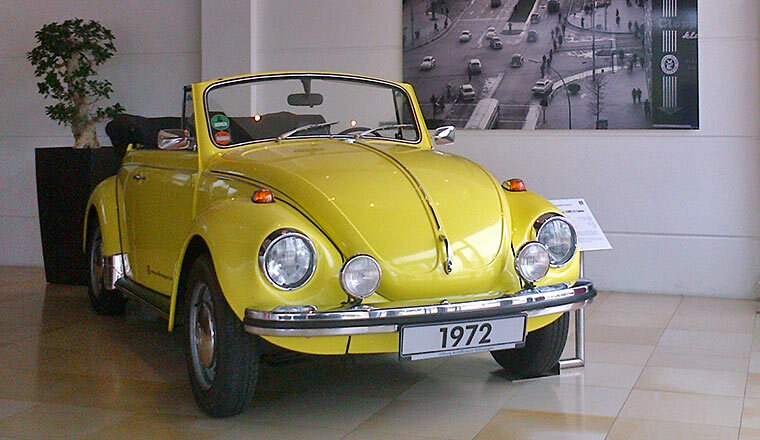 Alexander Gromow is no doubt the most knowledgeable expert on the history of Volkswagen in Brazil. 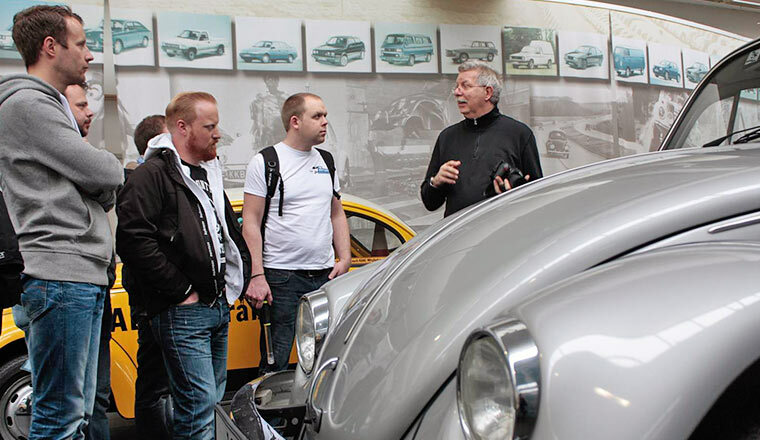 The former chairman of the Fusca Clube do Brasil and his team came as part of a tour through Germany (highlight: 10th Vintage VW Meeting in Bad Camberg) including a visit to the Mecca of Volkswagen fans – in Wolfsburg. Gromow has not only been promoting an initiative to mark the “World-Wide VW Beetle Day" (http://www.fuscabrasil.net/wwbd/Beetle-Day.htm), but has also published book and online contributions on Fusca, Brazil’s Bulli, SP 2 and Karmann TC 145 (www.fuscabrasil.net). 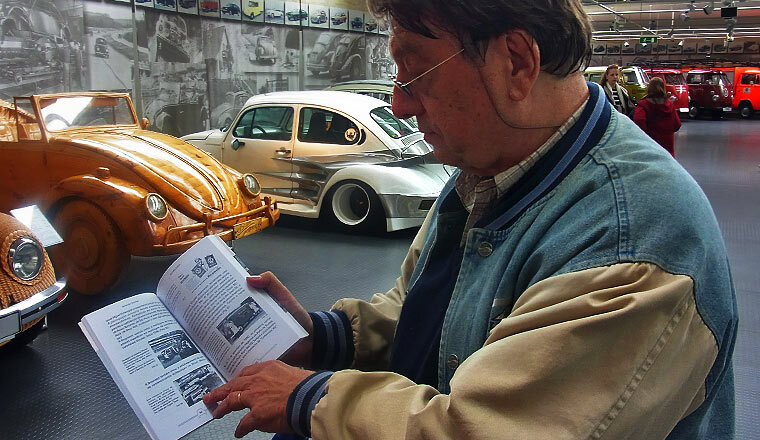 He donated his fascinating, richly illustrated brochure entitled “Eu amo Fusca” (I love the Beetle) and published by Ripress to the archive of the AutoMuseum. 18 June 2015. 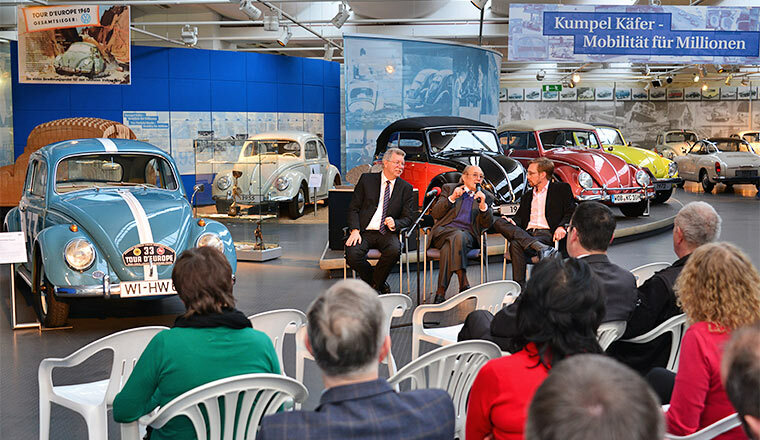 As part of a “contemporary witness” evening organised by the Volkswagen Management Association (VMA) and the Corporate History Department, founding director Dr Bernd Wiersch talked about the beginnings of the not entirely uncontroversial heritage work at Volkswagen. 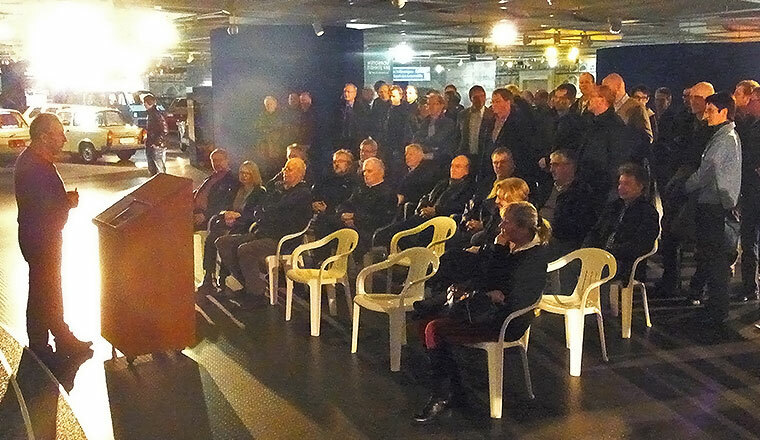 He was speaking about the commissioning of the AutoMuseum in the former Odermark factory 30 years ago and the often adventurous circumstances surrounding the procurement of the exhibits. 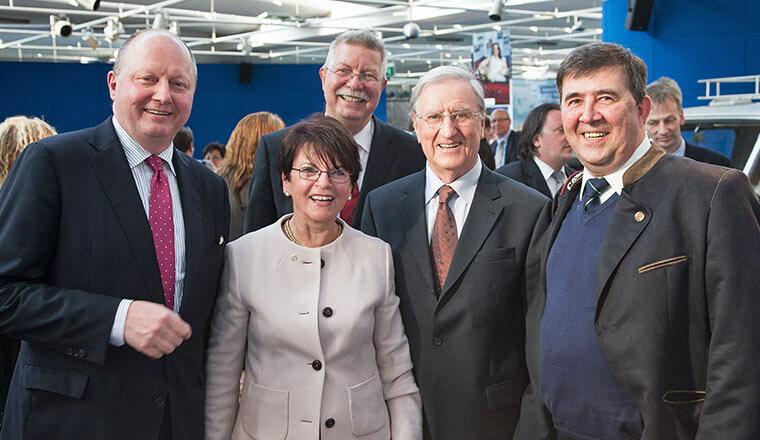 Among the approximately 40 invited guests were Dr Carl Hahn and Rolf Schnellecke (former Mayor of Wolfsburg). The only TC 145 from the UK. 18 June 2015. 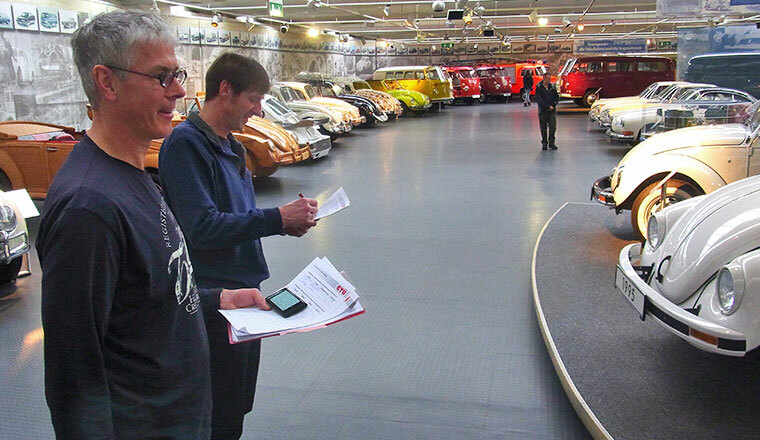 Two Volkswagen enthusiasts from the UK travelled over with a Karmann Ghia Type 34 and a TC 145 to view additional exotic exhibits from the brand’s history in the AutoMuseum. The TC 145 is the only one in existence on the British mainland, according to Mark Poulton, owner of the rare vehicle of which only some 18,000 were delivered in Brazil – none of which, officially, came to Europe. 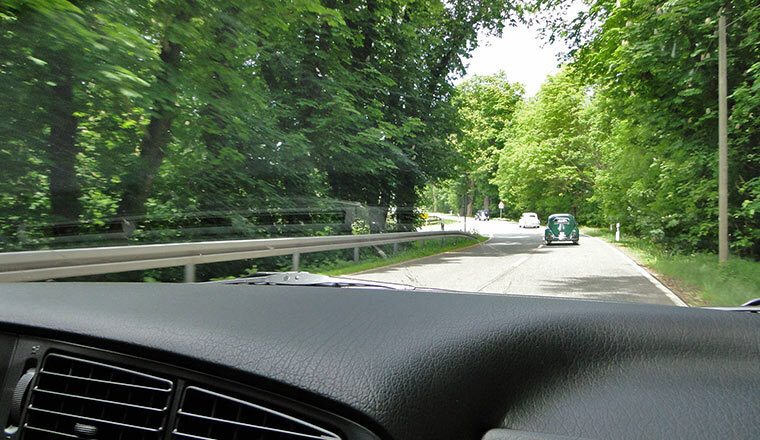 The two vehicles then travelled on to a brand meeting in Denmark – they have covered more than 1,500 km on this trip so far. 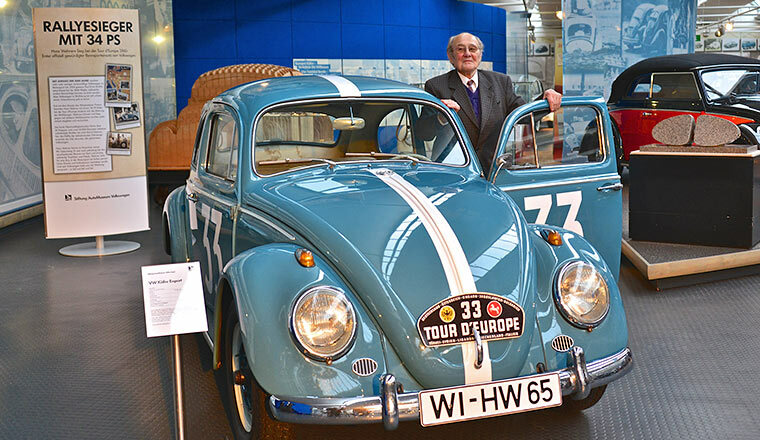 Mayor Klaus Mohrs in the AutoMuseum. 15 June 2015. 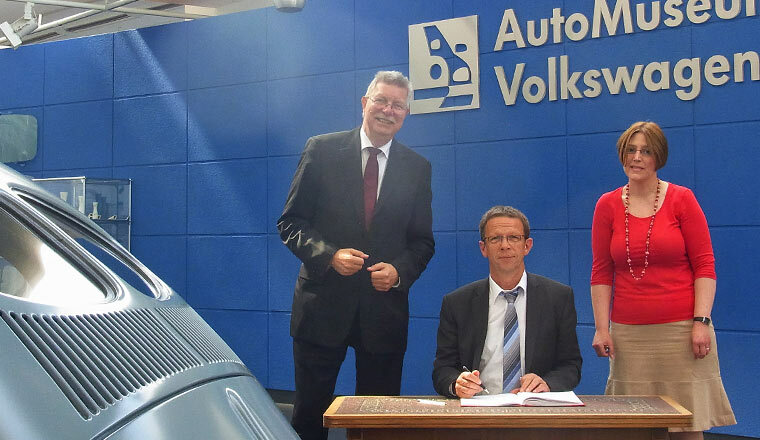 The Mayor of Wolfsburg, who has been in office since January 2012, paid a working visit to the AutoMuseum. 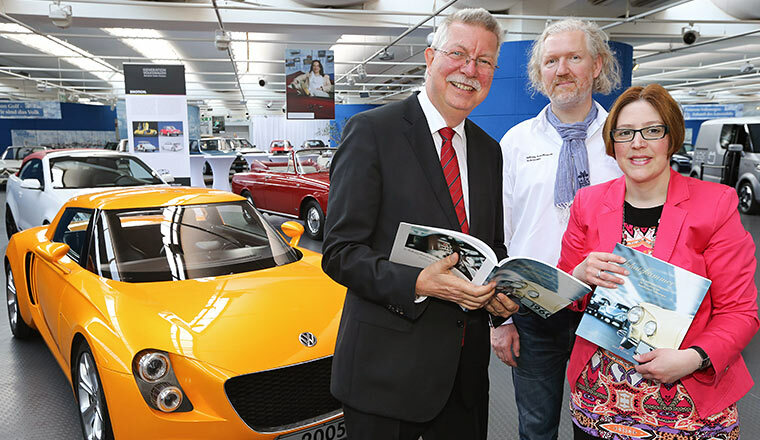 Together with Susanne Wiersch and Eberhard Kittler, he discussed ideas and projects aimed at achieving greater public awareness for the AutoMuseum within the city – and thus attracting more visitors to the region. 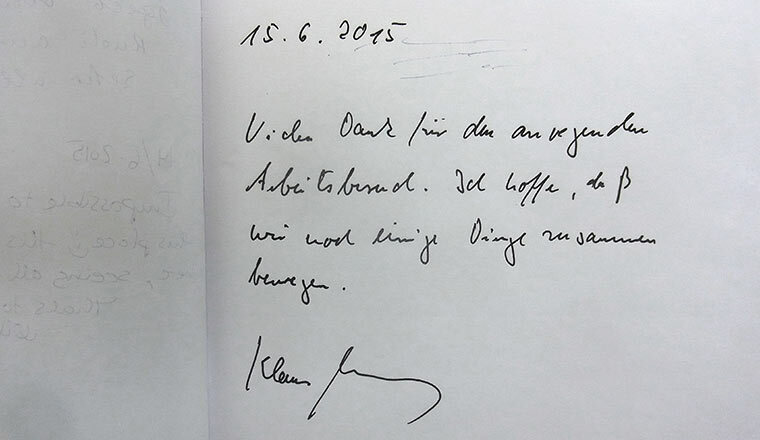 “I hope that together we will succeed in setting a number of things in motion”, thus read the entry that Klaus Mohrs left in the visitors’ book of the AutoMuseum. 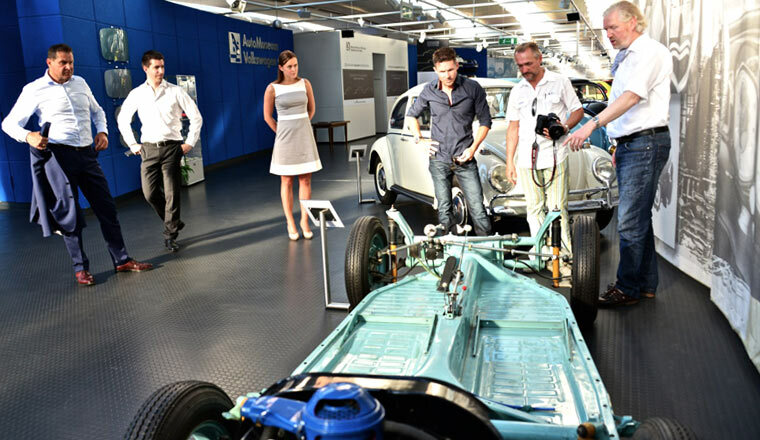 Autostadt employees explore the AutoMuseum. 10 June 2015. 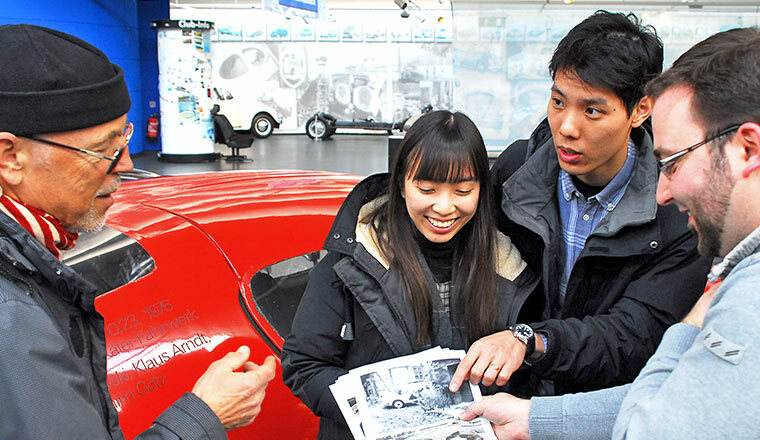 Interest and curiosity were clear to see in the faces of the 15 employees from the Deliveries team of the Autostadt. 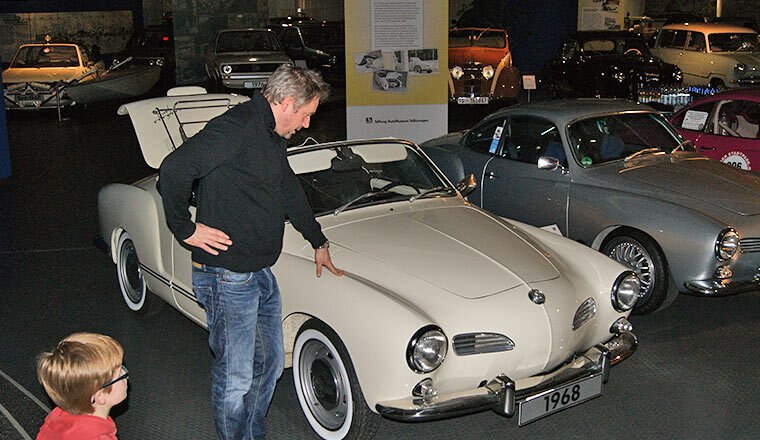 They were using their free time after work to pay a visit to the AutoMuseum Volkswagen. 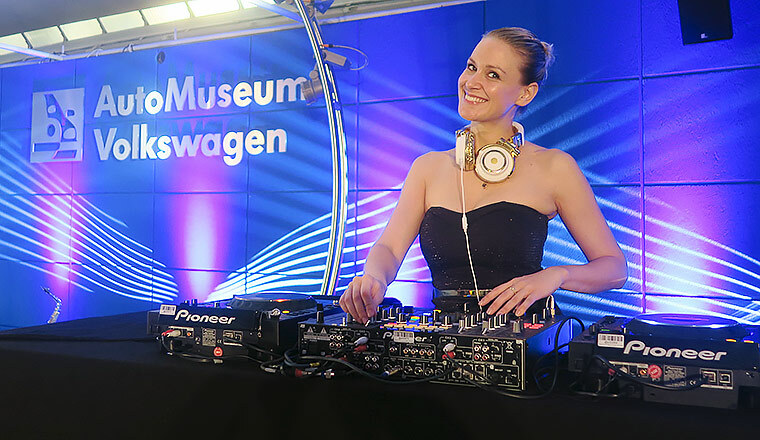 Susanne Wiersch guided the guests through the exhibition while explaining details of the Volkswagen brand product history and the exhibits in the museum. Inspired by the great wealth of rare Volkswagen models, all the employees were able to find their own personal favourits in the exhibition. 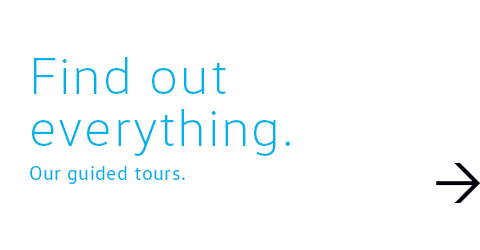 On the trail of a memorable tour. 30 May to 6 June 2015. 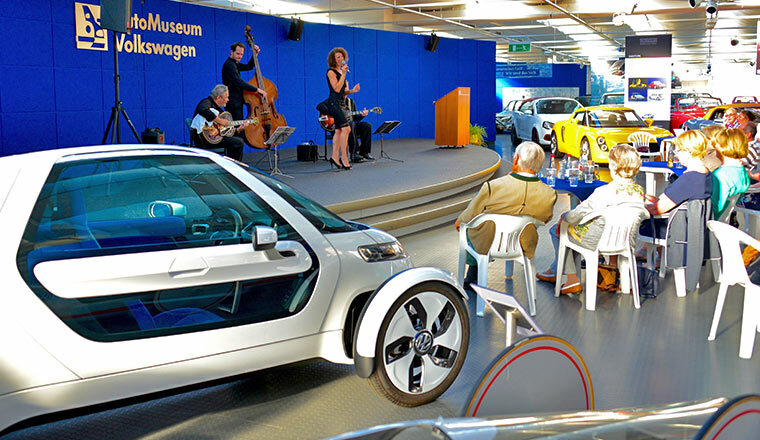 The Volkswagen AutoMuseum celebrated its 10th anniversary in 1995. 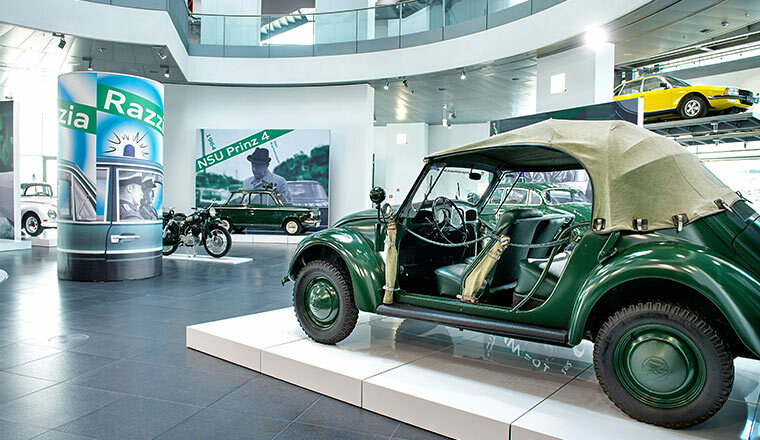 In the same year, the Skoda Museum was opened in Mlada Boleslav. 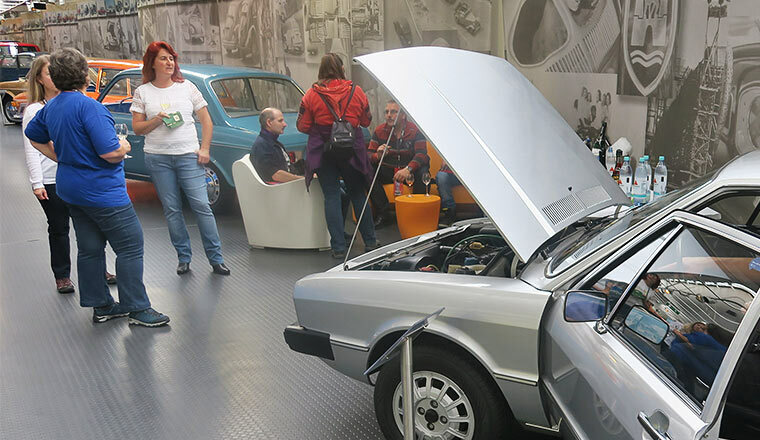 The Management Board of the AutoMuseum at the time invited several aficionados of classic cars from the Volkswagen Group to go on a special tour: from Wolfsburg over scenic rural roads to Mlada Boleslav where the classic cars arrived in time for the opening. 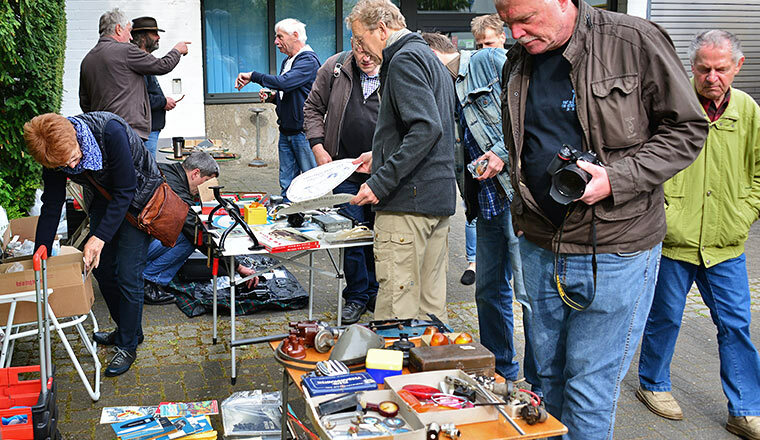 Since then, the former group has met every two years with their classic cars to explore particularly worthwhile regions in Germany and neighbouring countries. 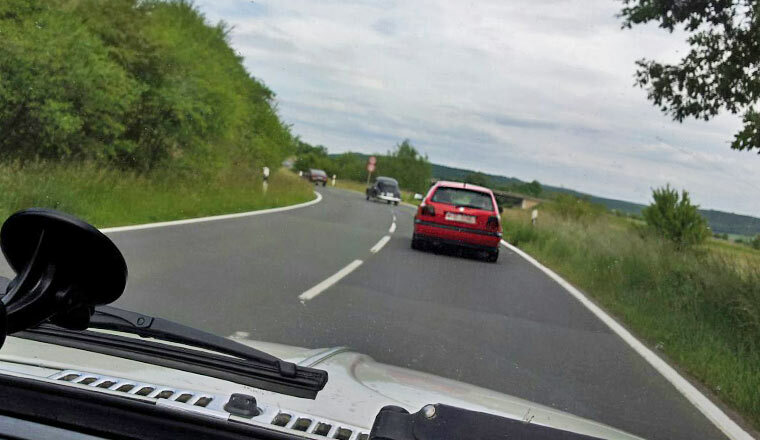 This year, the 20th anniversary since the start of the tour, the route went through Central German area around Nebra and the Thuringian Forest. 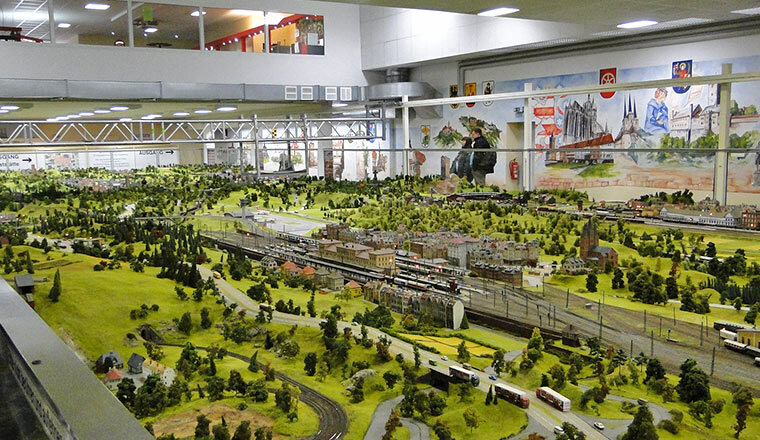 Besides demanding sections through extremely scenic and charming rural areas, the programme included numerous cultural highlights such as a visit to Arche Nebra, the site where the Nebra sky disc was found, the Model Railway World in Wiehe - a journey through the countries and cultures of the Earth - and a visit to the glass-blowing factory in Lauscha which is steeped in tradition. 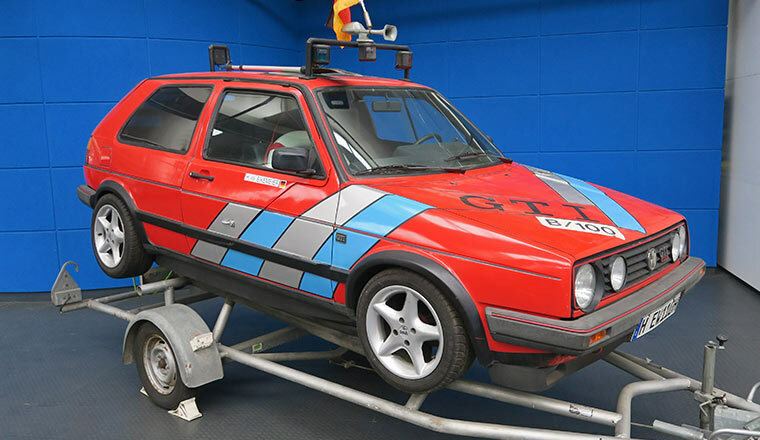 The AutoMuseum also took part in 2015 – with a rare special edition of the third generation Golf GTI. 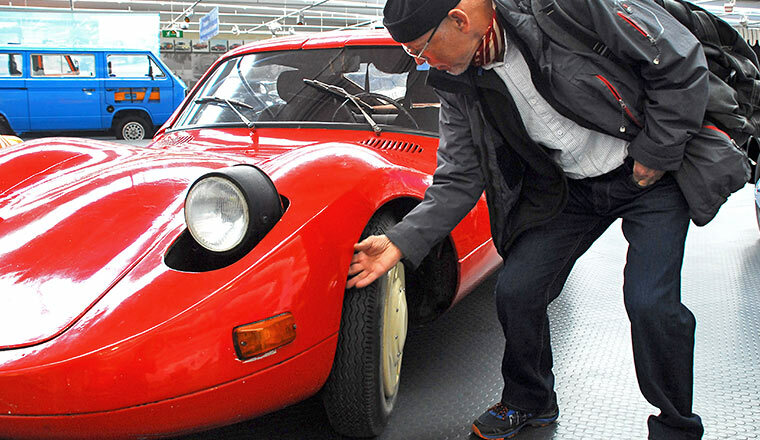 AutoMuseum hosts the Rally 604. 6 June 2015. 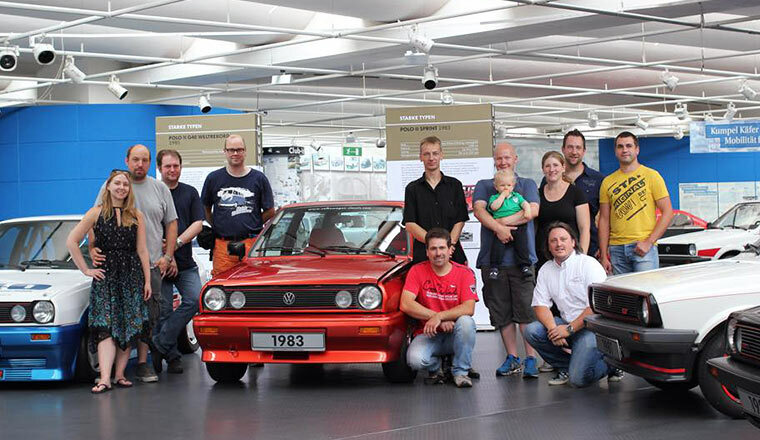 This year, a field of around 60 participants travelled to Wolfsburg to attend the four-day iconic ‘Rallye 604’ for modern and vintage classic cars – and to celebrate the 40th anniversary of the VW Polo. 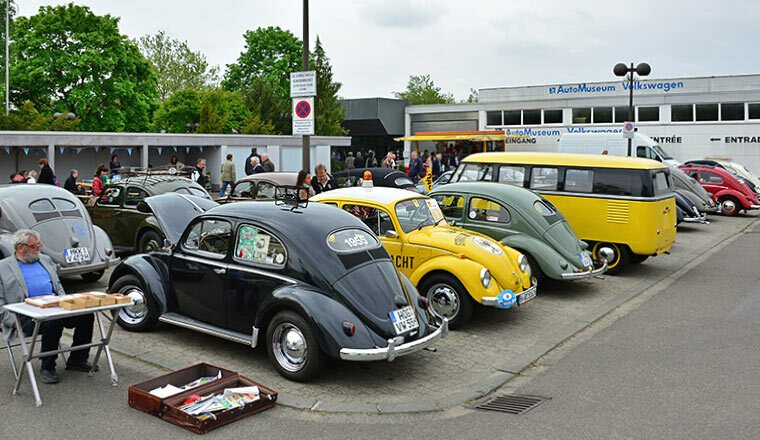 All participants were perfectly serviced by Volkswagen Classic Parts. A special highlight for the fans was a 1994 T3 Claer tuned model sporting a Porsche engine. 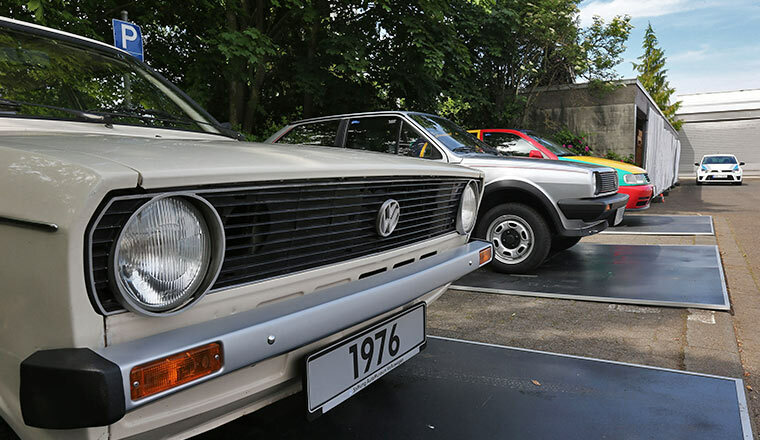 Volkswagen prepared a special stage at the AutoMuseum which was a surprise for the Volkswagen drivers. It will reveale further along the line. Última Edición fans at AutoMuseum. 22 May 2015. 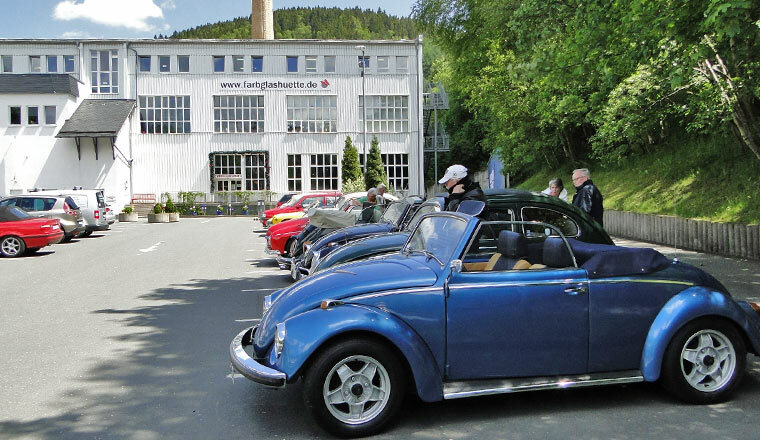 As part of their Whitsunday trip to Wolfsburg, about 120 members of the VW Beetle club Última Edición e.V. were guests at AutoMuseum Volkswagen. 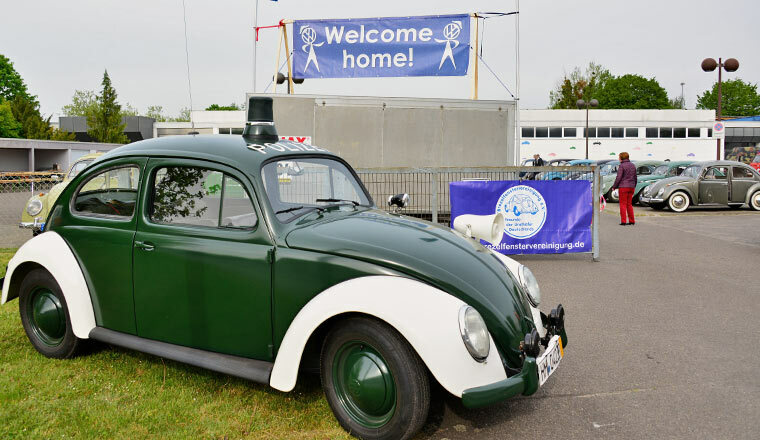 The highly committed club now also welcomes drivers of older Beetles (oldest member vehicle of 1946) – that is why the expert visitors showed an equal interest in exhibits such as this 1943 Beetle with pretzel window. All VW prototypes at a glance. Classic Beetles at the AutoMuseum. 14 to 17 May 2015 . On the Ascension Day bank holiday weekend some 130 “Pretzel Beetles” with their split rear screens and the next-generation “Ovali” Beetles made the pilgrimage back to their birthplace. 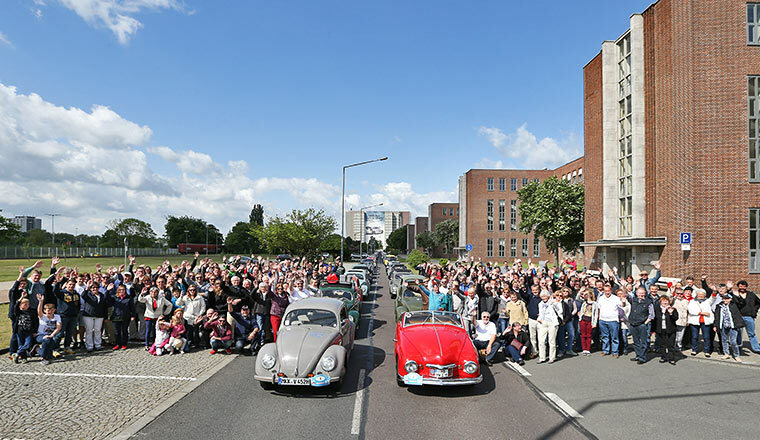 They were responding to the invitation from the Brezelfenstervereinigung e. V. (BfV), the Pretzel Window Club, to come to Wolfsburg for a joint celebration of its 40th anniversary. 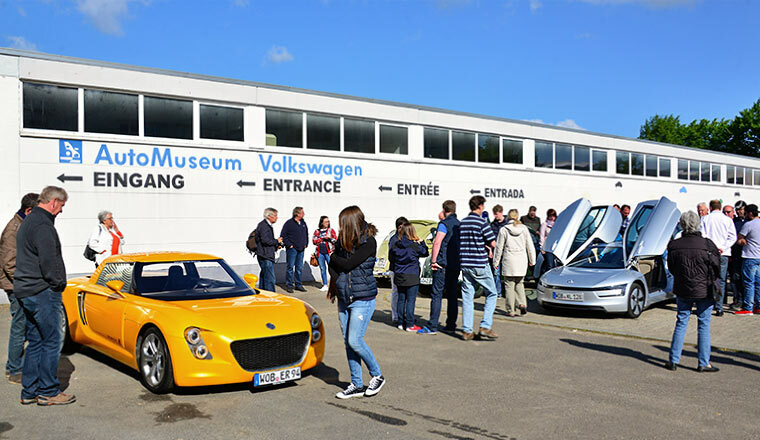 The start and finish for all the Club’s activities was the AutoMuseum Volkswagen, where attendees were visibly enjoying themselves and closely examining the evolutionary history of “their” Volkswagen classic. 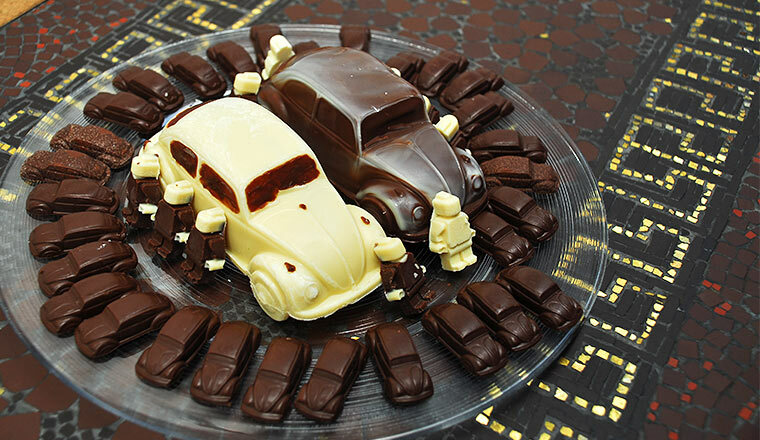 Members of the Käferclub Wolfsburg e. V. (the Wolfsburg Beetle Club) supplied the refreshments for their friends from the BfV. 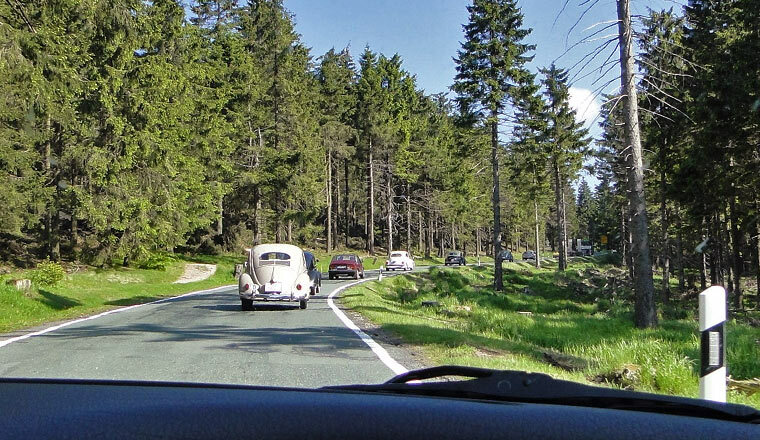 In glorious sunshine, the participants set off on Friday from the AutoMuseum on their 120-km excursion through the Elm hills to the former border crossing into East Germany at Marienborn. 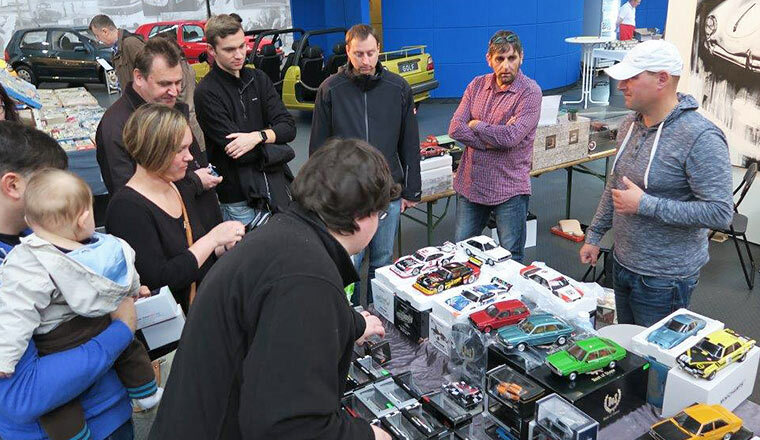 Saturday morning was the occasion for the traditional spare parts market and the presentation of the Beetles at the AutoMuseum. 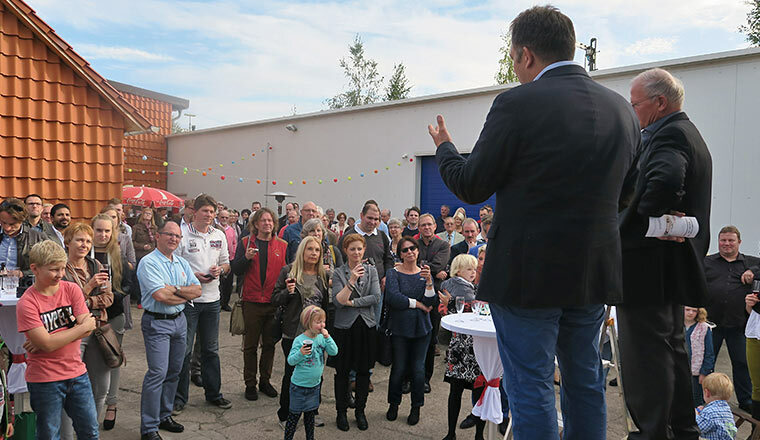 It was pleasing to see so many residents from Wolfsburg among the visitors. Younger members of the public were also visibly impressed by the swarms of Beetles. 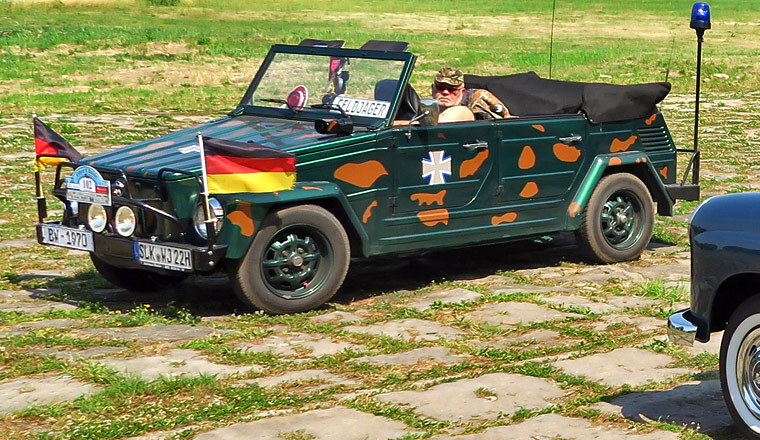 Even some of the amphibious Schwimmwagen models came into their own and were allowed to take a dip in the Allersee lake. The finale and highlight came with the grand parade of ancient arthropods through the factory grounds, where almost all the Beetles had rolled off the assembly line back in the 1950s. Also included were photo opportunities against a historic background on the southern road through the plant. 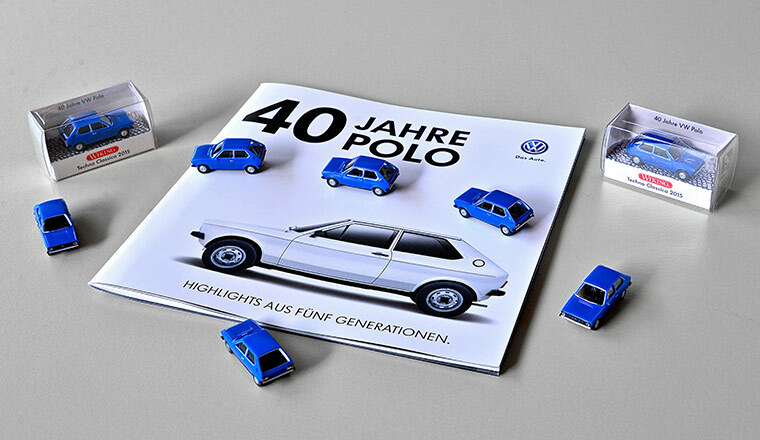 40 Years of the Polo: Booklet and special edition model by Wiking available. Flying visit at partner museums in southern Germany. 8 May 2015. 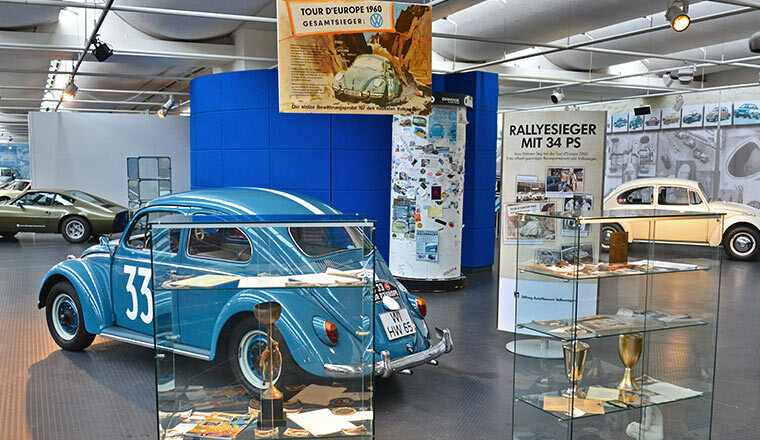 AutoMuseum also does a little self-promotion by advertising in the Allgäu region – with a Beetle on loan to the Isergebirgs-Museum in Kaufbeuren and a recently returned Golf legend at the Busch-Museum in Wolfegg. The Czech-Bohemian city of Gablonz (today Jablonec) was famed mainly for its glass jewellery. Its German population relocated to Germany after the war and found a new home in the Allgäu region. 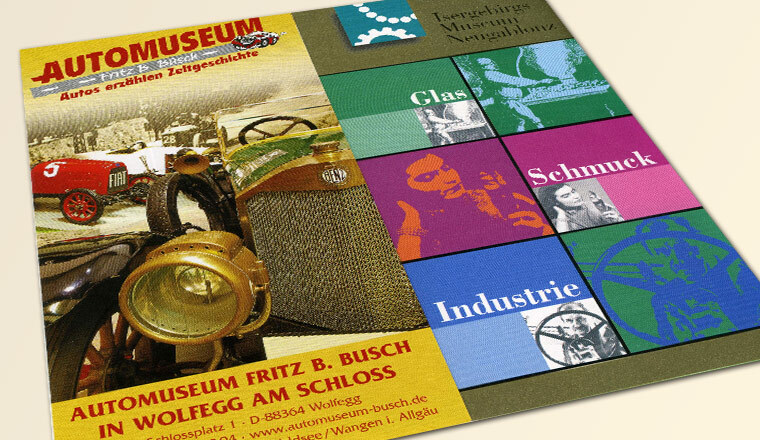 The Isergebirgs-Museum (Marktgasse 8, 87600 Kaufbeuren-Neugablonz, www.isergebirgs-museum.de) showcases the local and industrial history of the town at the foot of the Jizera Mountains (Isergebirge) – and one of the themes deals with local automotive pioneers, especially Ferdinand Porsche. The 1954 Ovali Beetle brings him to mind. 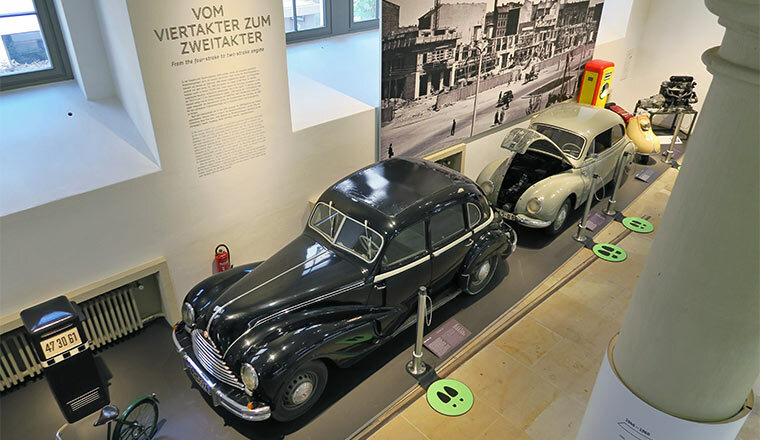 The car is also a promotion for people to come and visit the AutoMuseum in Wolfsburg. 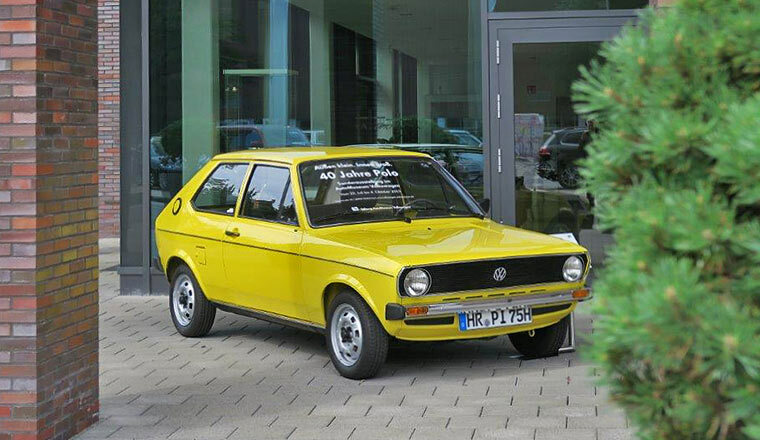 The city of Wolfegg, 100 kilometres to the west of Kaufbeuren, is where the legendary Automuseum Fritz B. Busch is located (Schlossplatz 1, 88364 Wolfegg, www.automuseum-busch.de): This is the spot where the yellow Golf I has returned to. 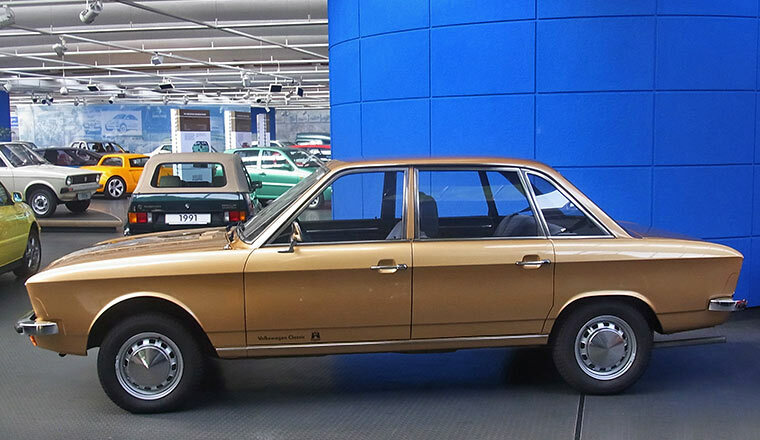 This car did the Alaska-Patagonia long-distance drive in 1974 and, together with its sister model, became the star of the "40 Years of the Golf" exhibition at the AutoMuseum. Sweet birthday presents for the thirtieth anniversary of AutoMuseum. 4 May 2015. 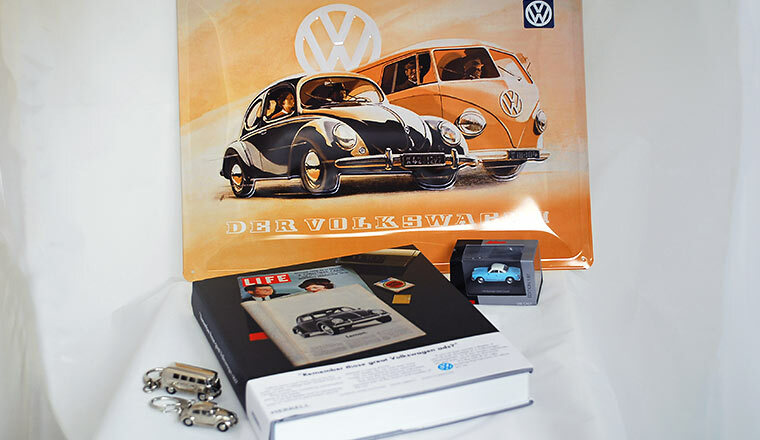 Numerous good wishes and gifts arrived in time for the 30th birthday of AutoMuseum Volkswagen. 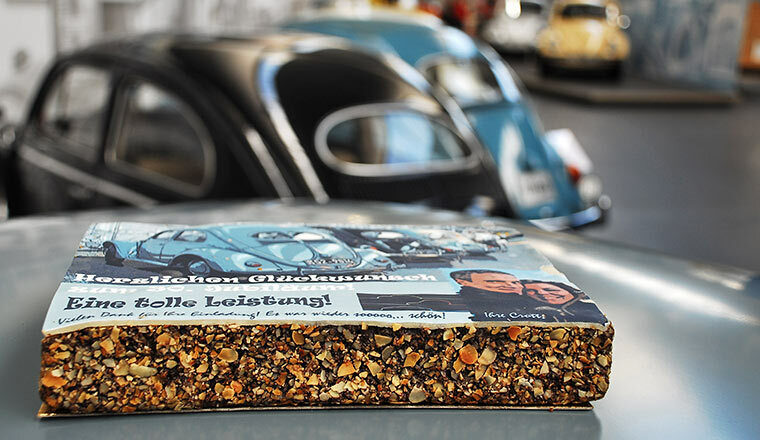 The most original gifts came from very dear friends in Wolfsburg and Aachen: Pablo Rother, colleague at the Zeithaus of Autostadt, shaped with his own hands two gorgeous chocolate Beetles and sent a hello with them, also on behalf of Nicole Rihmland and Bettina Heese. 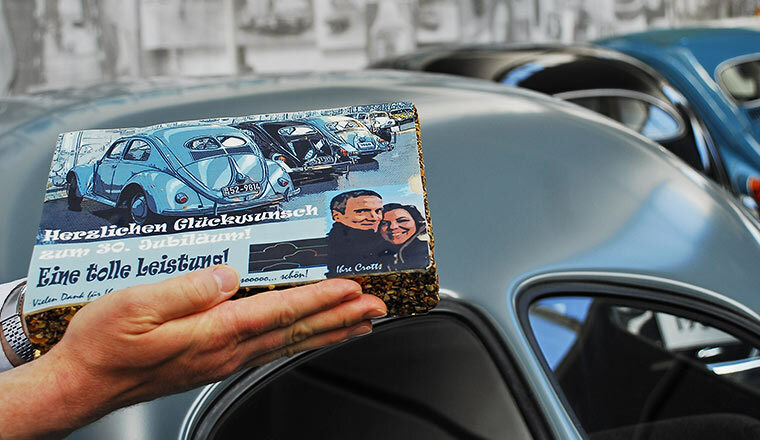 Markus and Ulrike Crott – donors of the red Golf III GTI Edition – surprised everyone with suitably branded Aachener Printen, a gingerbread speciality from their hometown of Aachen. A big thanks for all the great gifts! 24 April 2015. 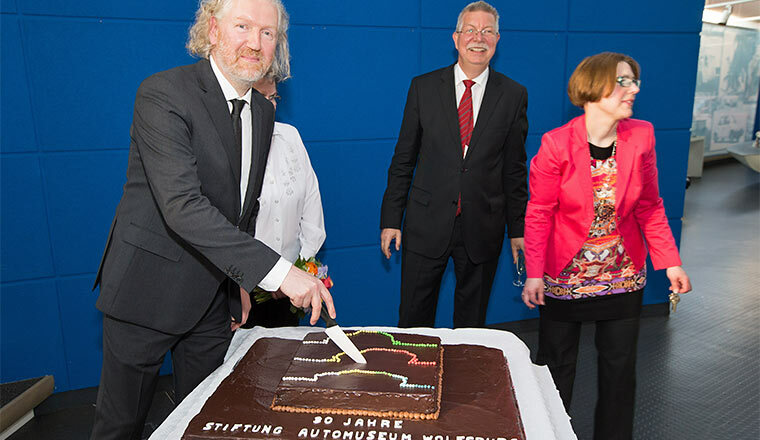 Some 150 guests attended an evening ceremony in Dieselstraße to celebrate the 30th anniversary of the AutoMuseum. 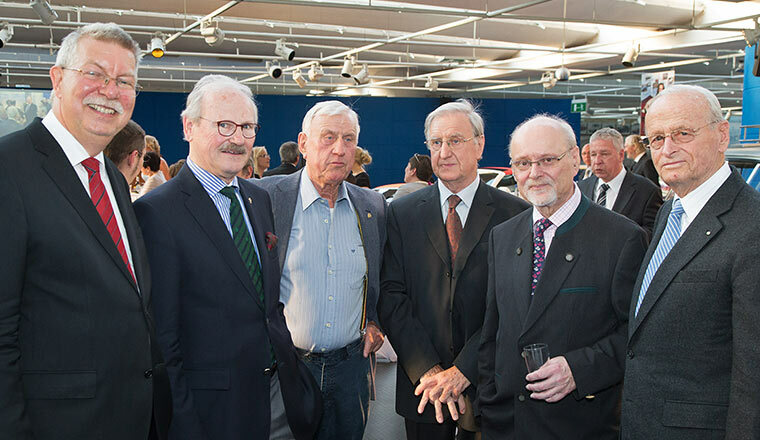 The guests included Dr. Carl Hahn, Anton Konrad (former PR Director at VW), Otto-Ferdinand Wachs (Managing Director of the Autostadt), Thomas Schmall (member of the VW Board of Management, Components and member of the museum’s Advisory Board), Jens Hermann (VW Plant Manager, Wolfsburg) and former Museum chairmen Dr. Bernd Wiersch, Horst Beilharz and Dirk-Michael Conradt. 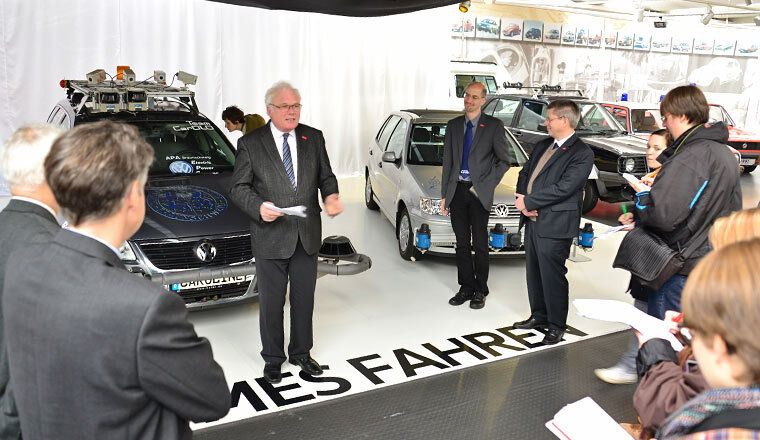 Also in attendance were members of the Wolfsburg City Council and representatives from Volkswagen clubs. Entertainment was provided by the musical trio Flor de Luna. Two exhibitions will run at the museum until 12th July. The first is a photo series initiated by the autogramm employee magazine, masterfully produced by Frank Bierstedt and Matthias Leitzke that shows 30 employees with their favourite automobiles. 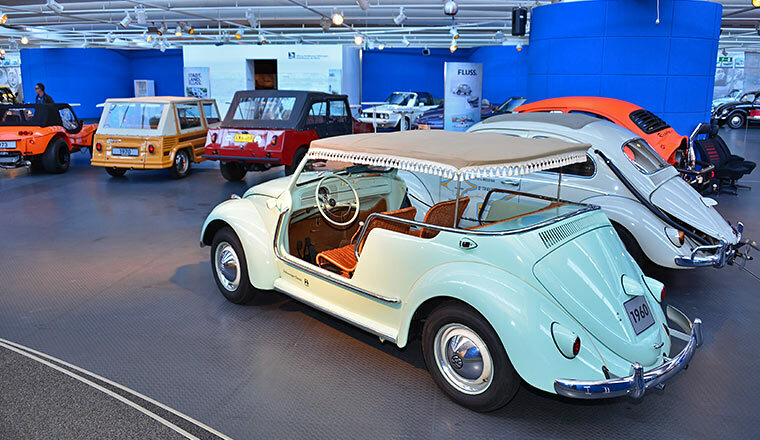 The second exhibition – “Generation Volkswagen” – features 16 prototypes, concept cars, one-of-a-kind models and extremely limited editions, including vehicles on loan from Volkswagen Classic, Volkswagen Research, Volkswagen Design and Volkswagen Commercial Vehicles. 24 April 2015. 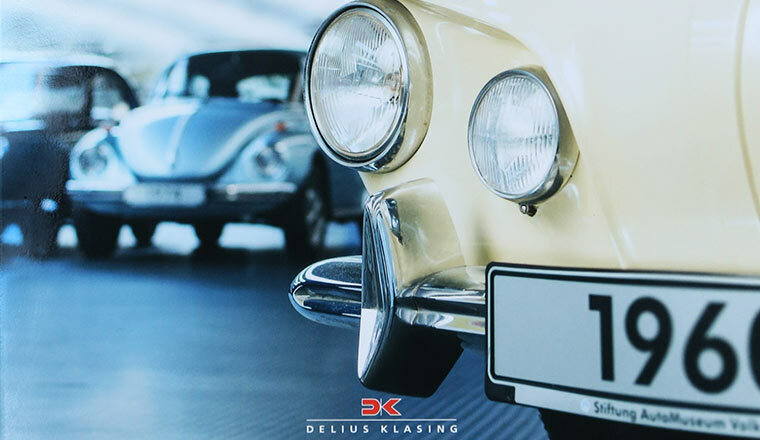 The new 128-page museum catalogue, “Schatzkammer - die wichtigsten Exponate der Sammlung des AutoMuseum Volkswagen” (Chamber of treasures: The most important exhibits from the AutoMuseum Volkswagen collection), has now been published with friendly assistance from the Delius Klasing Verlag publishing house. 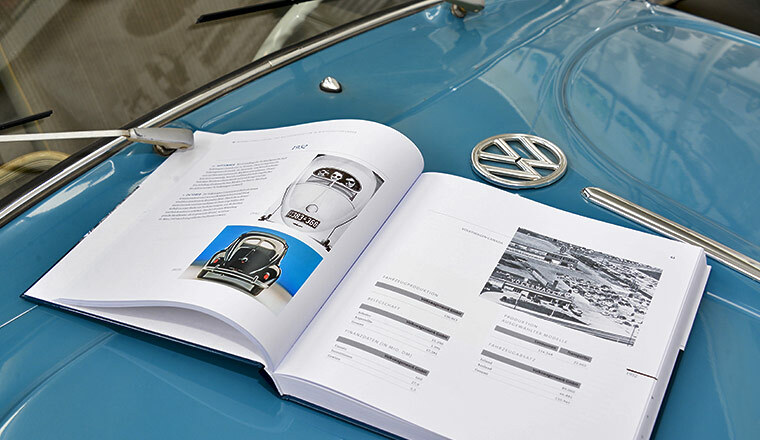 The catalogue presents and describes more than one hundred of the most attractive vehicles in the AutoMuseum, complete with English translations. The new catalogue is the first one of its kind since 1995. The publication (978-3-667-10260-7), which contains numerous photographs, is available at book shops and in the museum shop for €16.90. 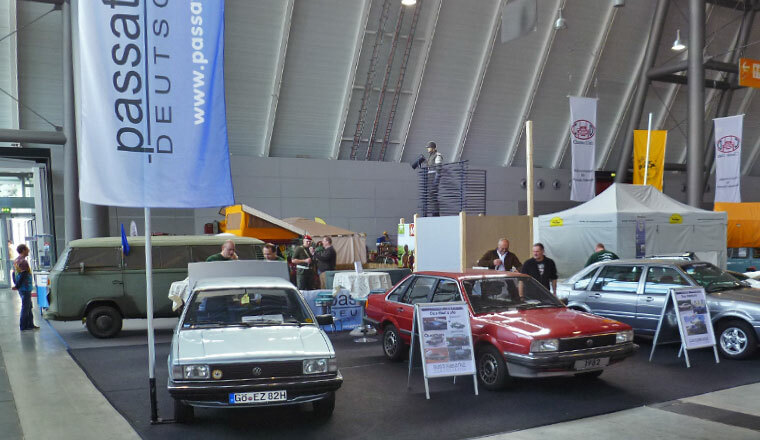 Volkswagen Classic and AutoMuseum celebrate 40 Years Polo on Techno Classica. 15 - 19 April 2015. 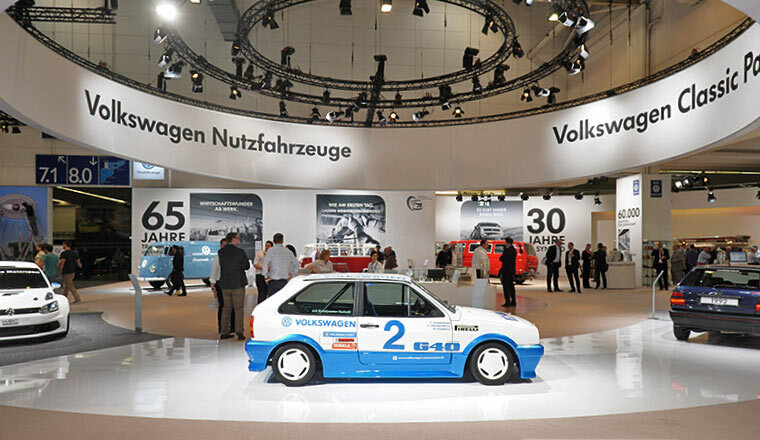 The Volkswagen stand at this year's Techno Classica was dedicated to the topics of 65 Years of T1 Production, 30 Years of T3 Syncro and 40 Years of VW Polo. 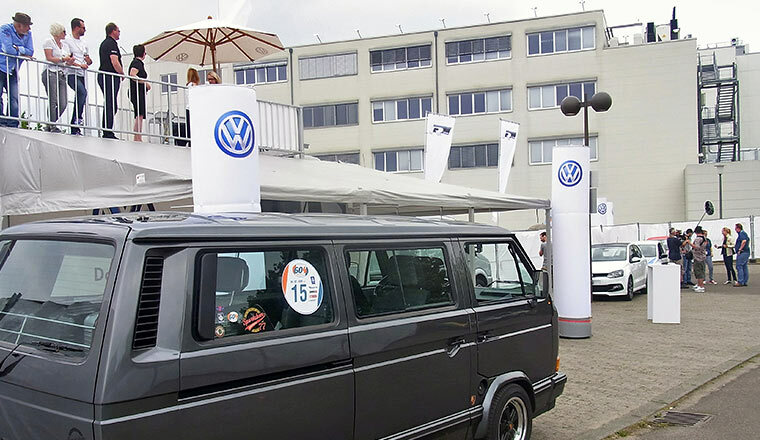 The stand was jointly organised by Volkswagen Commercial Vehicles Classic Cars, Volkswagen Classic Parts and Volkswagen Classic in collaboration with the Volkswagen AutoMuseum Foundation. 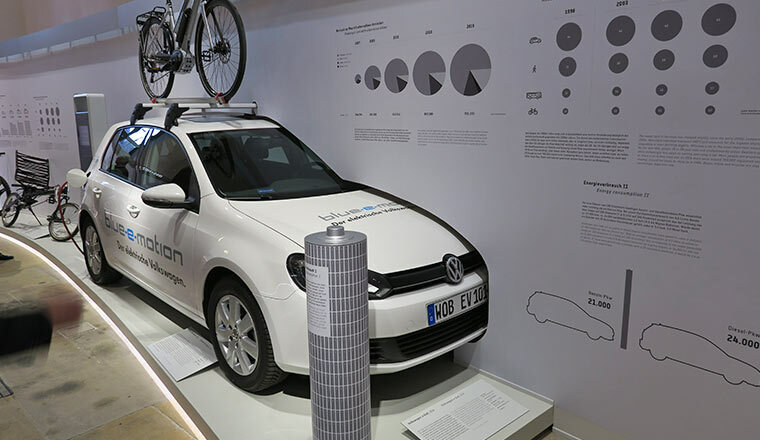 Two of the five Polo exhibits presented, the VW Polo OpenAir and the VW Polo G40, stem from the Foundation's collection. 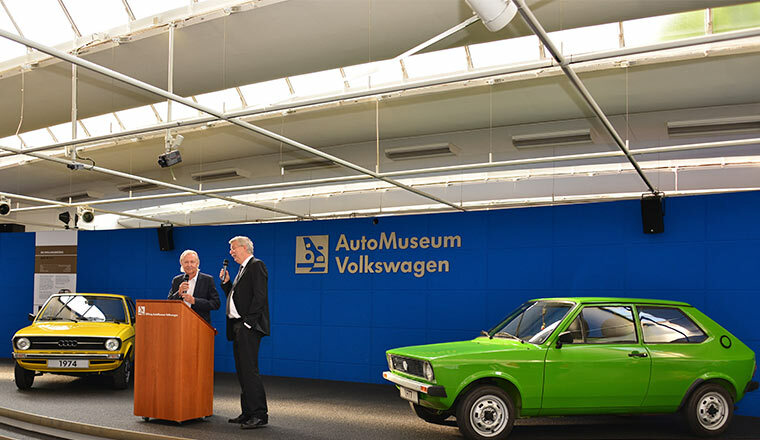 They rounded off the picture of the 40 year Polo success story with a Polo from model year 1975, a Polo Type 87 coupé and a WRC Polo which all drew visitors like magnets. 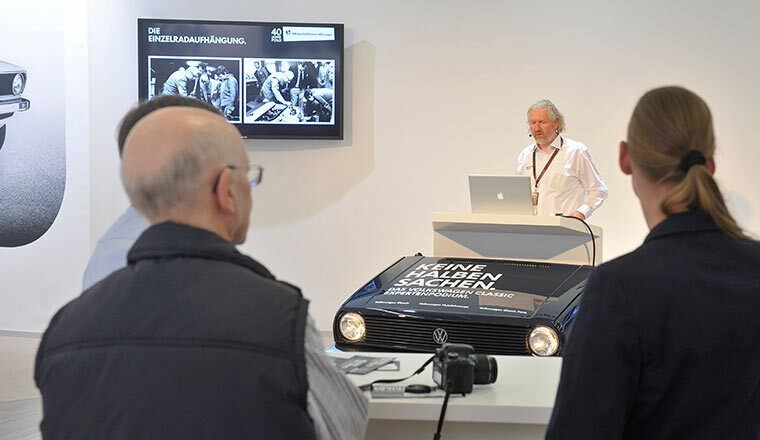 An additional highlight besides technical lectures on topics such as restoration, the Syncro and the Polo history was an autograph and photo session by the famous world racing car champion Hans-Joachim Stuck, nicknamed "Striezel". 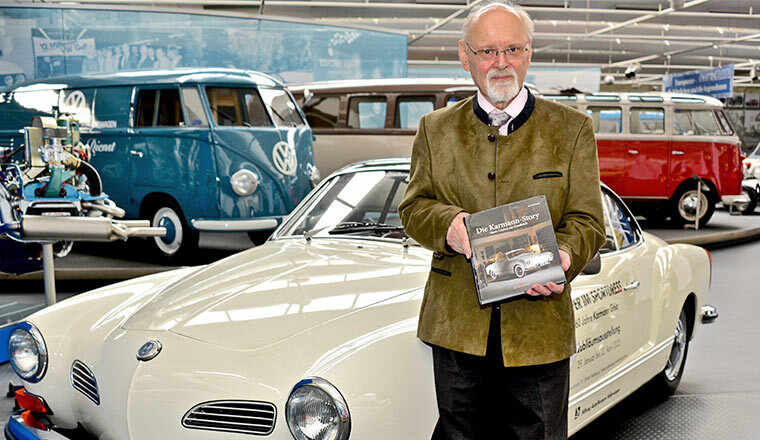 He signed books and autograph cards and with his unassuming manner, he allowed himself to be photographed with stand visitors next to a VW Polo of their choice. 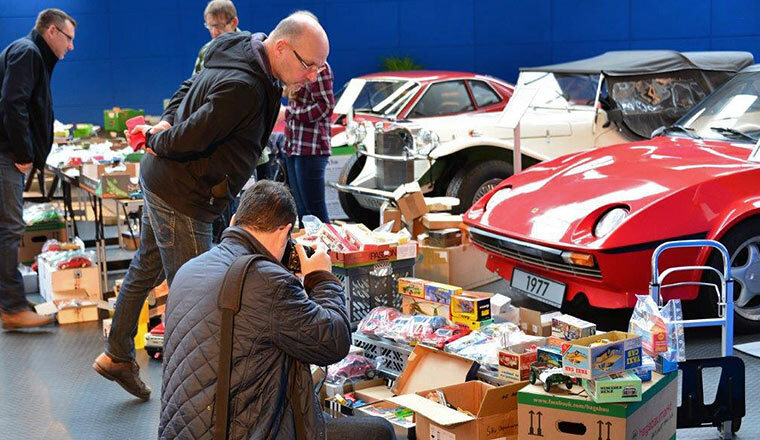 Over the five days of Techno Classic, everything took place in the special atmosphere that is intrinsic only to this classic car fair and which must really be experienced to gain the full impression. Polo impressions at the Global Inn Hotel. 15 April 2015. 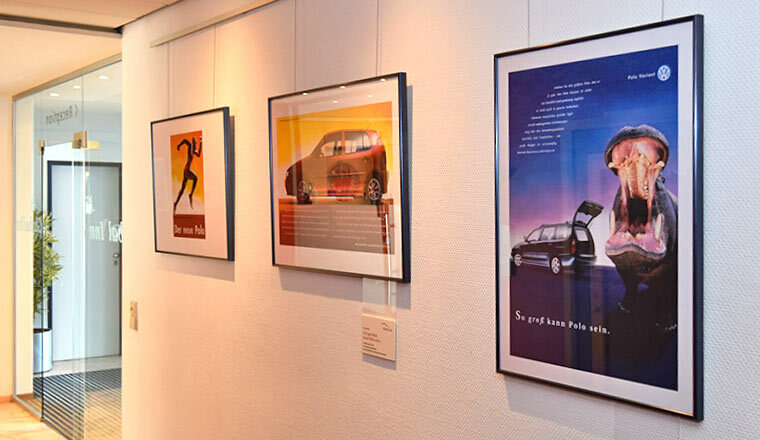 The guests of the Global Inn Hotel in Wolfsburg will be delighted over a very special exhibition. 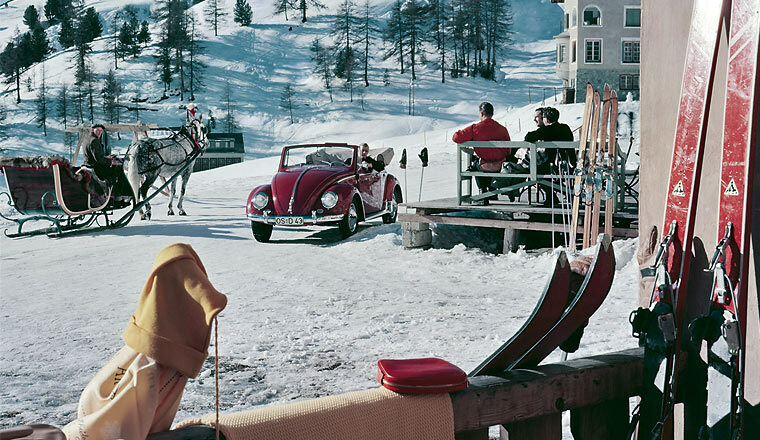 In cooperation with Historical Communications of Volkswagen, Volkswagen Immobilien presents an exclusive Polo picture gallery. Not only the 40-year-old tradition of this young-at-heart model but also the zeitgeist of its respective generations is reflected in advertising, contemporary genre photos and pictures from the Polo fan scene. 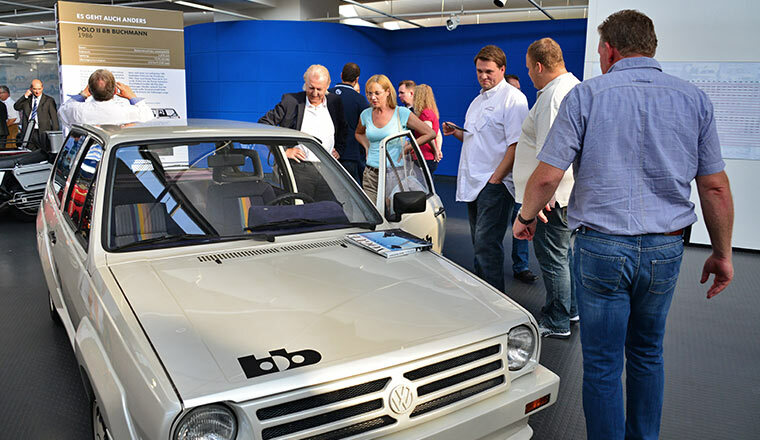 AutoMuseum Volkswagen was at the opening of the show, showcasing the original, a Polo from 1976, which awoke many memories among the participants. 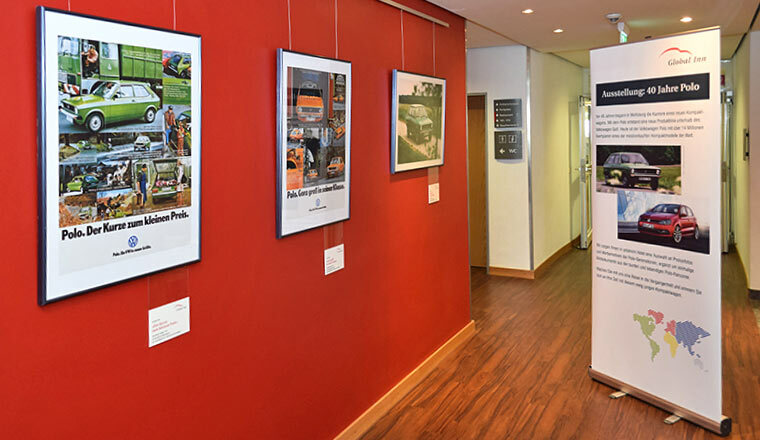 The exhibition can be seen at the Global Inn (www.globalinn.de) until the end of August. Admission is free. It's well worth a visit. Friends of the GTI at the AutoMuseum. 10 April 2015. 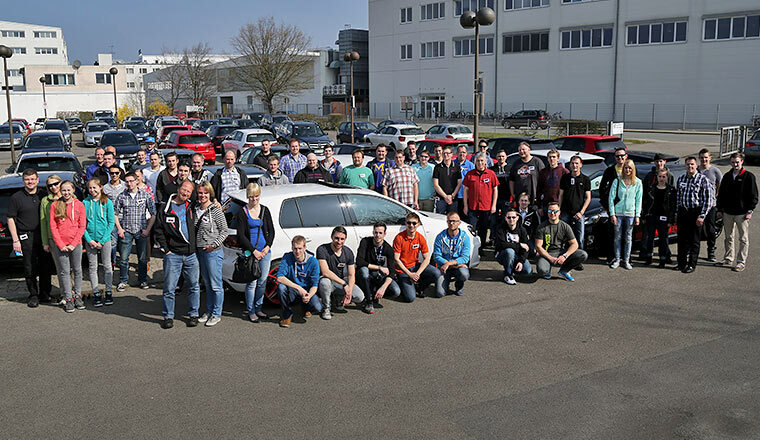 The Hamburg-based GTI fan club, (www.golf6GTI.com) called, and around 60 Golf GTI cars of the fifth, sixth and seventh generation rolled off to Wolfsburg. A friend of the club from Passau had the longest trip. 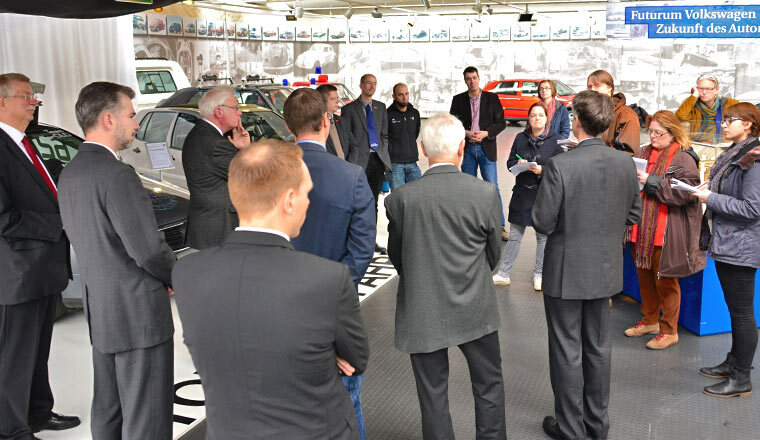 The day-long meeting was kicked off at the AutoMuseum, where not only coffee was on offer but also a spontaneous, in-depth explanation of the exhibits with a special focus on the Golf given by Eberhard Kittler. Then the motorcade was received at the factory – the host was no one less than "Strietzl" Stuck. The response was so overwhelming that the Friends of the GTI want to come back in 2016. Raid in the museum mobile. 9 April 2015. 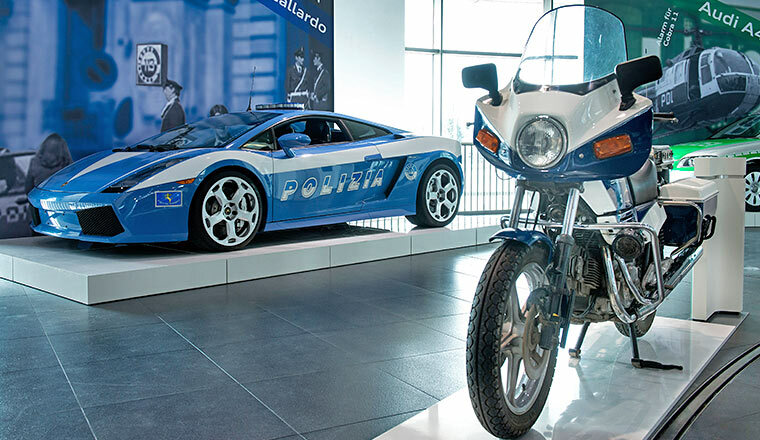 The museum mobile at the Audi site in Ingolstadt extended an invitation to the opening of the special exhibition: "Razzia" (Raid). 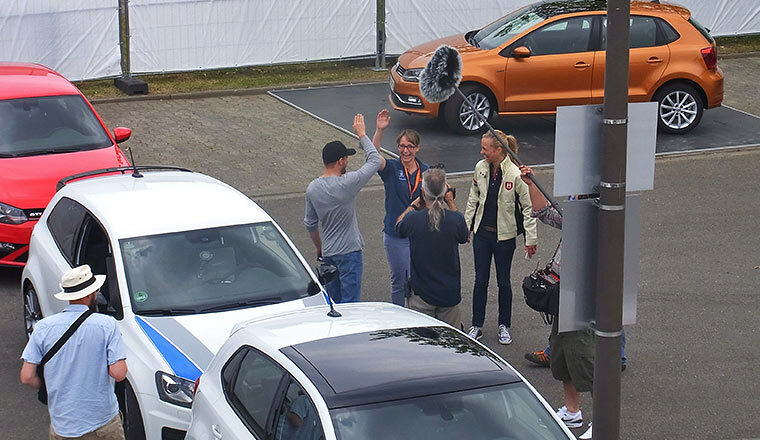 In the show, everything revolves around police cars – across all brands and way beyond the borders of Germany. 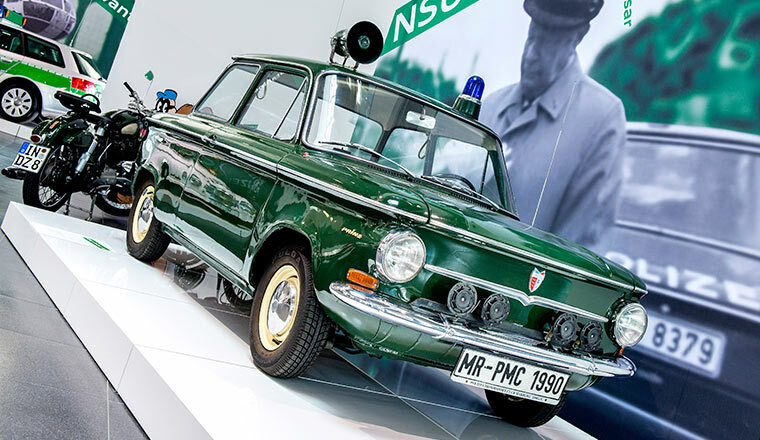 The 14 exhibits include classic cars of automotive police history such as the BMW ISAR 12, a Hanomag police van and the DKW 1000S. 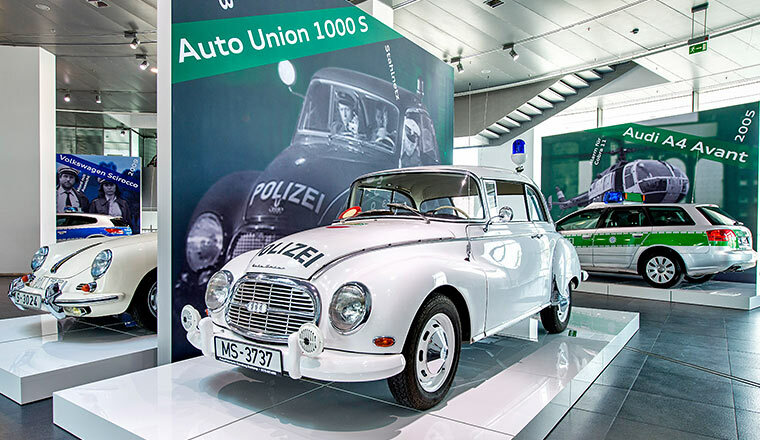 AutoMuseum Volkswagen has enriched the exhibition with its rare Hebmüller police cabriolet from 1949. Large screens evoke the use of police cars in the most famous and popular television series. Until 30 August, the visitors have the chance to walk the beat through the history of police cars. Creator of the Rovomobil at the AutoMuseum. 3 April 2015. 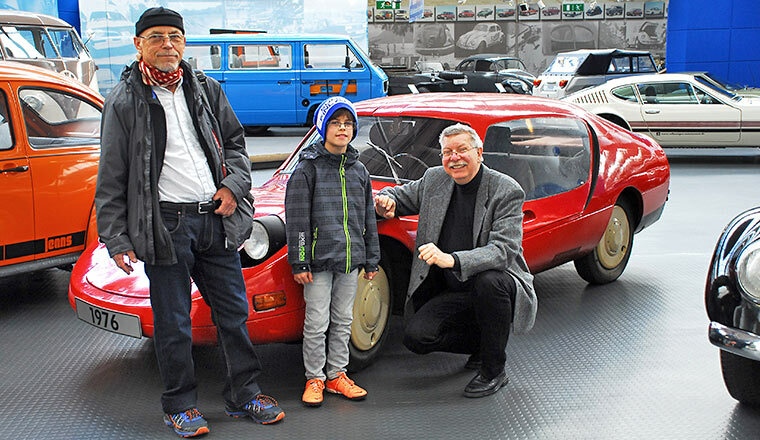 After years of abstinence, Dr Eberhardt Scharnowski, creator and donor of the 1976 Rovomobil, came to the Wolfsburg-based Museum along with his grandson Pierro. 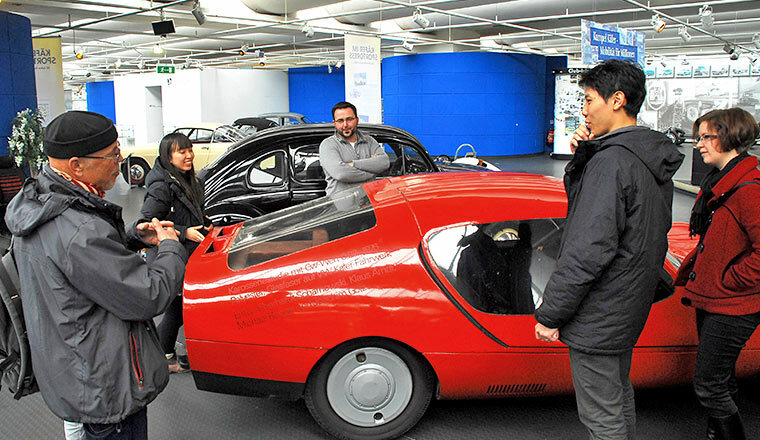 Two visitors from Singapore, Jonathan Lin and Hannah Lee, turned out to be students of aircraft construction, who had a lot of fun in a spontaneous discussion on the streamlined VW self-made sports car from the GDR with the well-known aerodynamic expert and book author. Saloon with an illustrious name. 25 - 29 March 2015. 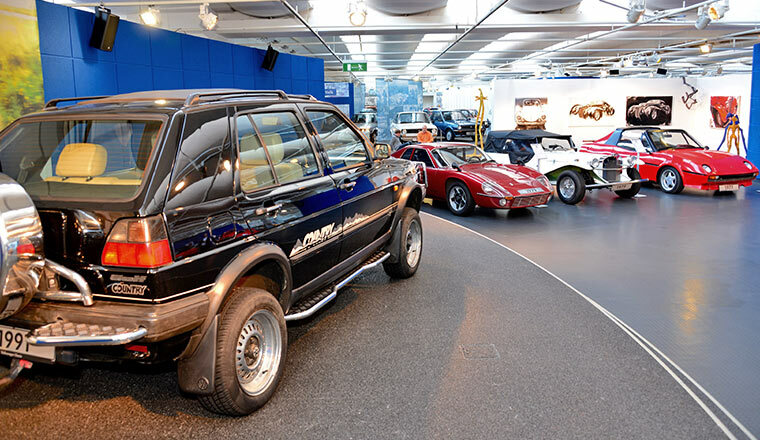 The AutoMuseum Volkswagen supported "Passat Kartei e. V." with a now rare exhibition piece for its presentation at the Retro Classics in Stuttgart: its Suriname red Santana GL5 with a high-torque five-cylinder engine. It was flanked by two other models of the same basic type, including a Santana 2000 built and sold in China only. 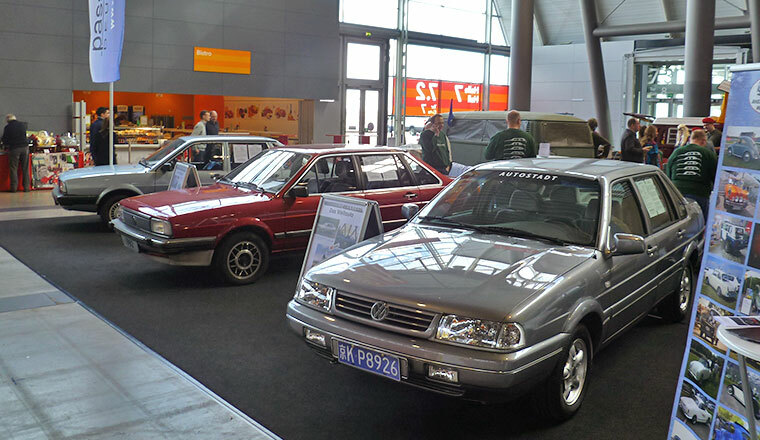 In Germany, the Santana was stopped 30 years ago and replaced by the almost identical Passat II notchback. In China, the famous Santana has always been a bestseller, in its last version as Santana 3000 – now replaced by the new compact Santana with transversely mounted engine. 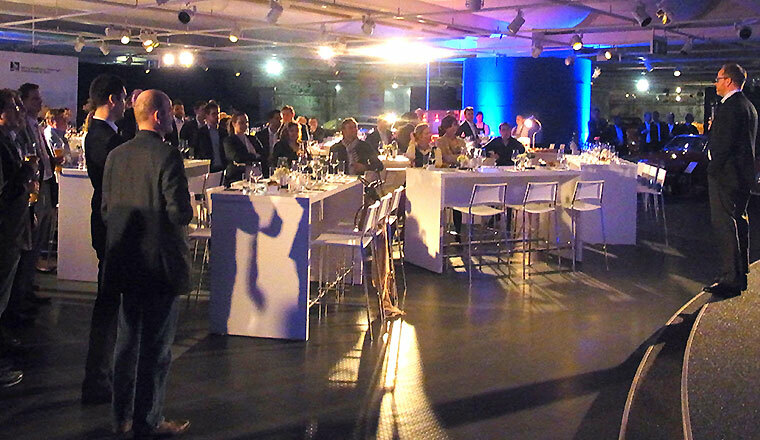 Volkswagen invited to Gala Diner in the context of the Open Days. 25 March 2015. 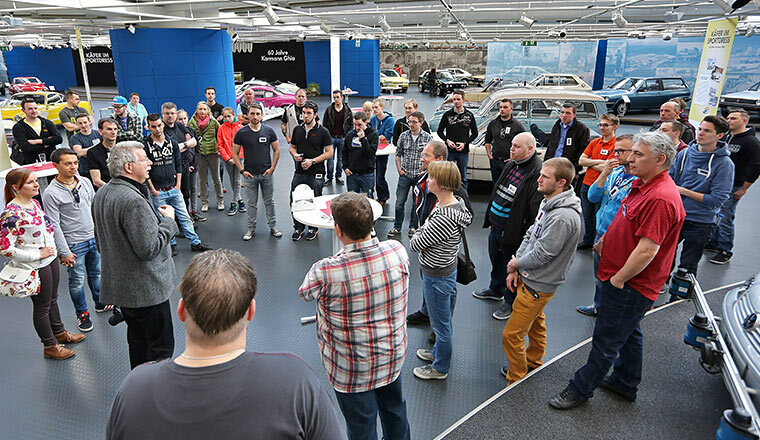 Once a year, Volkswagen invites selected employees from its American, Canadian and Mexican importers and dealers to what are called the "Open Days". There guests can view new Volkswagen models shortly before production maturity. 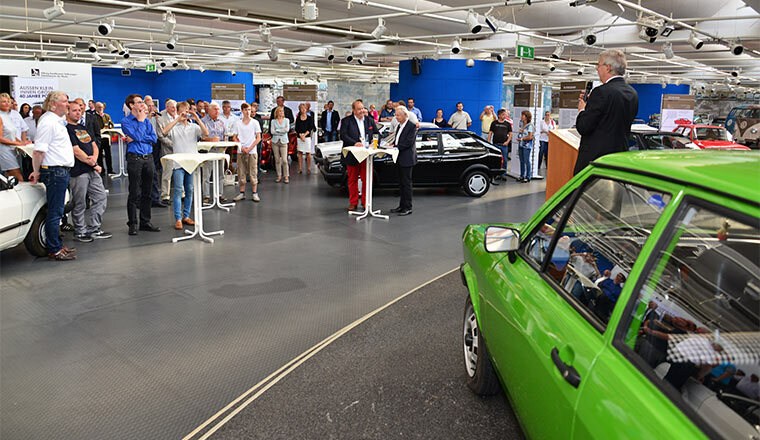 The employees then shared their impressions with colleagues during a gala evening in the Volkswagen AutoMuseum – and also took a look at the roots of the brand. 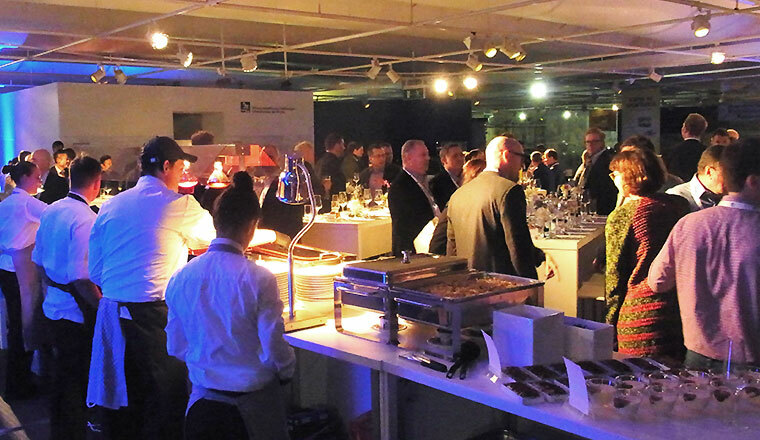 The visitors were well catered for with sumptuous refreshments. 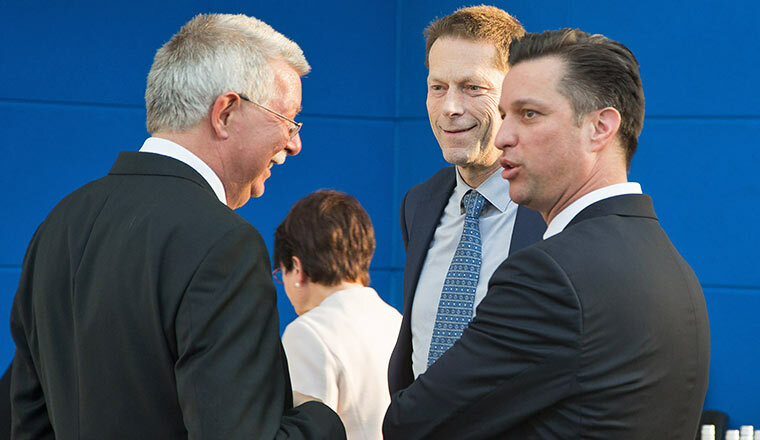 Among them were Michael Horn, President and CEO of Volkswagen Group of America, and Ludger Fretzen, Head of Passenger Cars Brand Sales for Volkswagen North America. 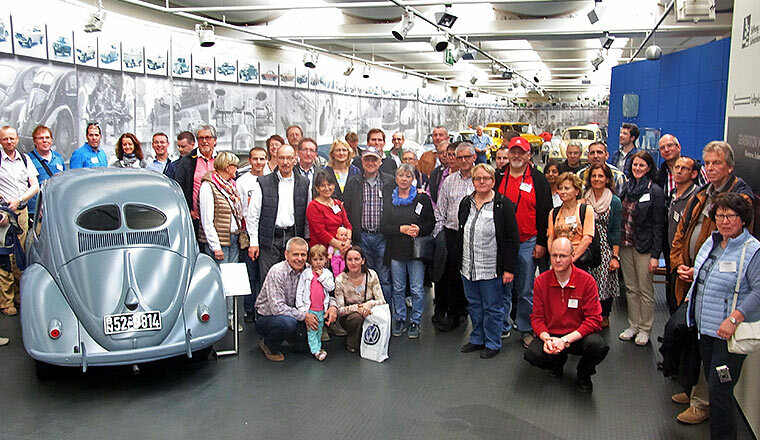 Wuppertal Golf Club visits AutoMuseum. 21 March 2015. 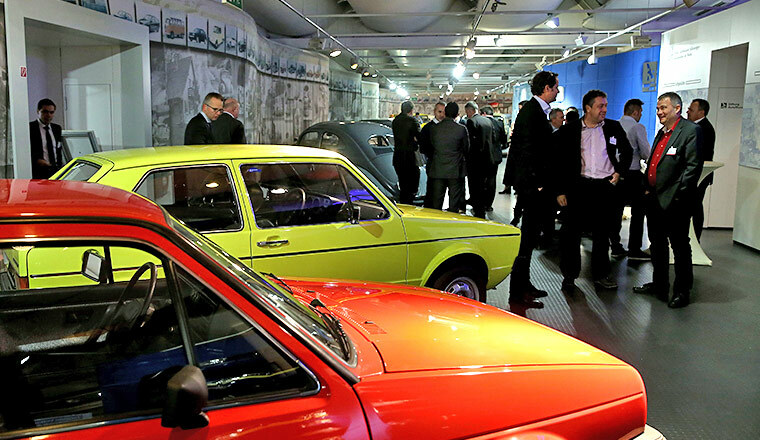 On the occasion of its 15th anniversary, the Wuppertal Golf Club visited the Volkswagen AutoMuseum. 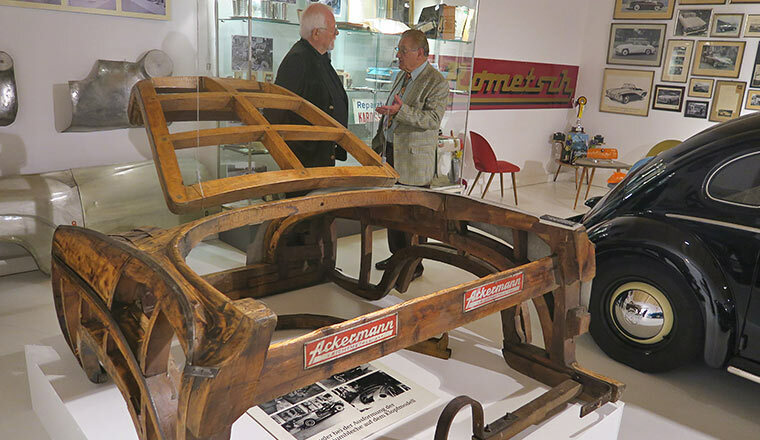 Eberhard Kittler, Chairman of the AutoMuseum, congratulated them with a tailor-made tour of the exhibition. 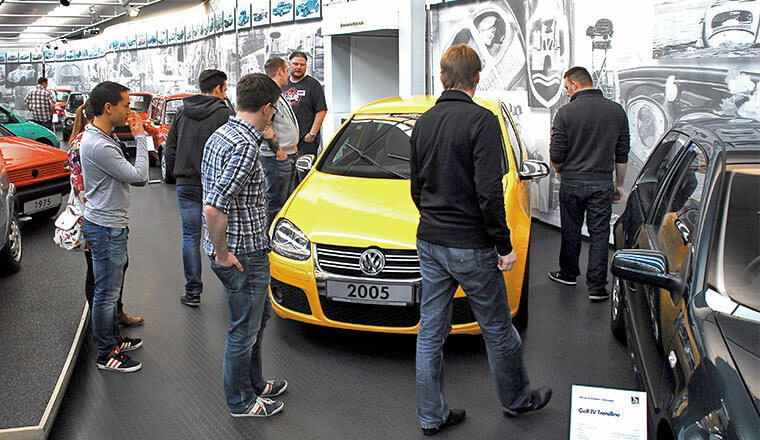 The tour not only included the Golf but also covered the extremely exciting product history of Volkswagen. The fans were visibly interested and enthusiastic and of course a group photo around the Golf could not be passed up at the end. 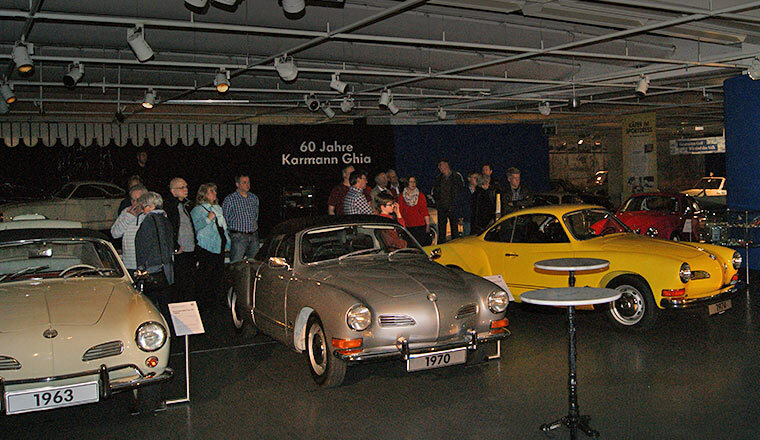 Members' evening of Karmann Ghia IG Südheide at the AutoMuseum. 20 March 2015. 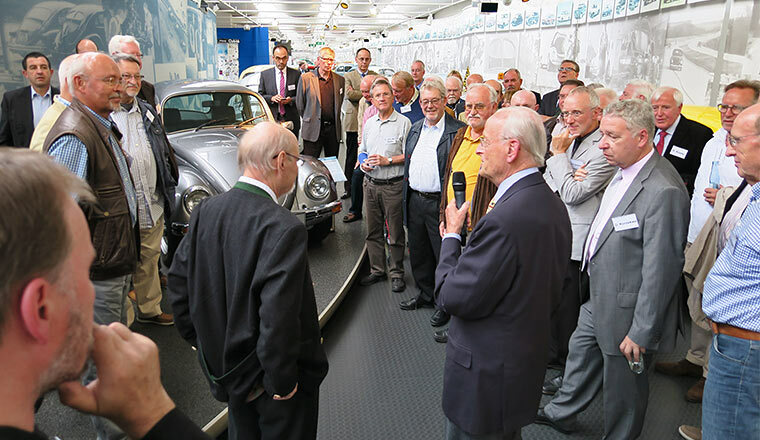 The Board of Management of Karmann Ghia IG Südheide invited its members on the occasion of the special exhibition to commemorate the 60th anniversary of the Karmann Ghia at the Volkswagen AutoMuseum. Tobias Ludwig, co-initiator of the exhibition, introduced the members to the exhibits and the participants listened attentively. 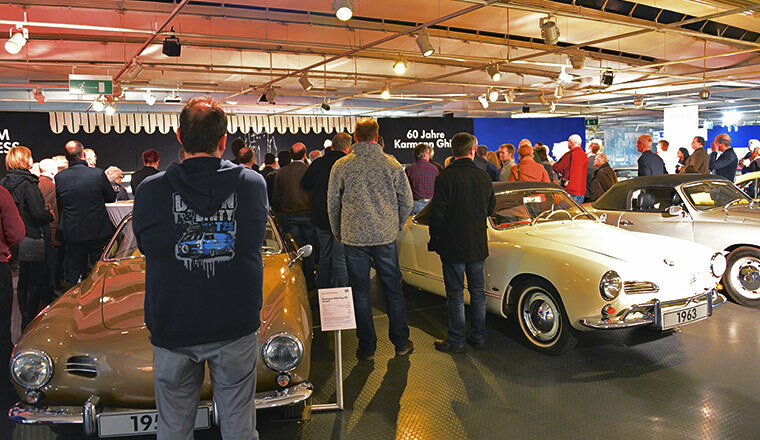 Afterwards, the 40 guests talked shop in the exhibition and during the country-style buffet about their hobby, the Karmann Ghia. 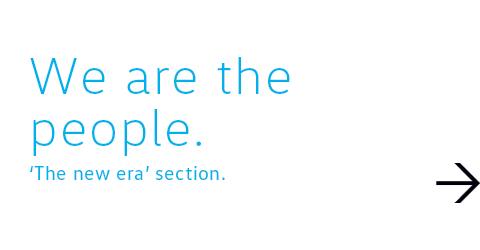 30 years – 30 models in both senses of the word. 19 /21 March 2015. 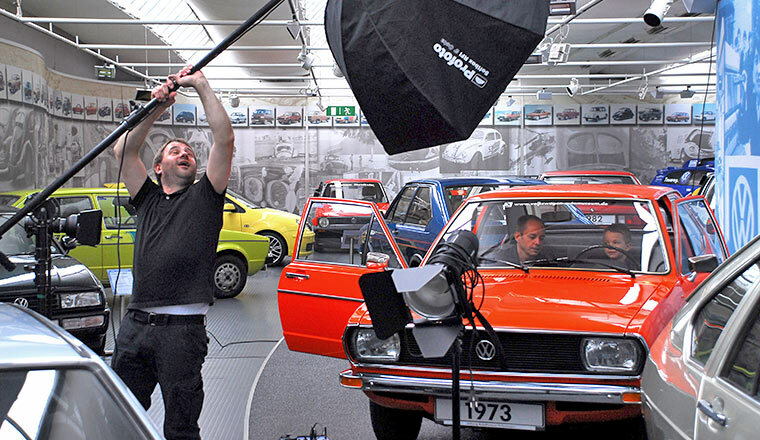 During these two days, 30 employees of Volkswagen AG used the opportunity to have their photographs taken next to their favourite Volkswagen classic car by professional photographers. The participants and the photographers visibly enjoyed choosing the motifs. The result was 30 portraits next to 30 different exhibits which will be on show as part of the anniversary exhibition celebrating 30 years of the AutoMuseum and which will take place at the exhibition from 24 April to 12 July 2015. 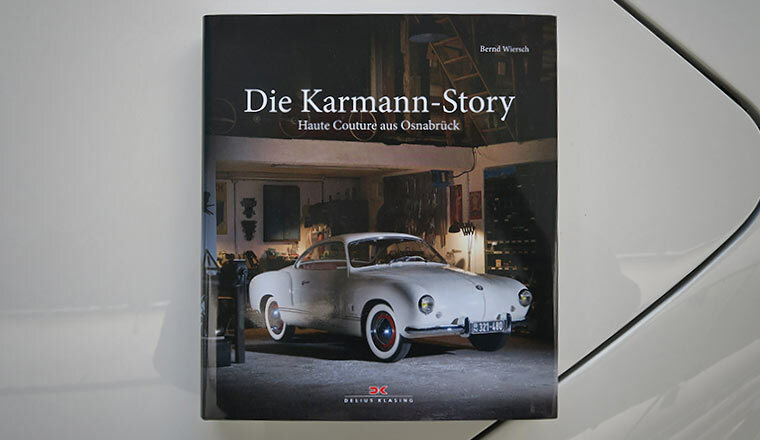 Private story with the Karmann Ghia. 16 March 2015. 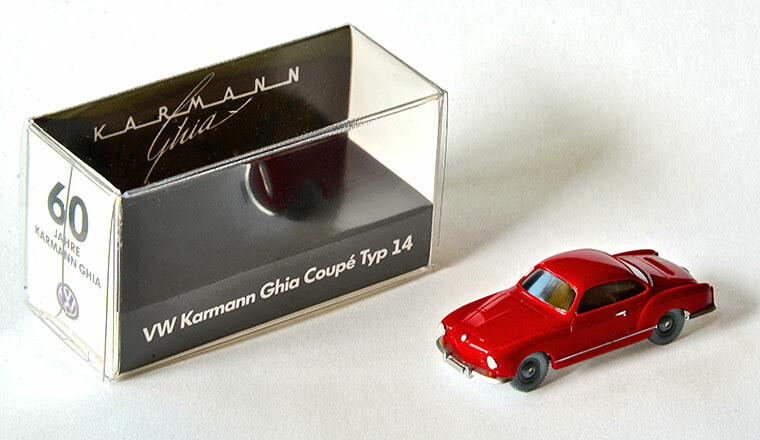 Inspired by the special exhibition "60 years of Karmann Ghia", visitor W.E. Zander related his personal experience. 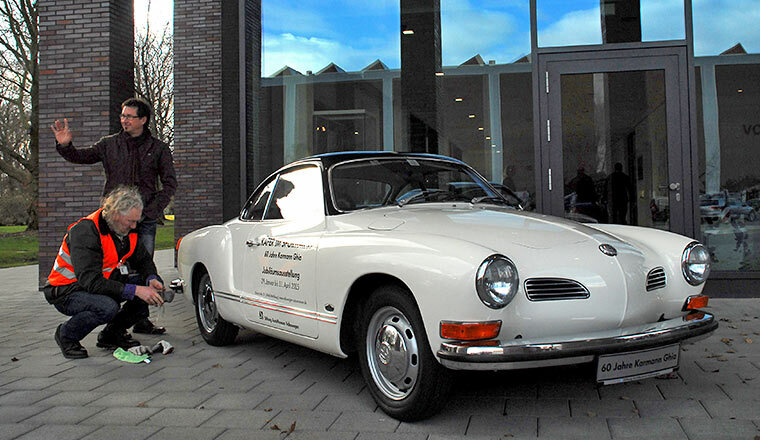 His boss, head of the Wolfsburg Town Hall, bought a new Karmann Ghia almost every year. 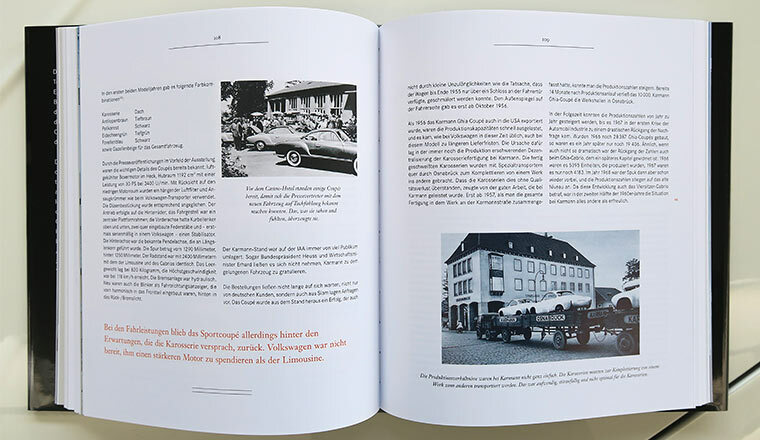 In 1965, the two men went on a trip to Osnabrück to take receipt of the boss's new coupé. However, the paint on the roof was damaged. 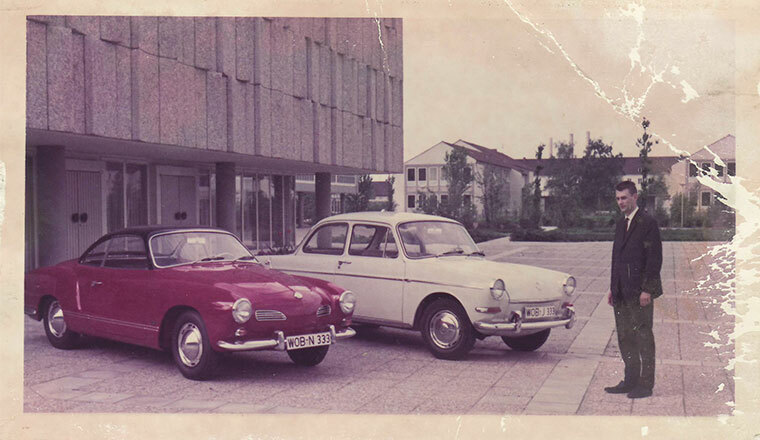 In response, Karmann employees fitted a new body to the chassis on the same day. The two men from Wolfsburg waited to return home in the evening in the brand-new car. 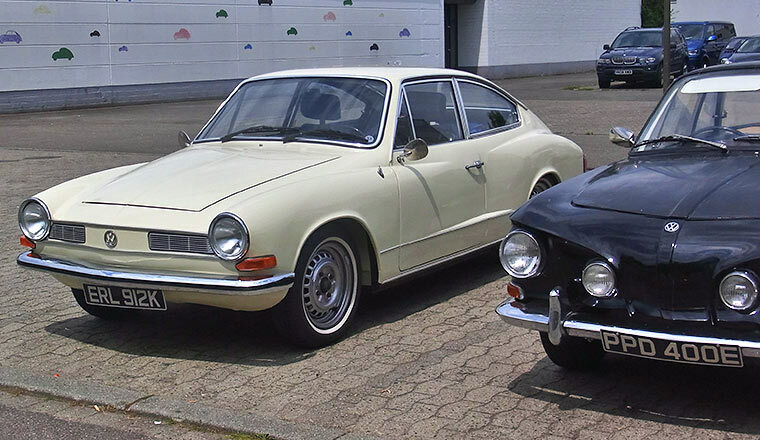 But the next morning, the Karmann was not to be opened as the proud owner had locked the car from the inside with the convenience locking. As the entire set of keys had remained in the ignition lock while the body was being replaced, the new body had different door locks... They had simply forgotten to exchange the keys. Quite by chance, another person from Wolfsburg was in Osnabrück on that day and he brought the right keys back with him. 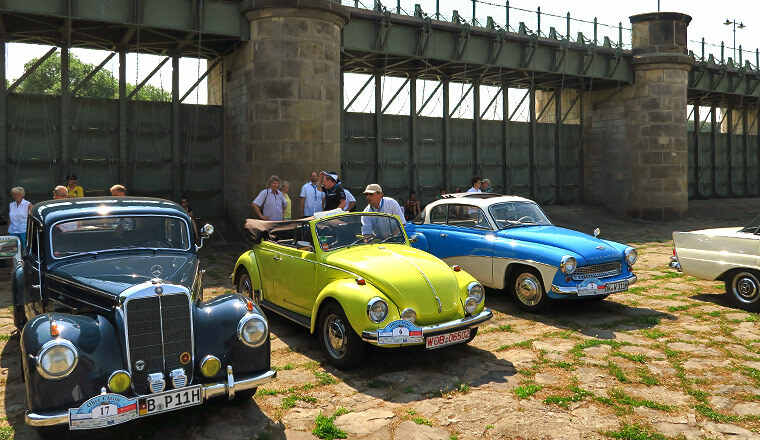 The driving pleasure with the new Karmann was back again - a photo in front of the outer wall of the hall of mirrors is a memento of the occasion. 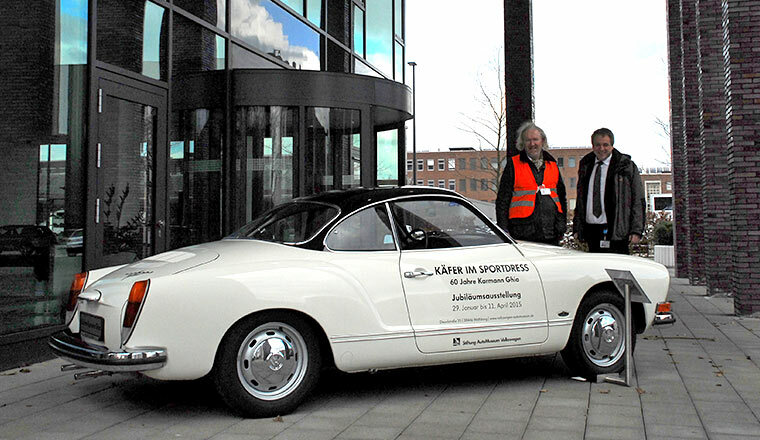 Karmann Ghia advertises special exhibition. 2 March 2015. 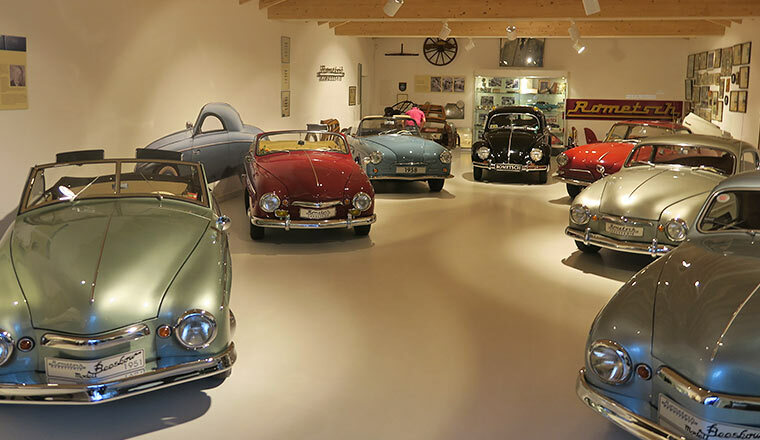 The Volkswagen AutoMuseum Foundation is currently running a special exhibition to commemorate the 60th anniversary of the start of the Karmann Ghia production. 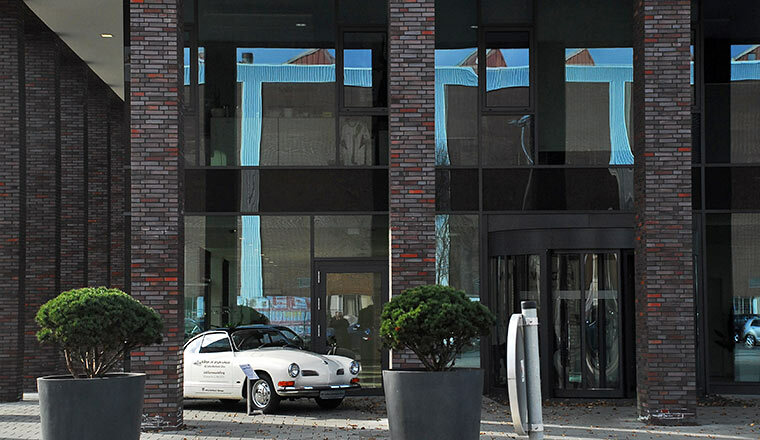 To act as a reminder of this at the Wolfsburg plant, a 1972 example of the legendary Karmann Ghia Type 14 has been positioned since Monday 2 March in front of the new BT 10 administration tower. 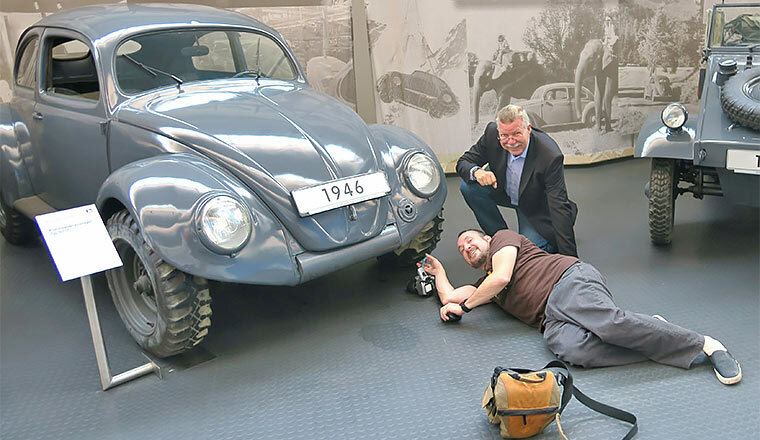 Museum employee Eckberth von Witzleben, production staff member Andreas Borrmann and electric vehicle specialist Tobias Ludwig moved the car into the correct position agreed with plant security. 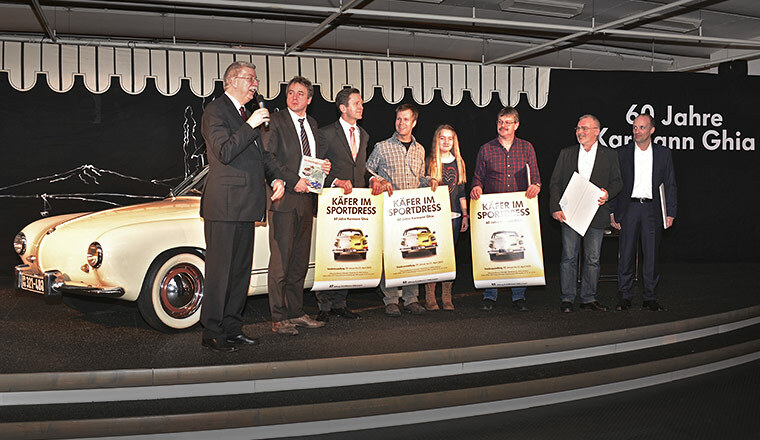 Opening "60 years of Karmann Ghia" exhibition. 29 January 2015. 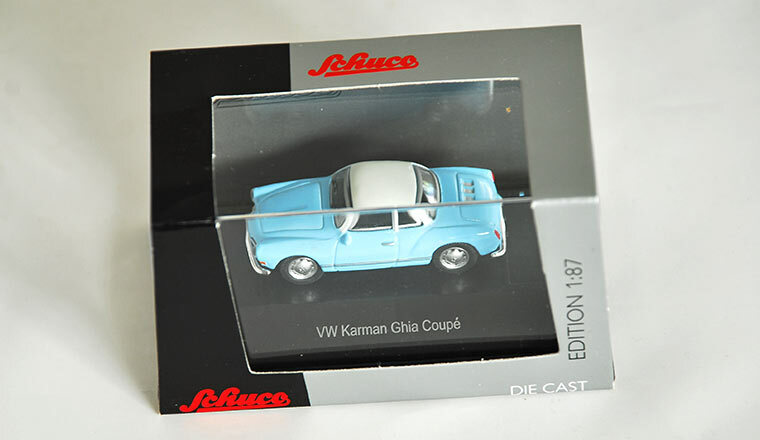 In summer 1955, 60 years ago, the brand new Karmann Ghia was presented to the international public at the Casino Hotel in Georgsmarienhütte near Osnabrück in Germany. 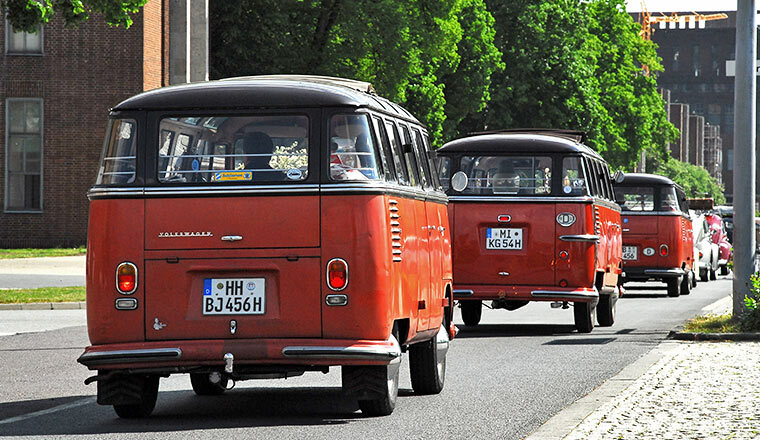 It was to remain in the Volkswagen fleet until 1974. 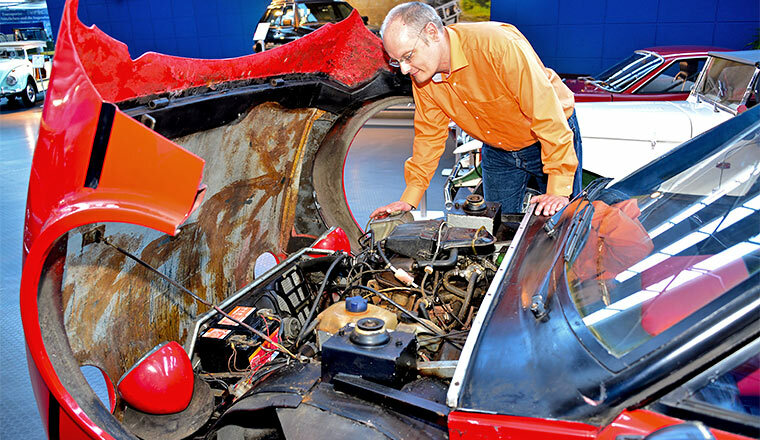 The AutoMuseum is dedicating a major special exhibition to the car and its creators. The exhibition opened on 29 January. 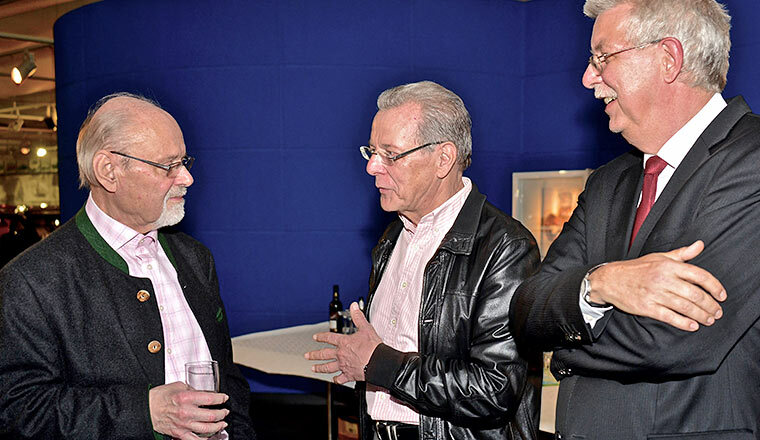 About 90 guests accepted the invitation to attend the opening of the exhibition, among them contemporaries and club enthusiasts around Tobias Ludwig, without whom this collection of exhibits would not have been possible. 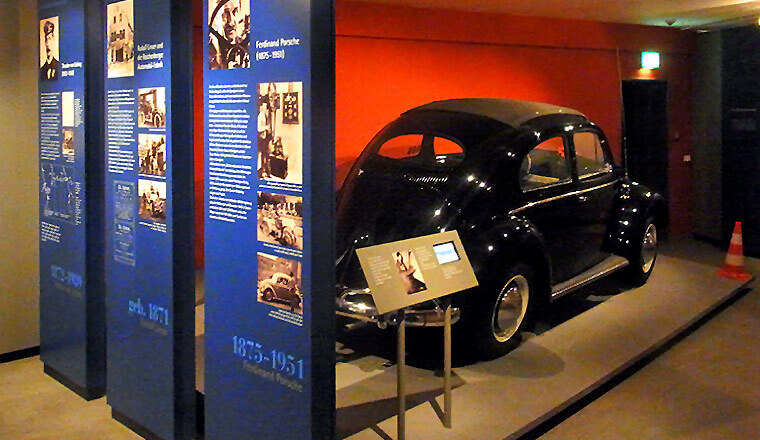 The 21 cars on exhibition trace the exceptional history of the "Beetle in sports dress" as well as its siblings built by Karmann. 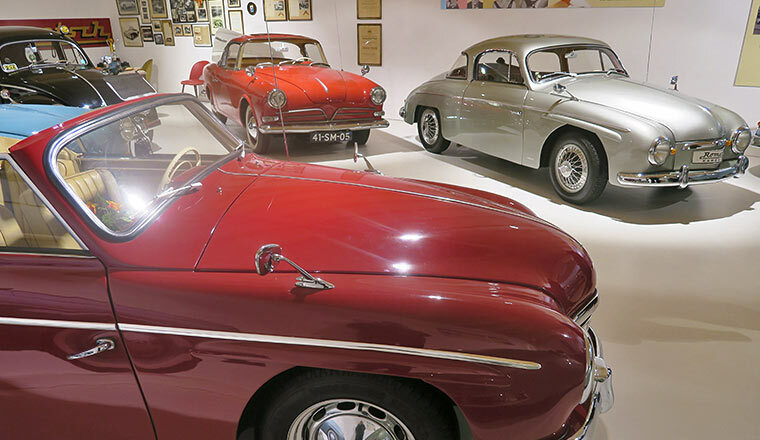 Six thematic islands present the 1953 prototype as well as original cars from 1957 through to 1974, including the Brazilian versions, the "large Karmann" type 34, three one-off conversions, unique power cars, prototypes and examples from the Karmann history which had nothing to do with the Volkswagen Group. 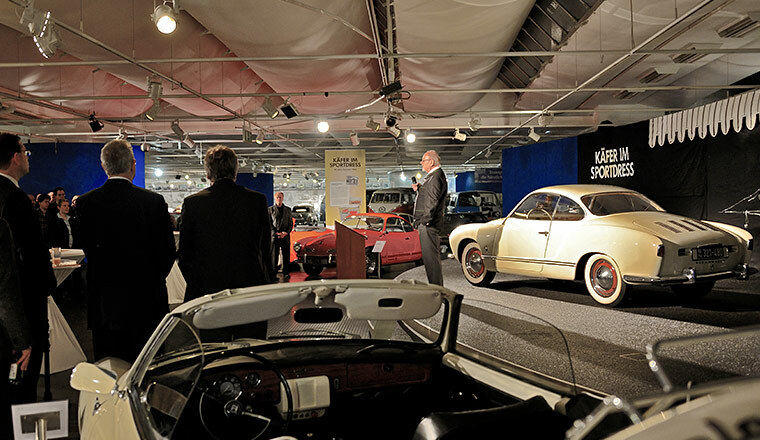 Specialist conference invites participants to the AutoMuseum. 27 January 2015. 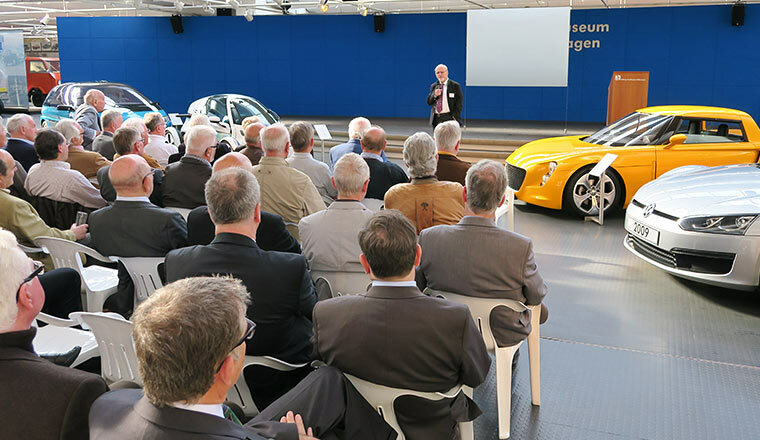 The magazines ATZ/MTZ invited to a specialist conference to Wolfsburg this year. 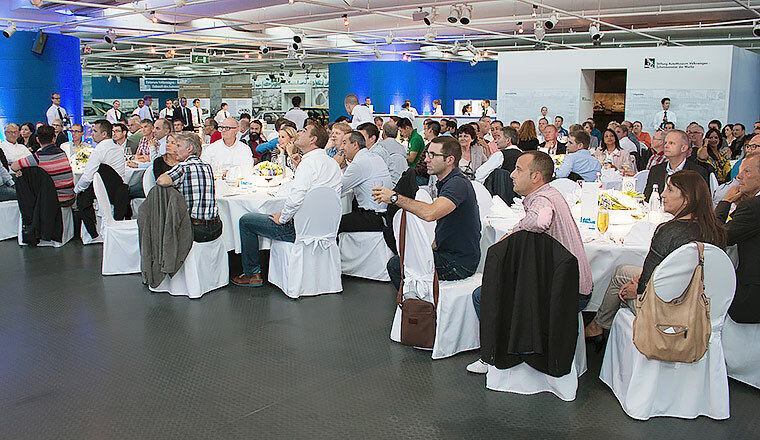 Around 150 participants came to the gala dinner at the AutoMuseum Volkswagen after they heard highly interesting expert lectures. Dr. Heinz-Jakob Neußer, member of the Board of Management of the Volkswagen Brand with responsibility for development, hold the dinner speech. 20 January 2015. 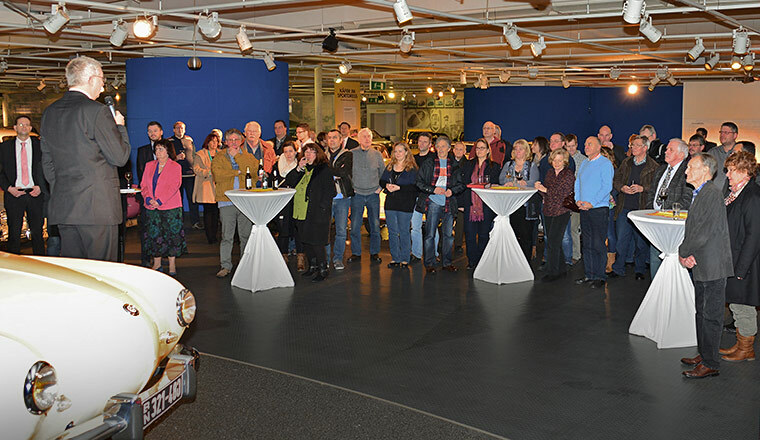 As this time every year, the AutoMuseum invited its promoters and friends to a New Year's reception. A review of 2014 provided a positive picture. 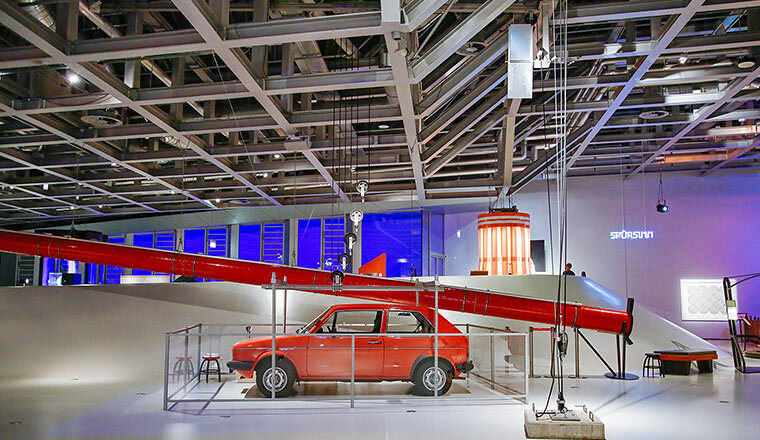 Last year, the Museum received 20,119 visitors, which was the same figure as in the era before the start of the Autostadt in 2001. The four special exhibitions and the up-to-date website generated more publicity and contributed to this success. 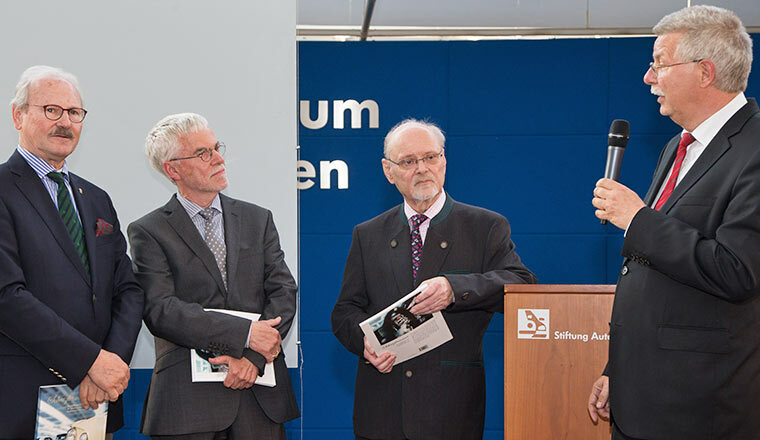 Dr Franz-Josef Paefgen, Chairman of the Advisory Board, assured the about 90 guests that the Museum would continue to develop its web presence systematically. Special show for rally winner of 1960. 15 January 2015. Ninety-year-old Hans Wehner and his wife Barbara came all the way from Wiesbaden to open the small special show to mark the 55th anniversary of the victorious Tour d’Europe. Gregor Schulz, lender of the gulf-blue rally car and editor of the magazine Oldtimer-Markt, together with Eberhard Kittler interviewed the successful former racing driver on his years spent at high speeds with Beetle & Co. Rounding off the exhibition are numerous trophies, posters, photos, newspaper cuttings and other memorabilia together with a slide show of selected historical motifs. 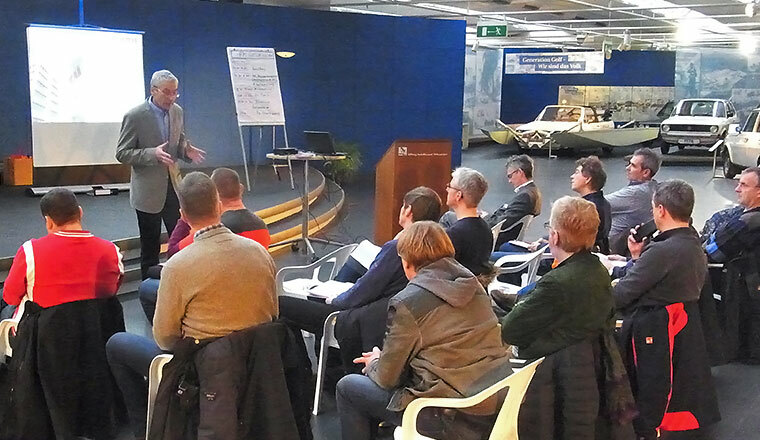 Seminar for GTÜ inspectors in the Museum. January 10 and 11, 2015. 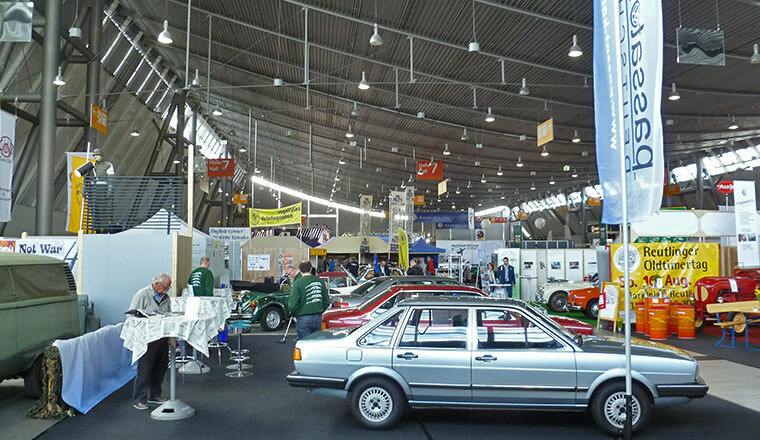 The German Organisation for Technical Monitoring (Gesellschaft für Technische Überwachung, GTÜ), an association of certified technical inspectors, tests and evaluates vehicles and offers its own classic car service (www.gtue-oldtimerservice.de). 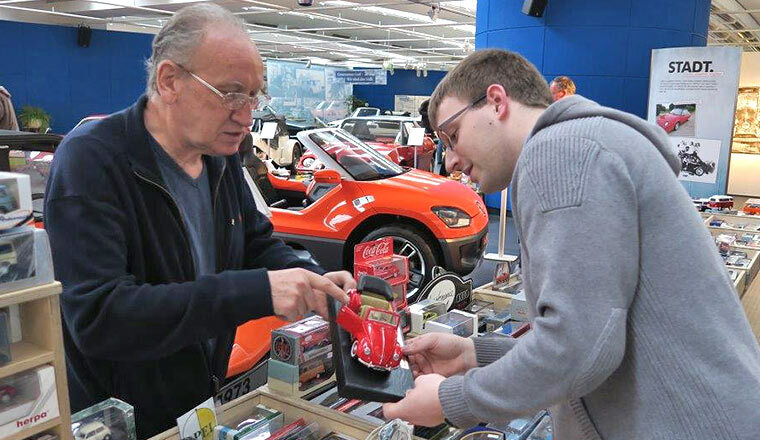 On the second weekend in 2015, 35 inspectors came to the AutoMuseum to attend a workshop on the identification of classic cars using the practical example of the Beetle under the supervision of vehicle expert Peter Deuschle. Proof of originality and valuations are becoming an increasingly important topic as the prices of classic cars rise. 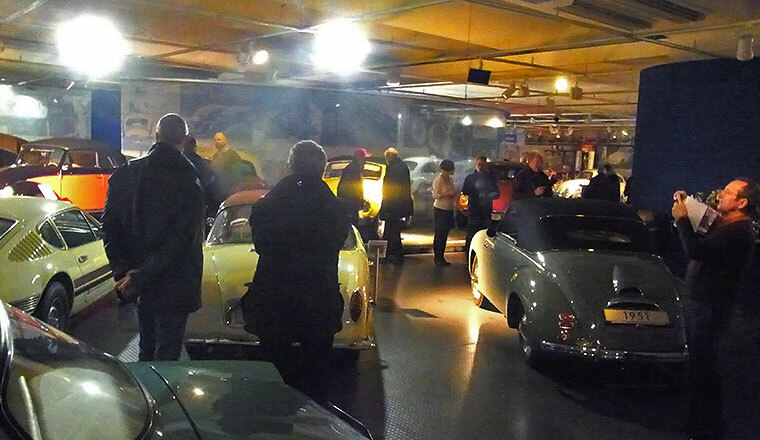 Porsche Enthusiasts Evening in the Museum. January 9, 2015. The greater Wolfsburg-Braunschweig (Brunswick) area is a well-known paradise for friends of the sports car manufacturer based in Zuffenhausen. 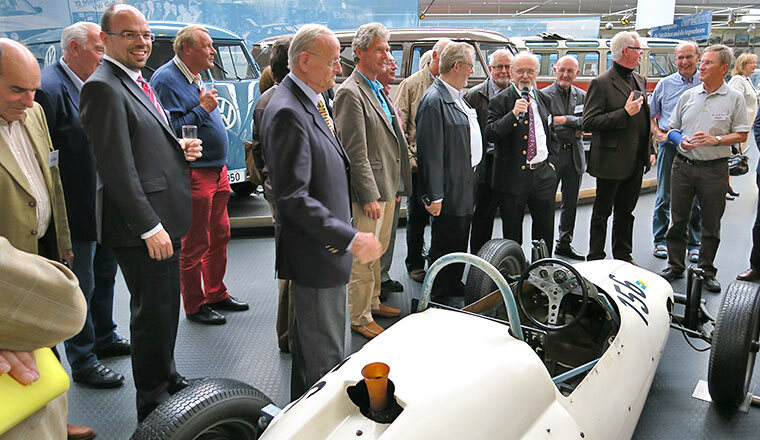 The Porsche Regulars' Table in Braunschweig played host to the first meeting in the AutoMuseum in 2015, followed by a tour of Volkswagen's vehicle restoration workshops in Wolfsburg. 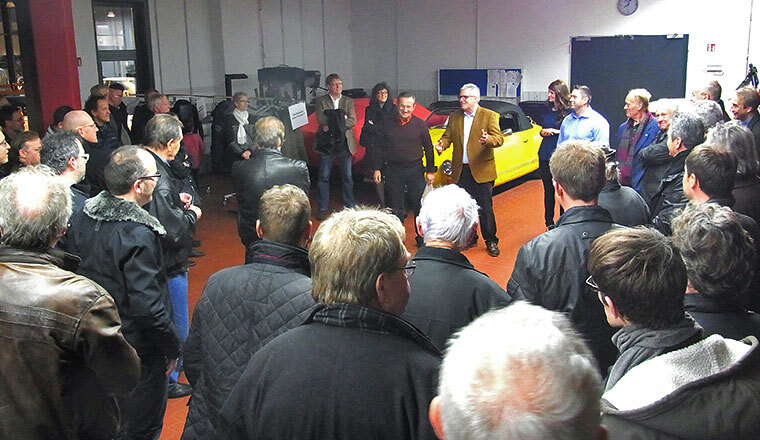 Amazingly, 80 Porsche fans turned up on Friday evening to view the "Heralds of Unity" exhibition which will soon be closing. They also received an overview of the Museum's activities in 2015. 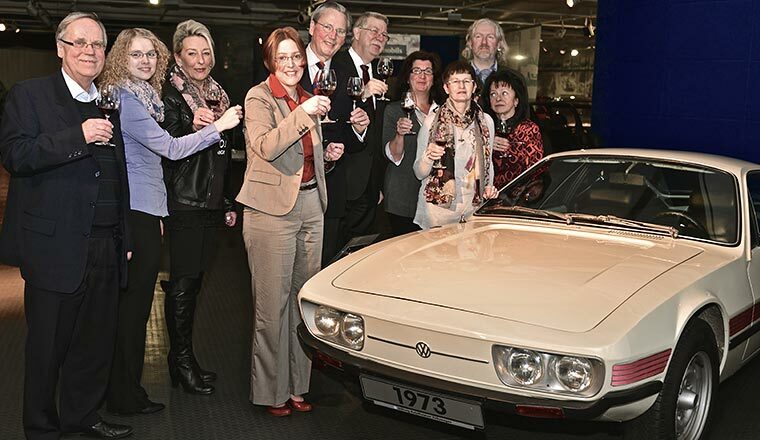 What they rightly criticised: the Museum exhibition failed to show a VW Porsche 914. We are working on it - although the depot has two of these cars, they are not in good condition.